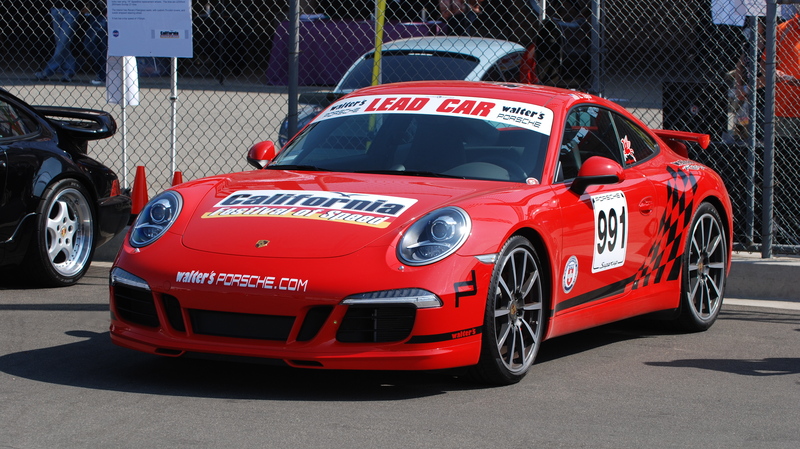 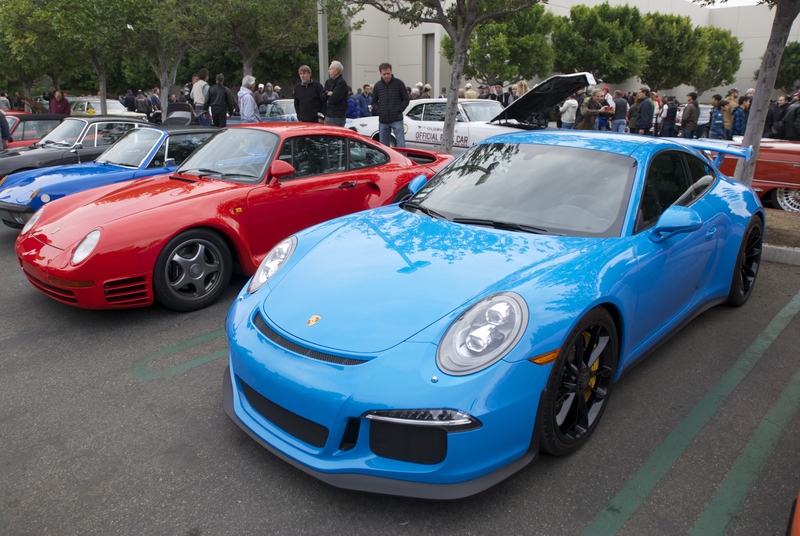 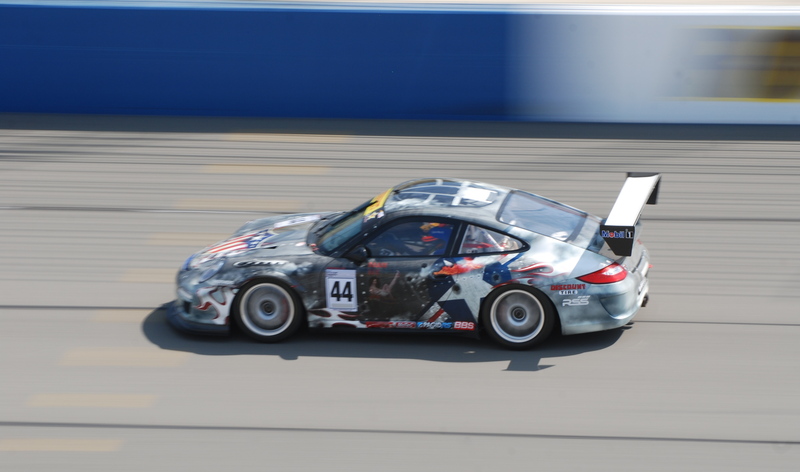 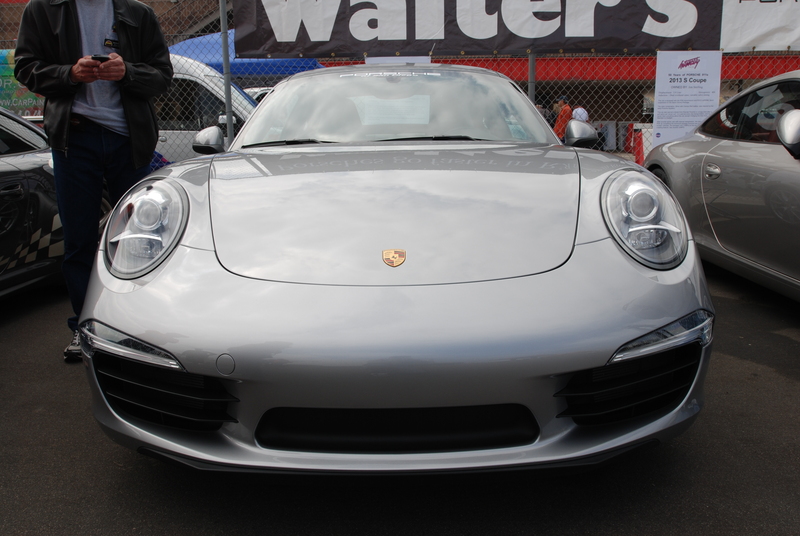 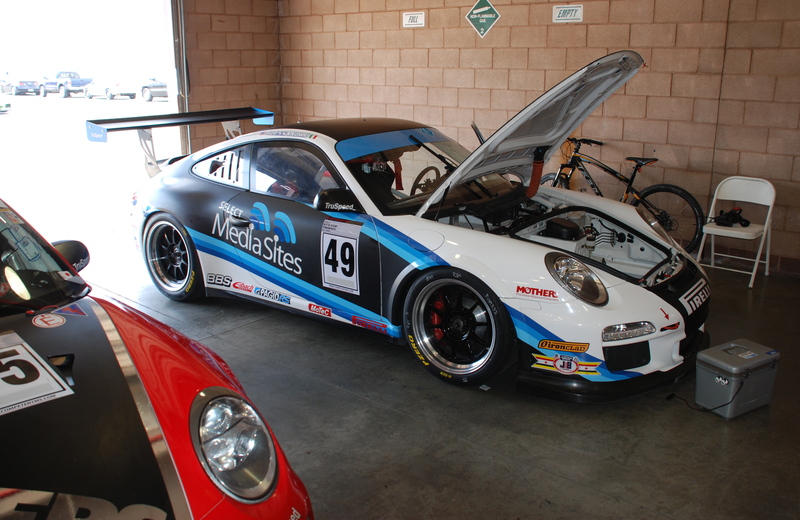 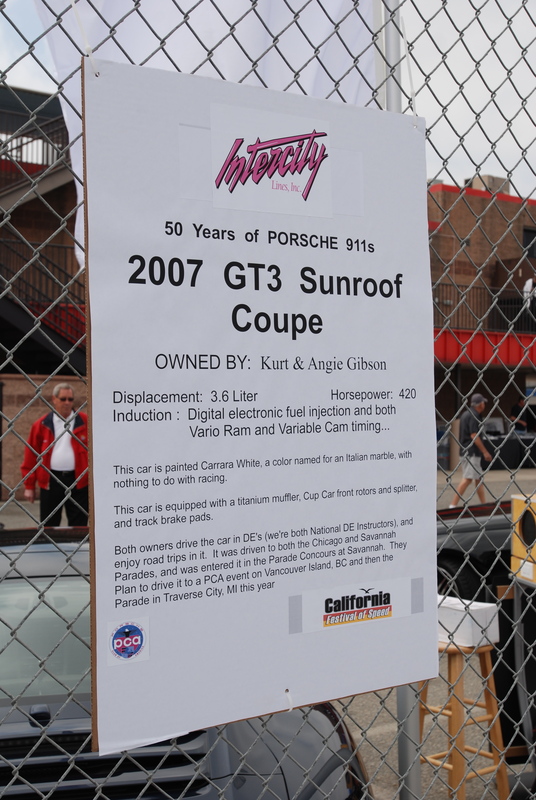 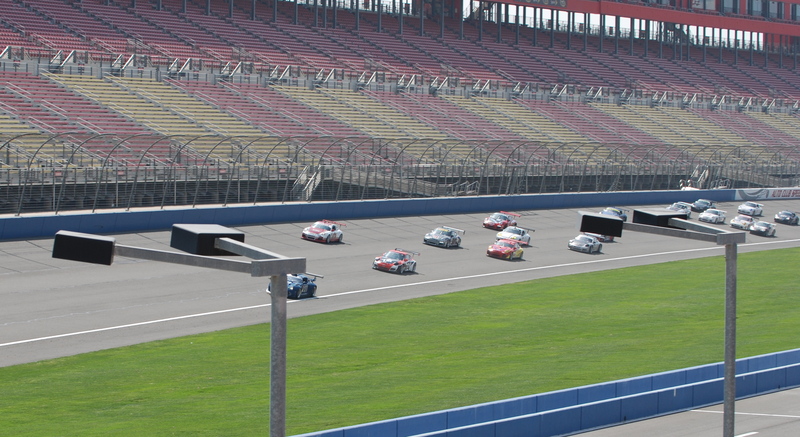 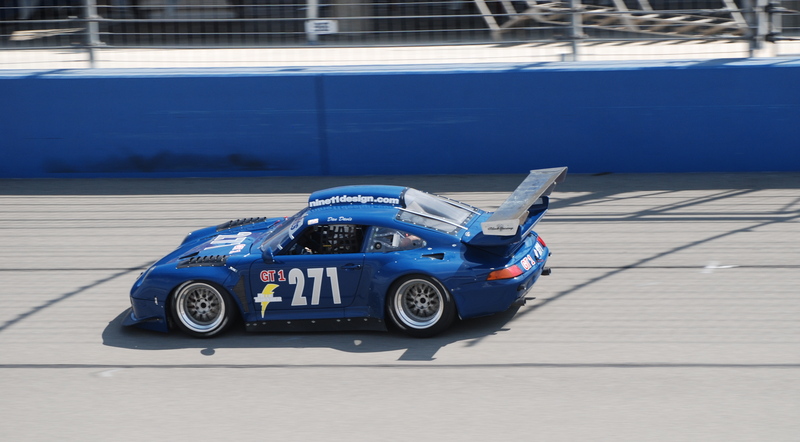 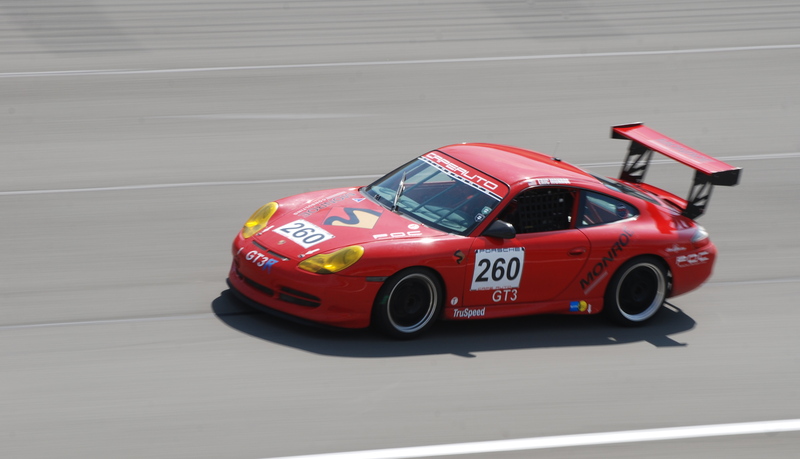 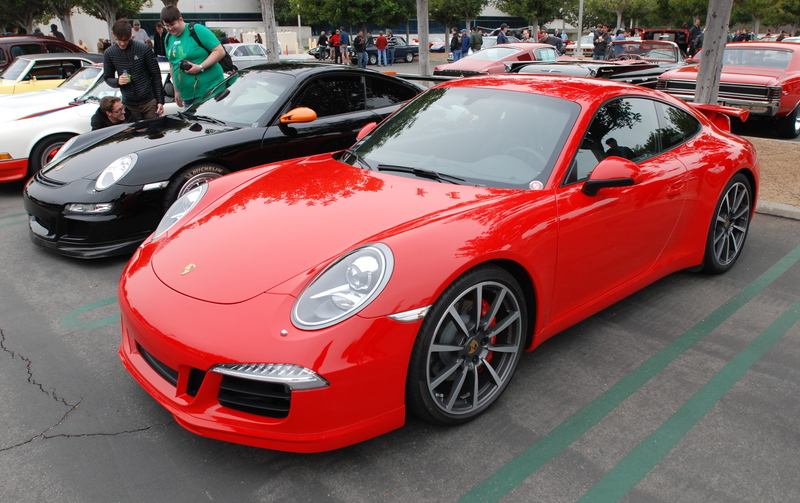 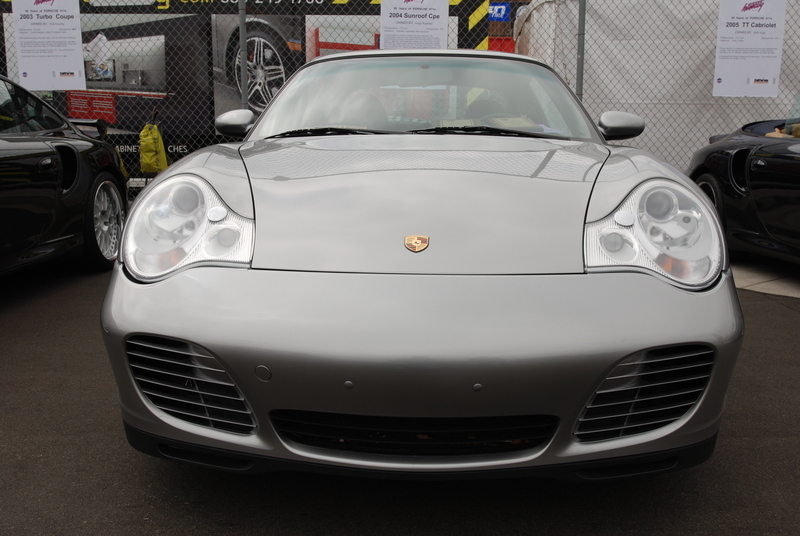 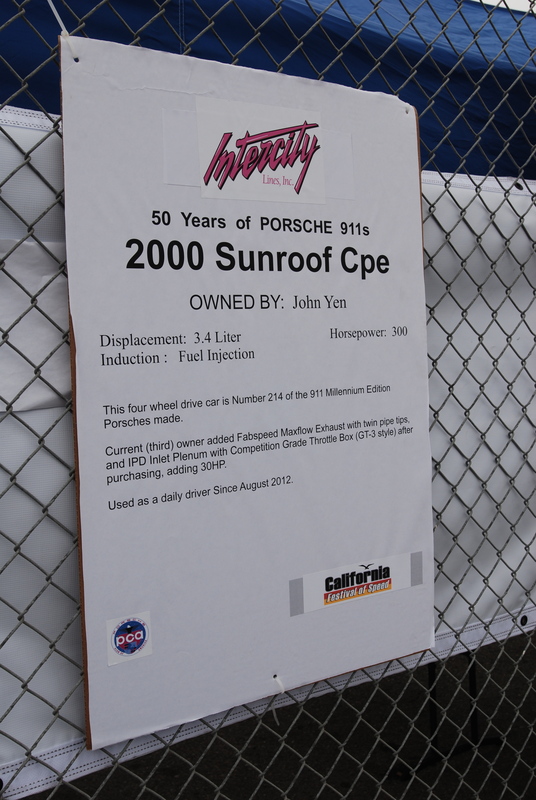 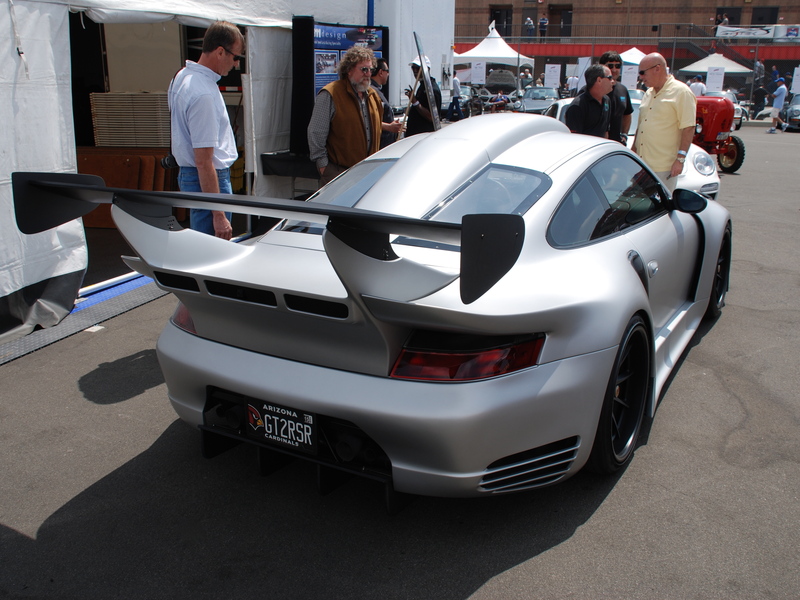 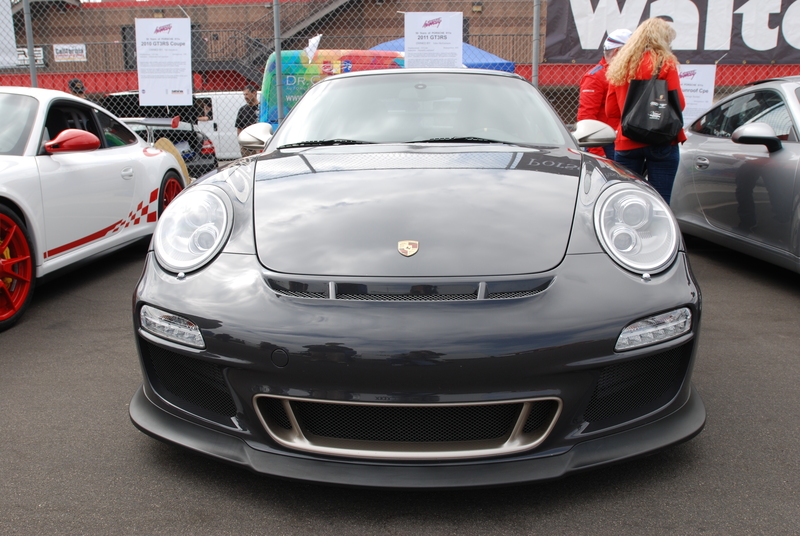 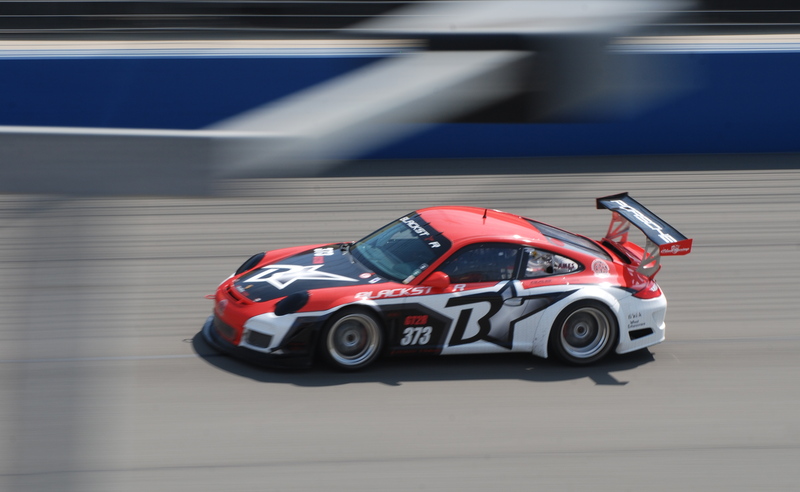 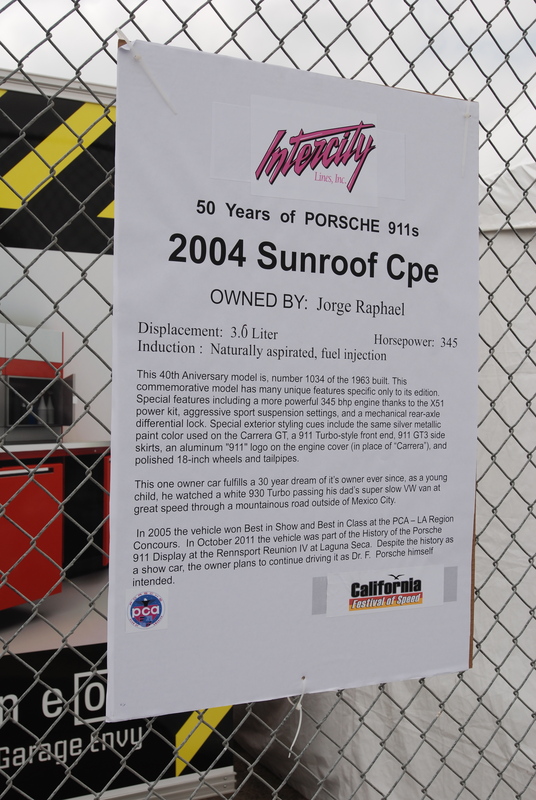 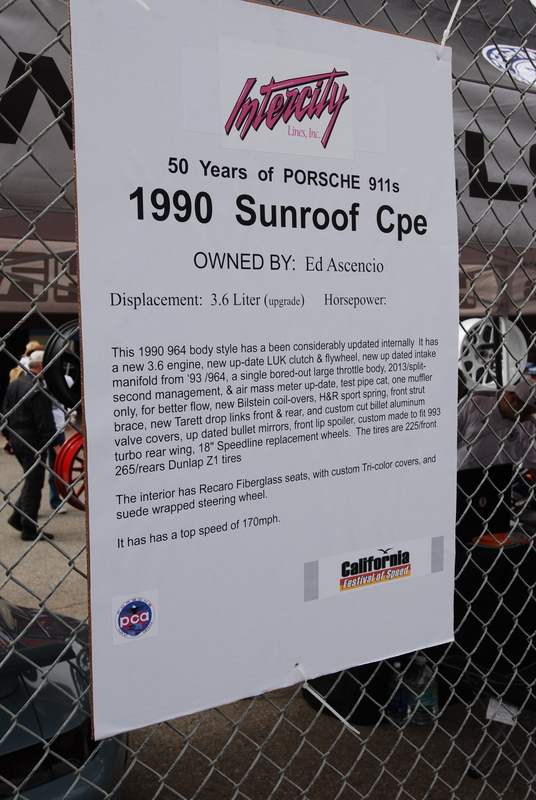 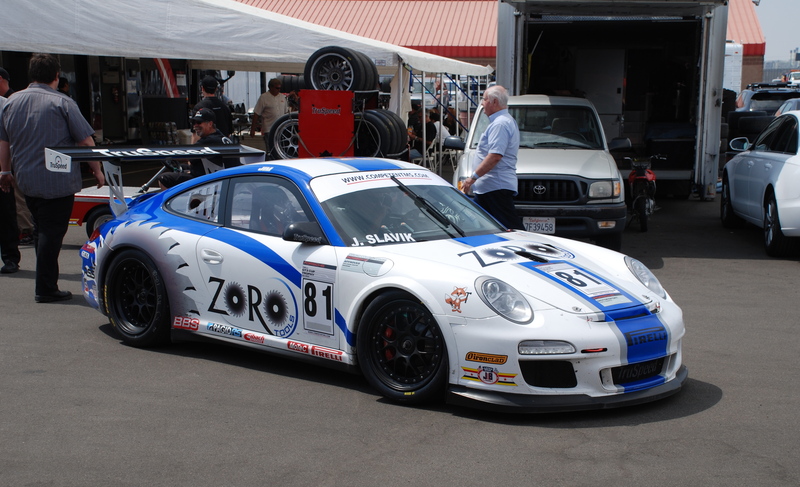 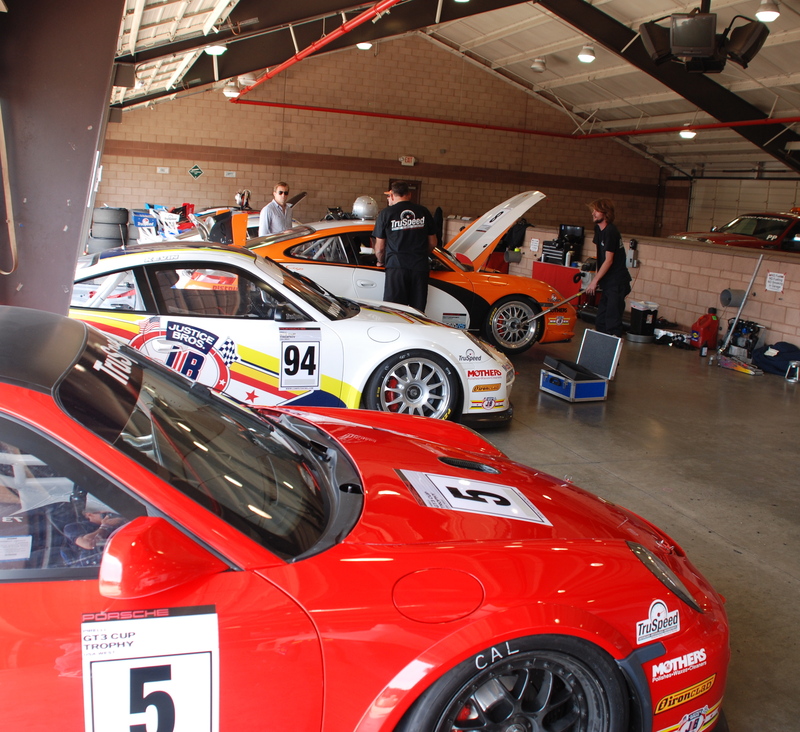 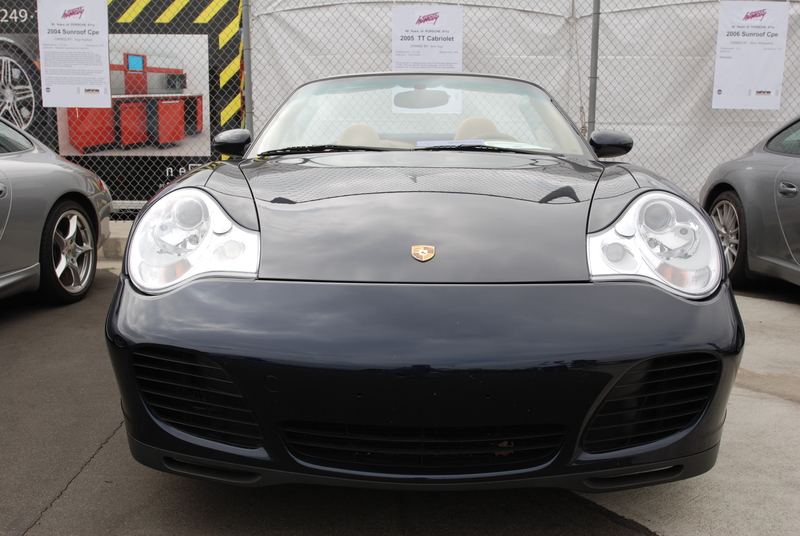 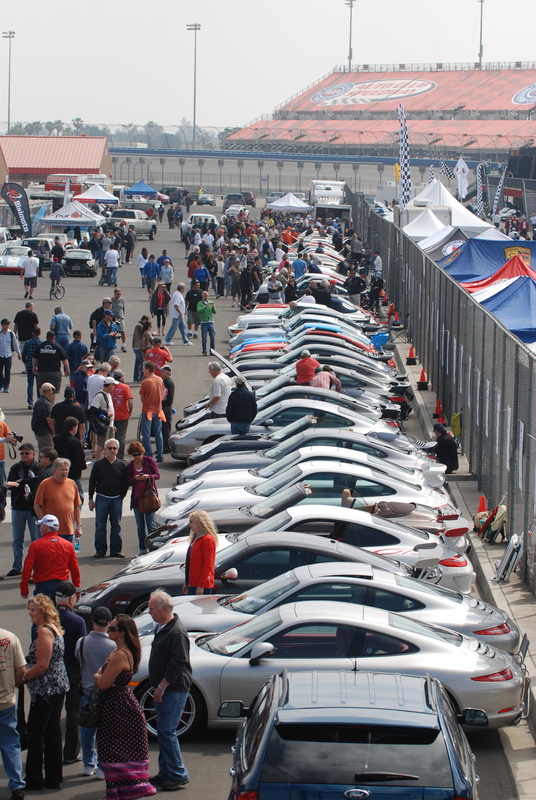 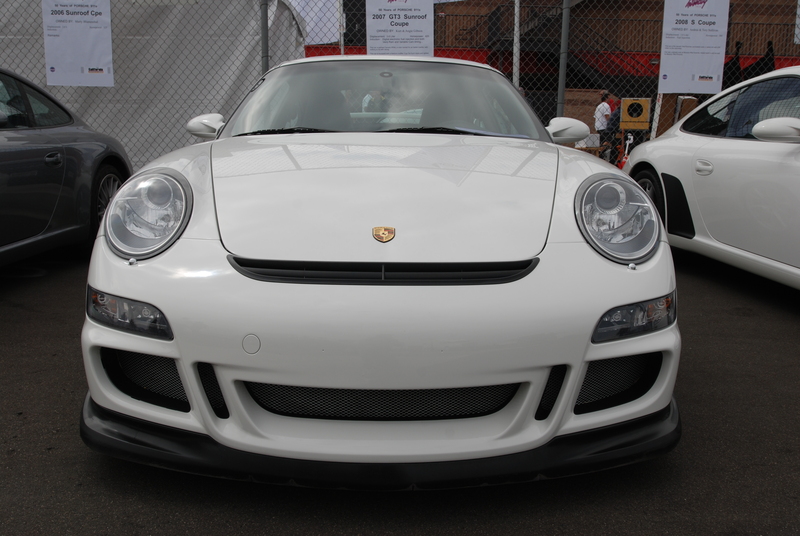 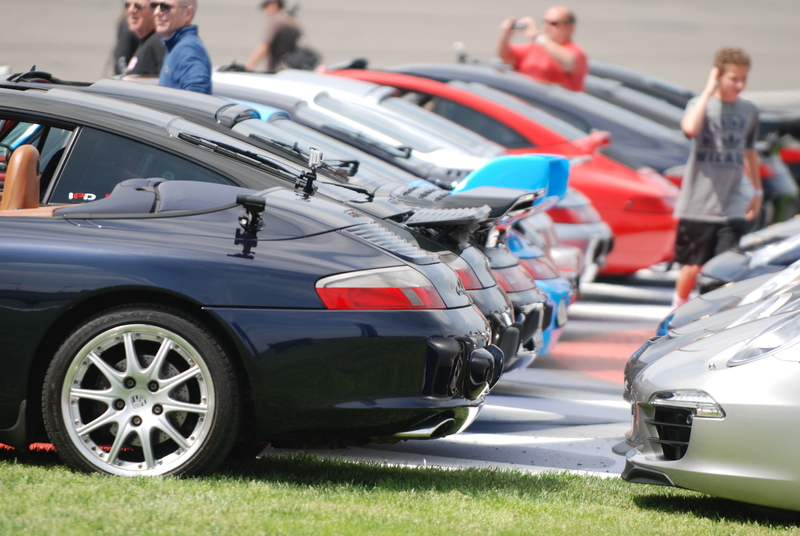 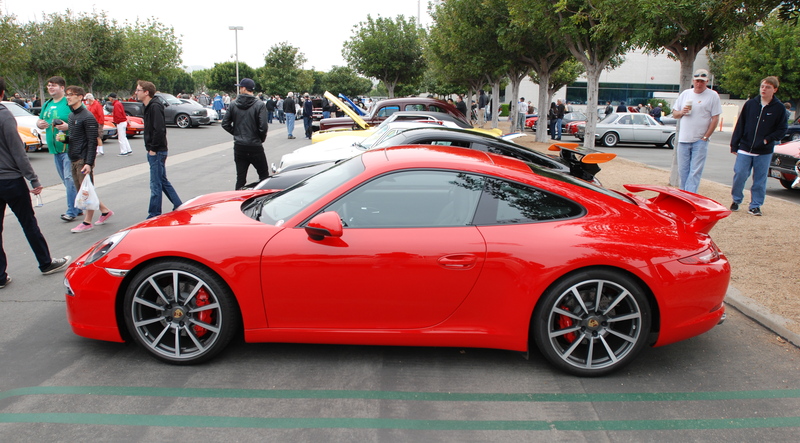 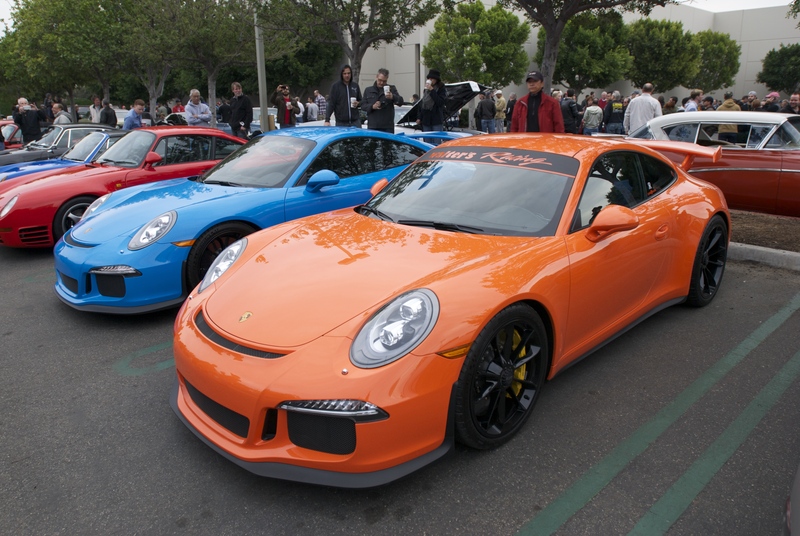 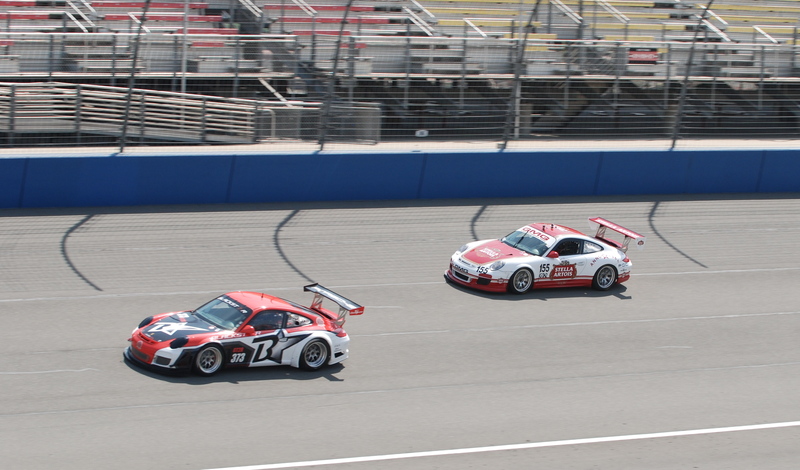 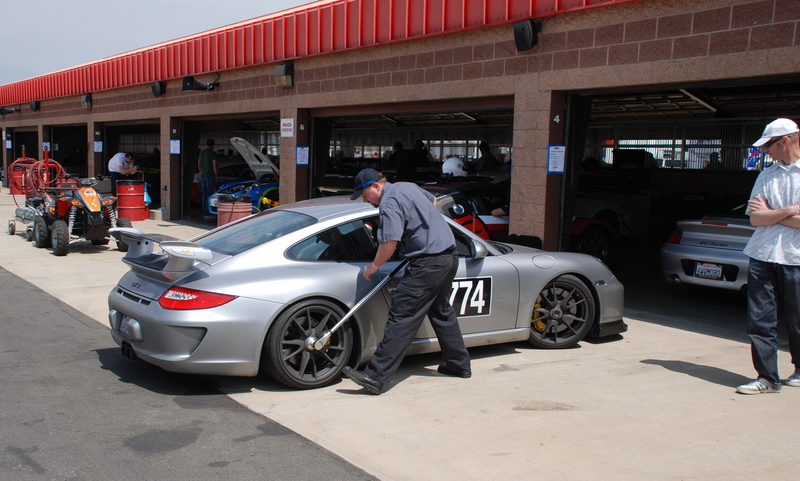 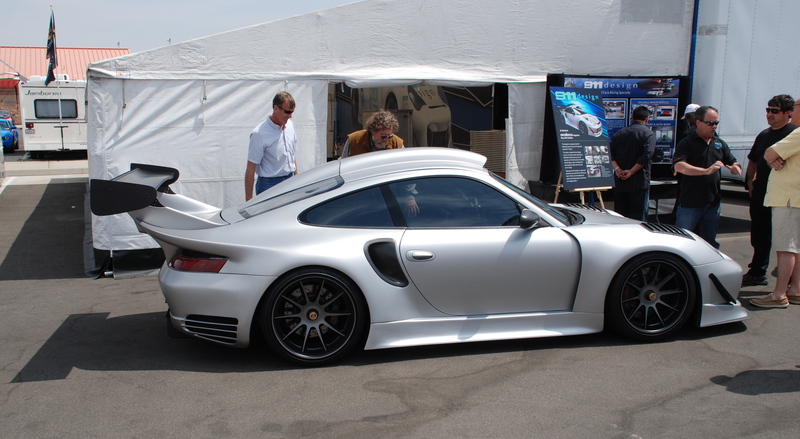 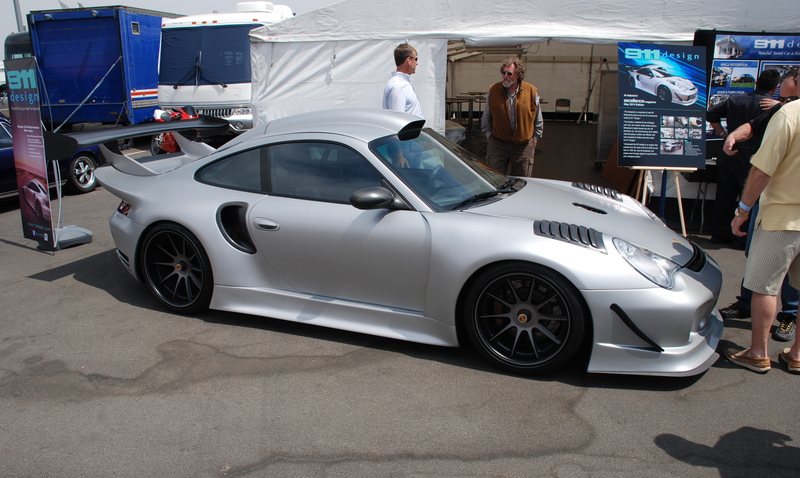 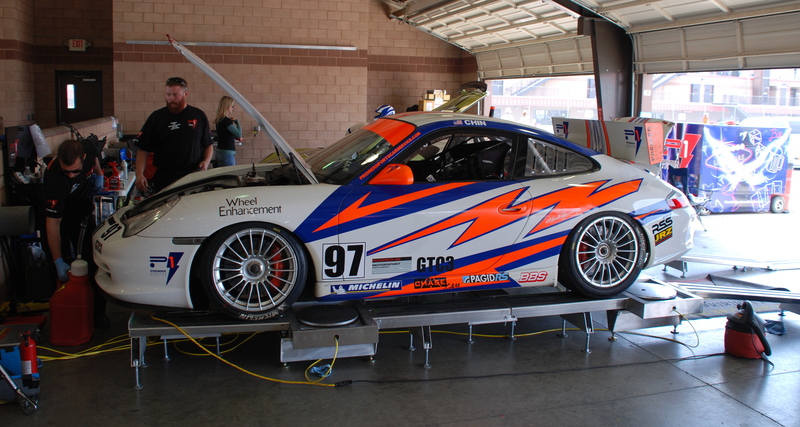 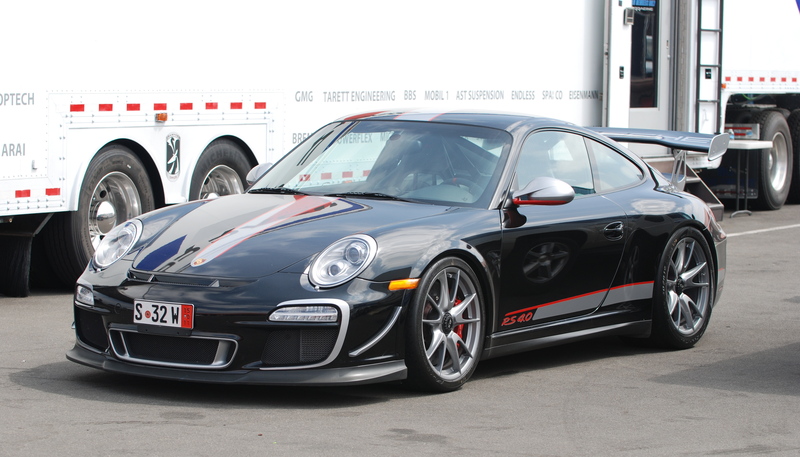 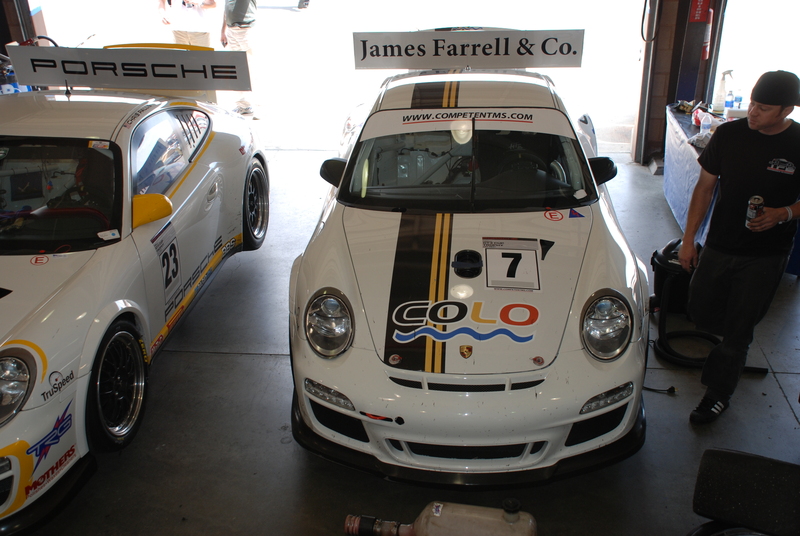 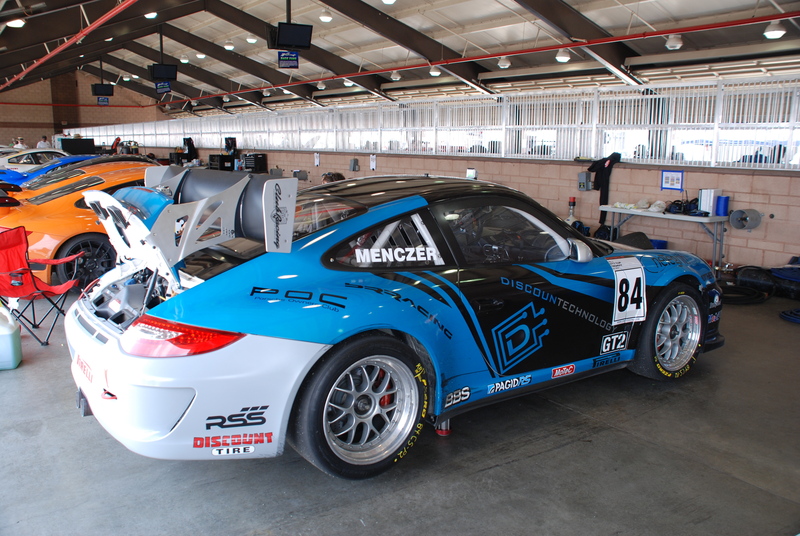 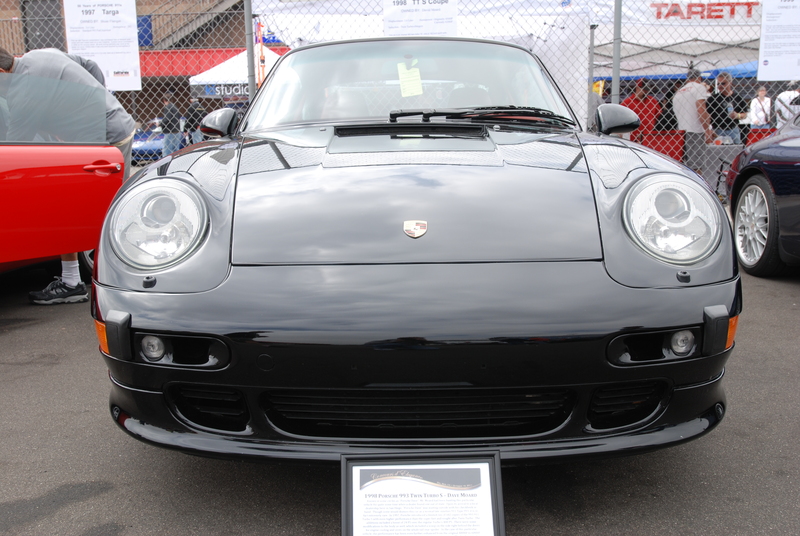 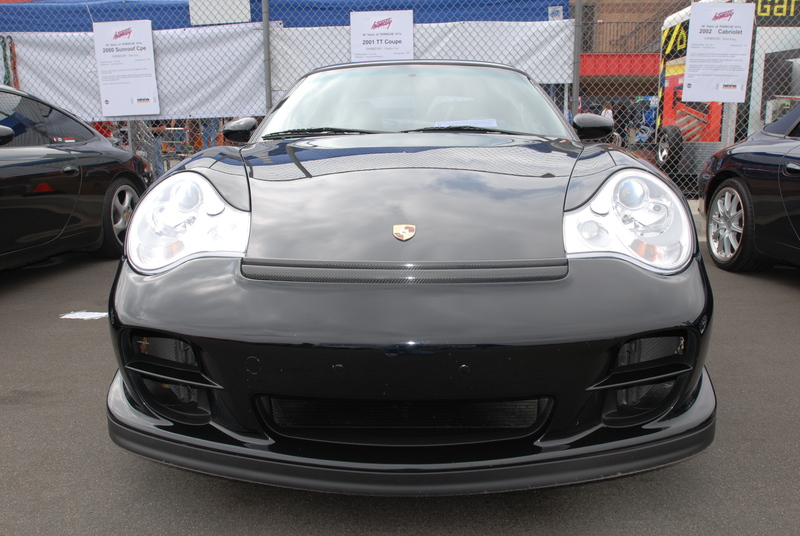 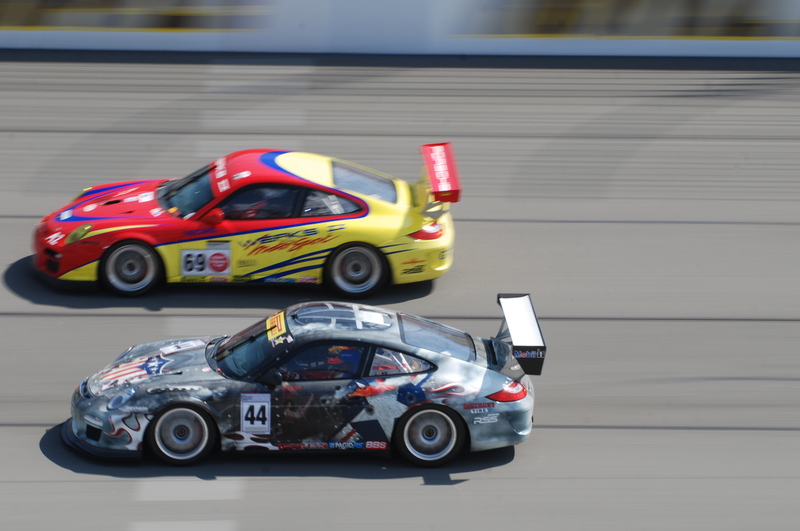 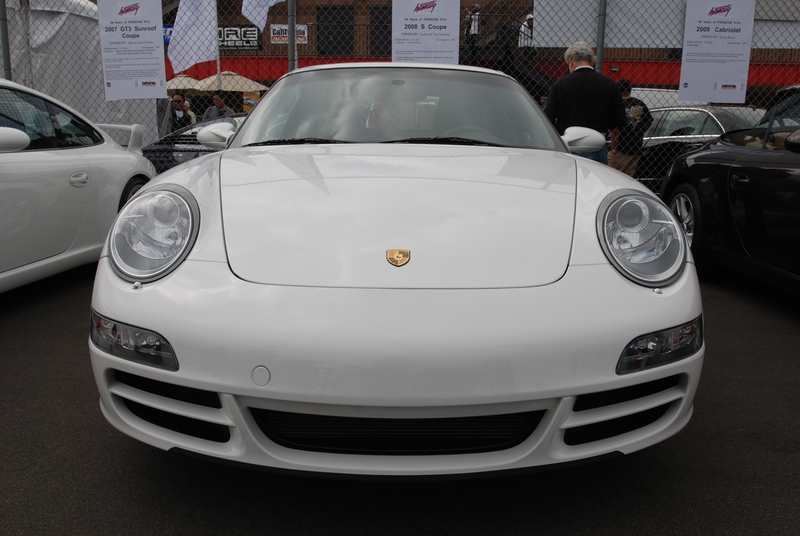 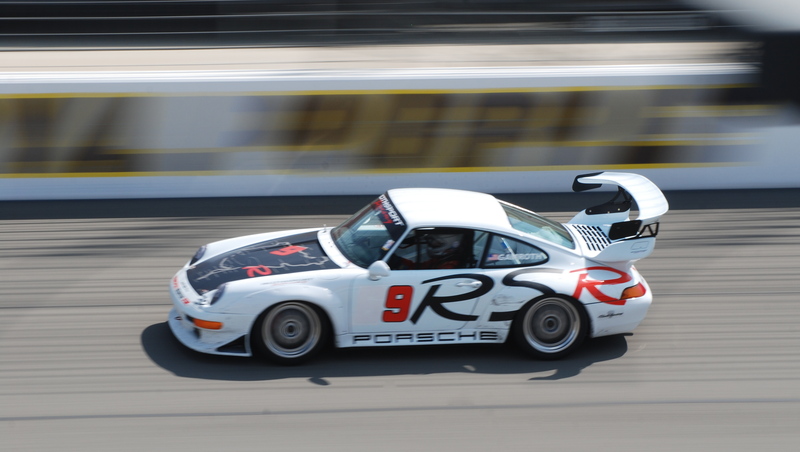 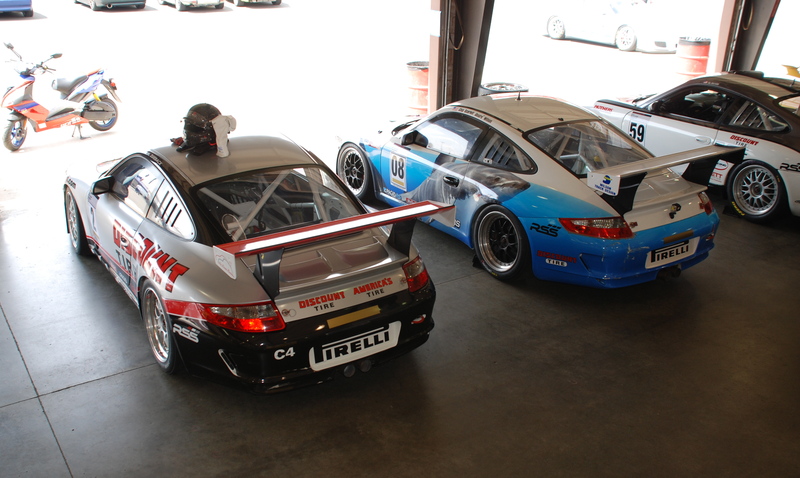 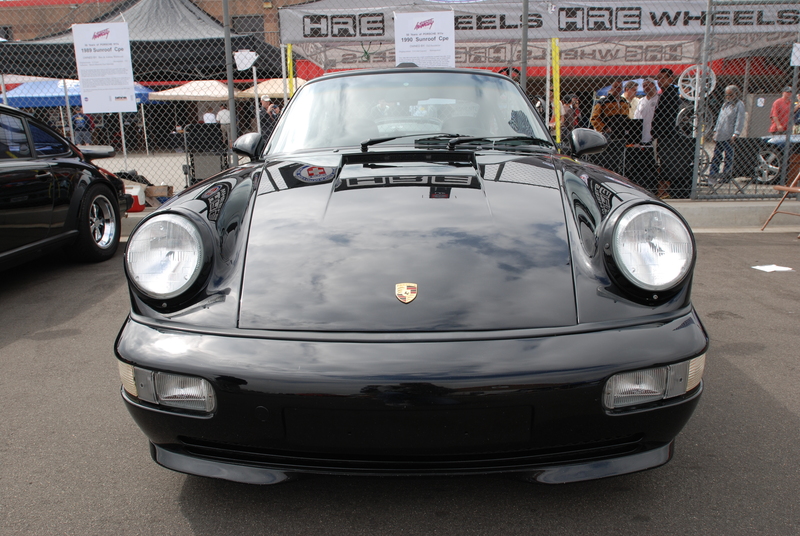 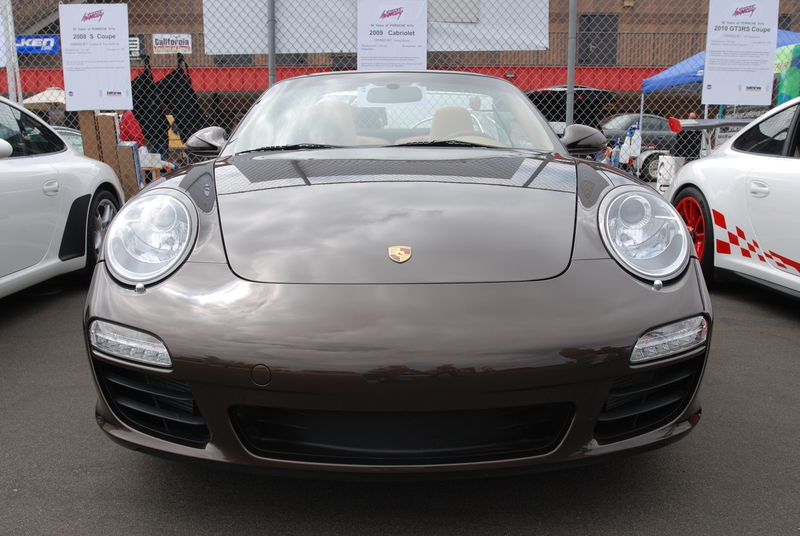 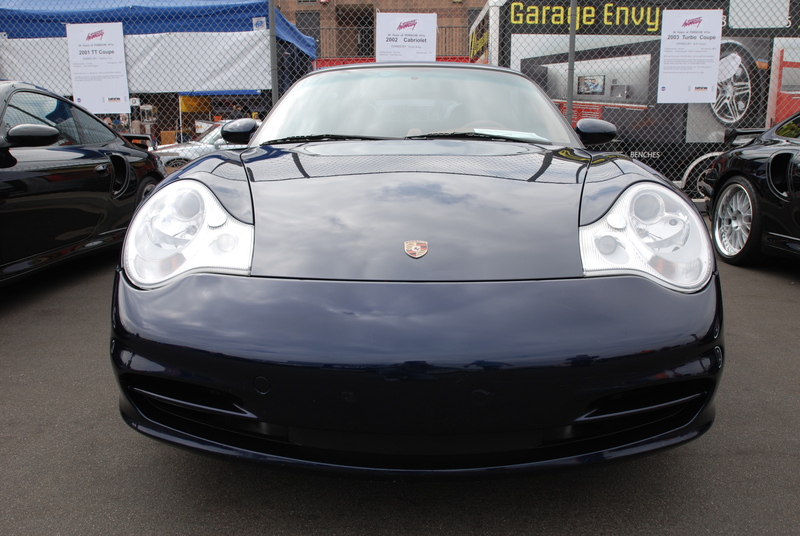 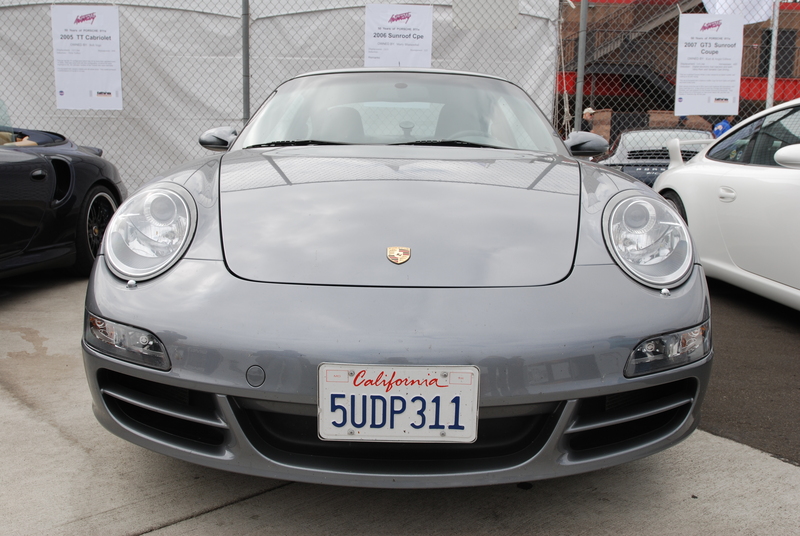 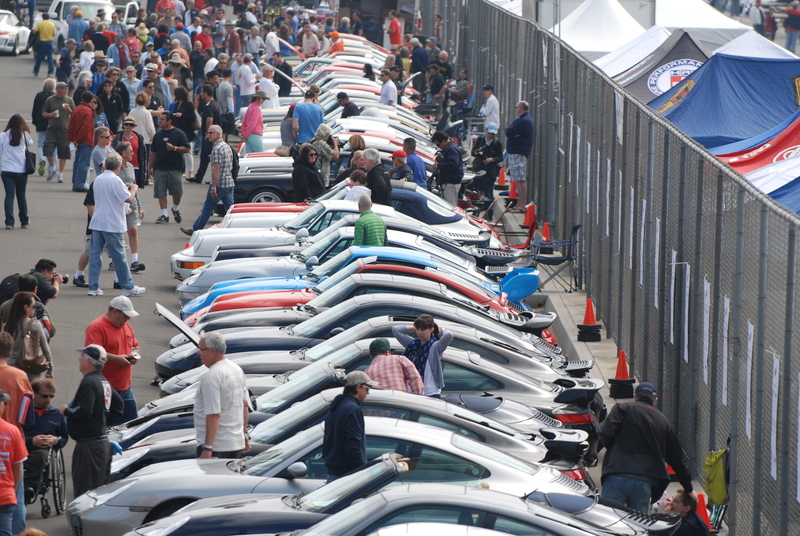 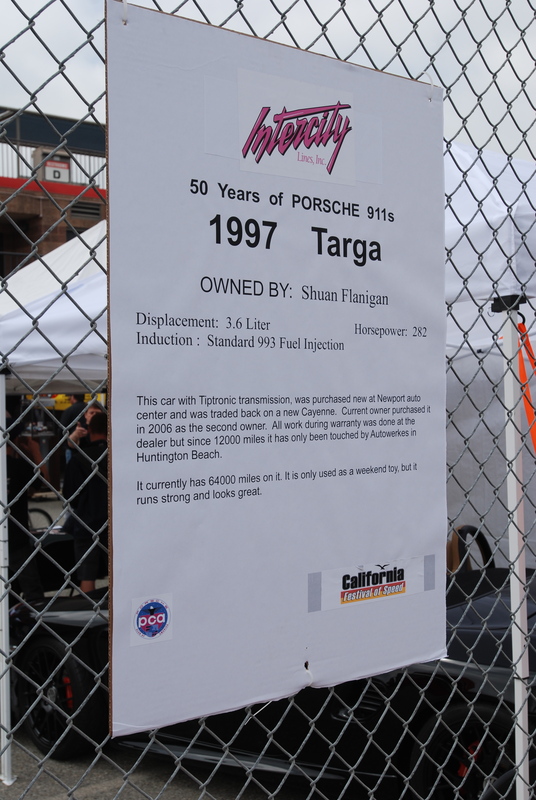 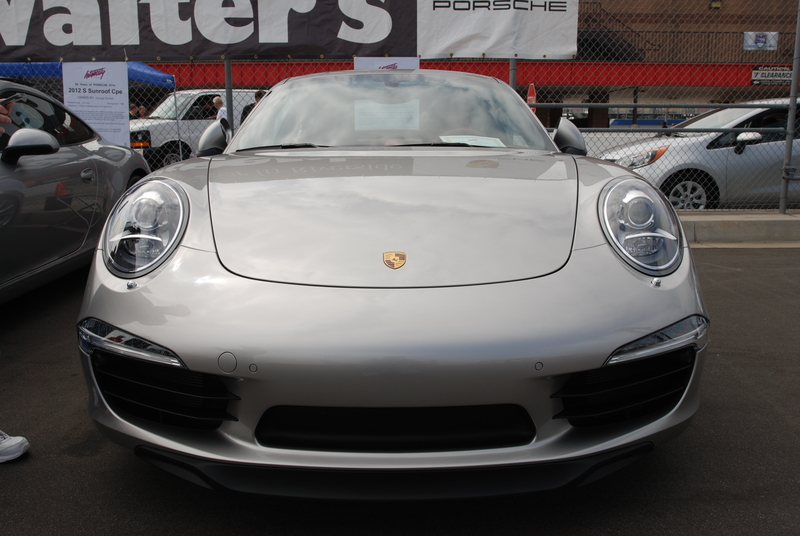 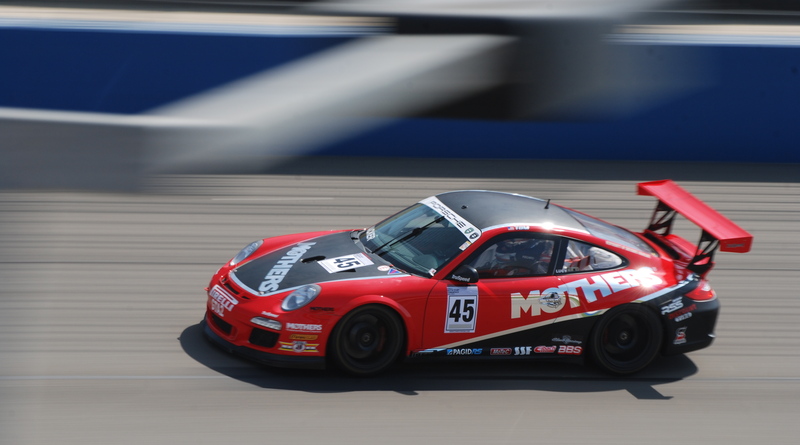 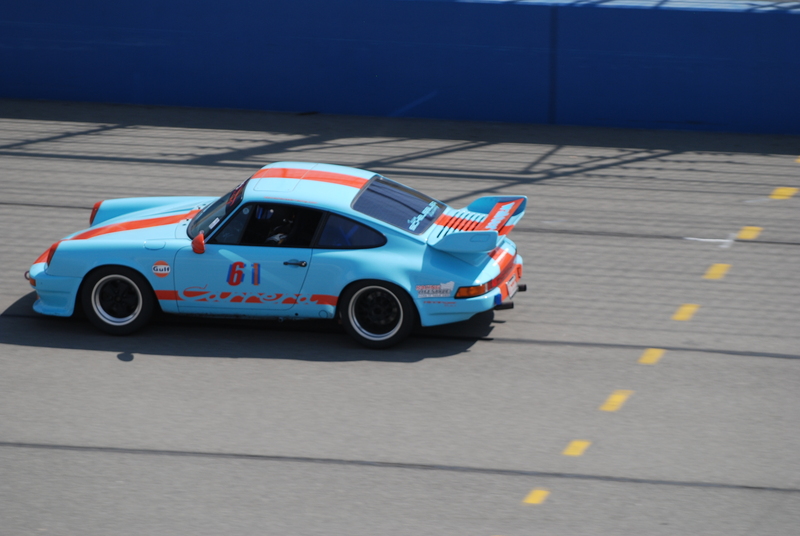 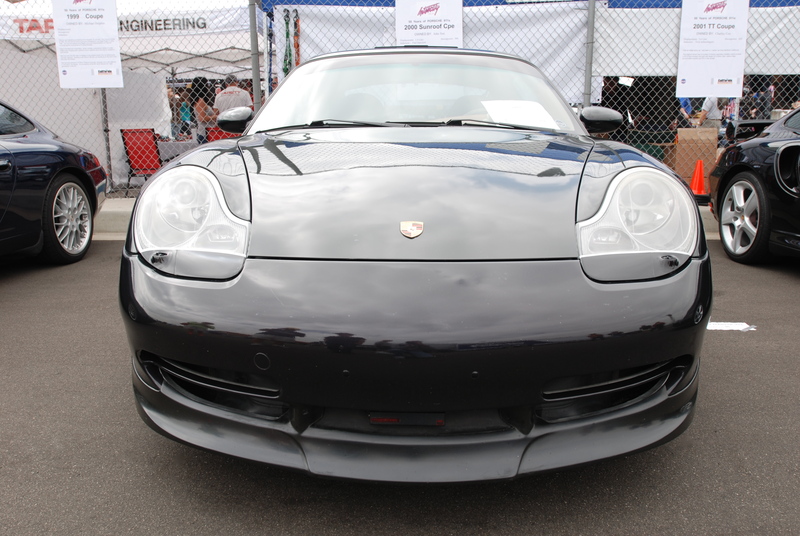 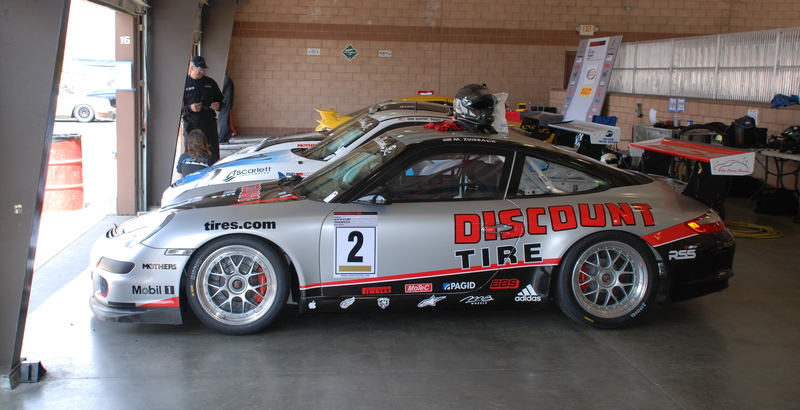 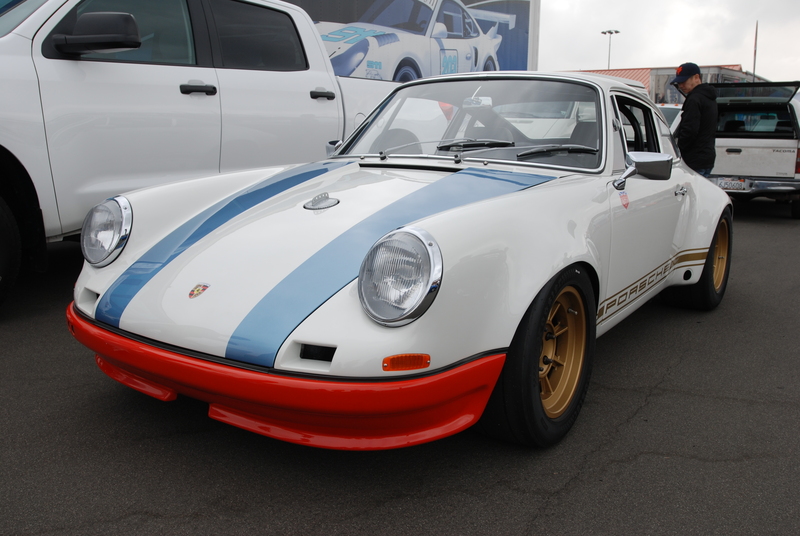 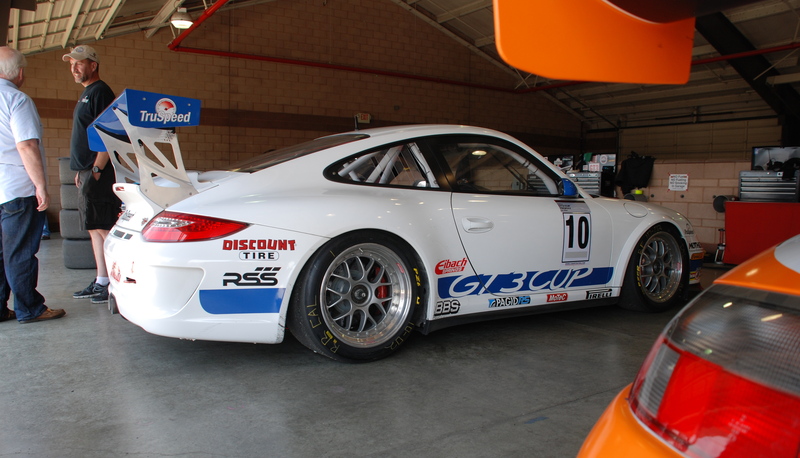 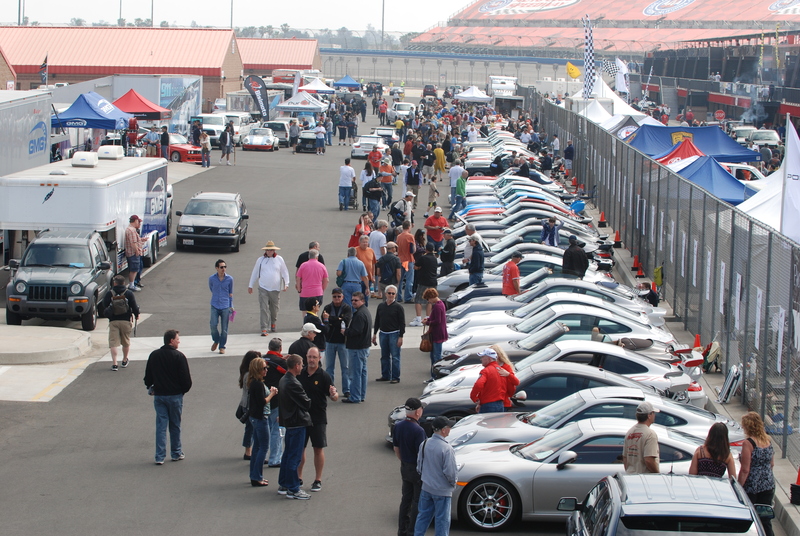 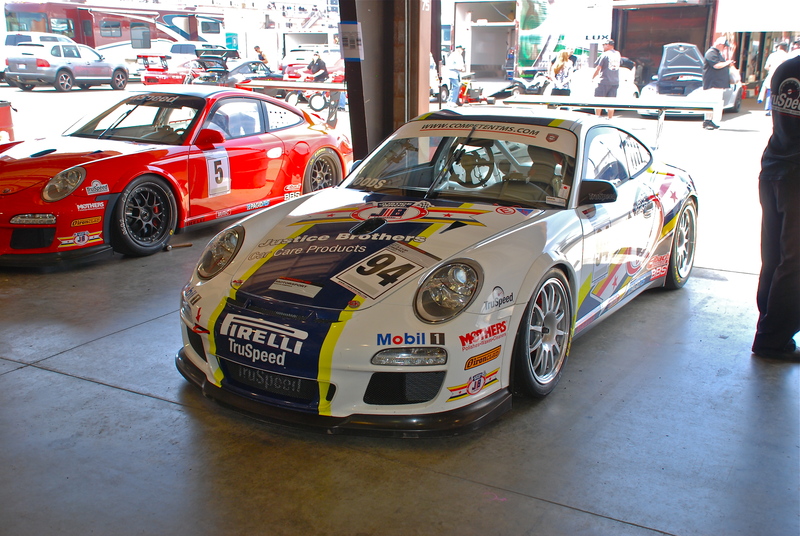 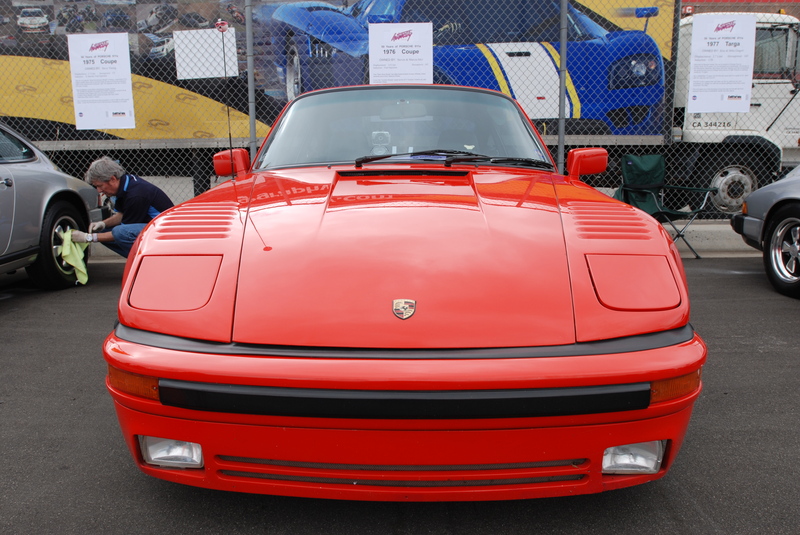 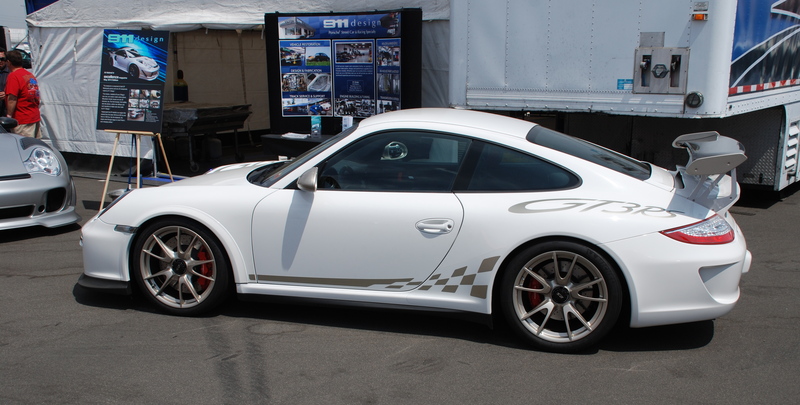 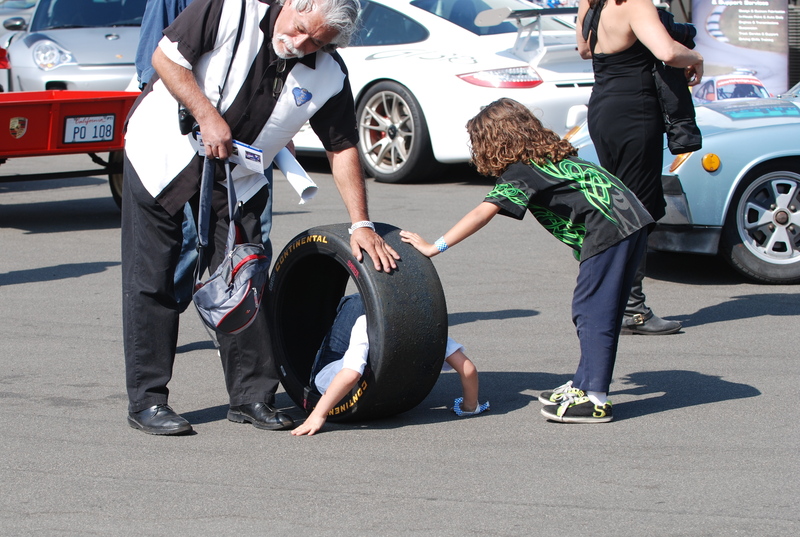 This years California Festival of Speed, held at the Autoclub Speedway in Fontana California, during the weekend of April 5 – 7, was once again advertised as the “Biggest Porsche Event in the Southwest”. 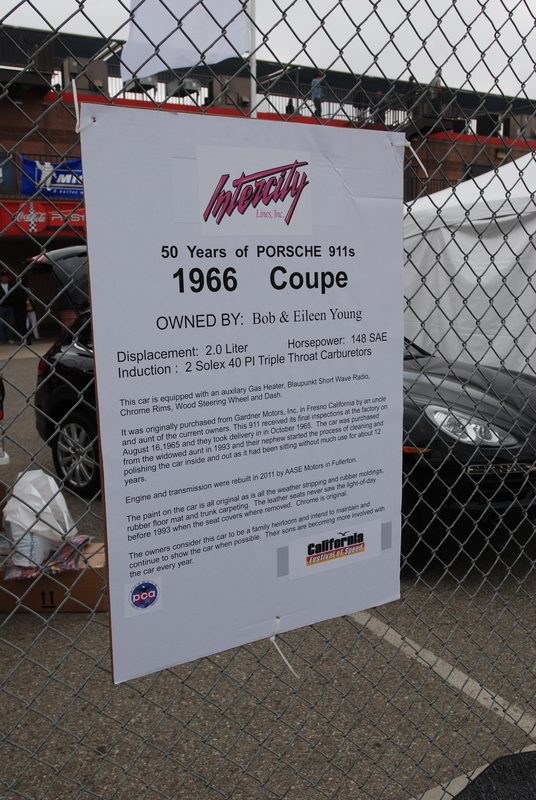 Based upon my observations and the comments I overheard, this years event more than lived up to the claim. 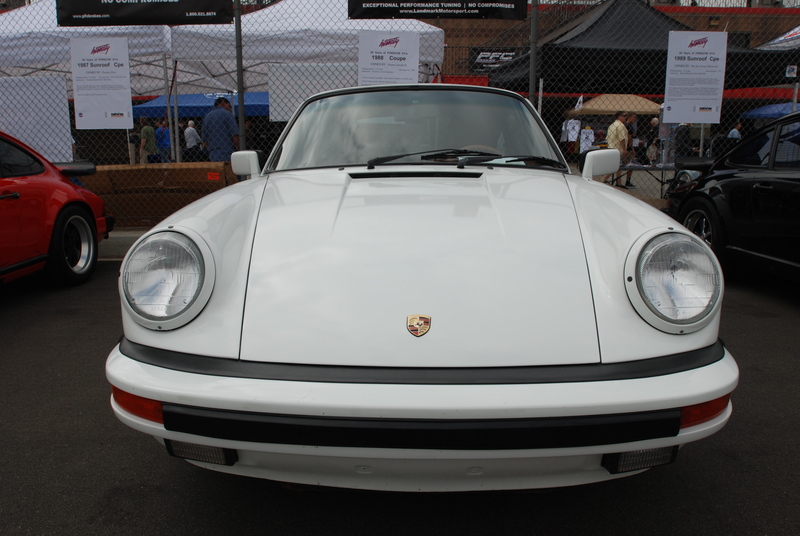 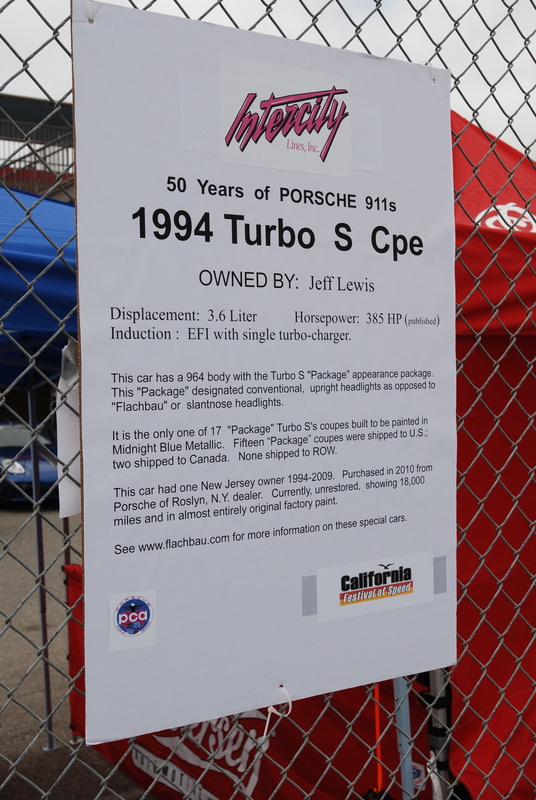 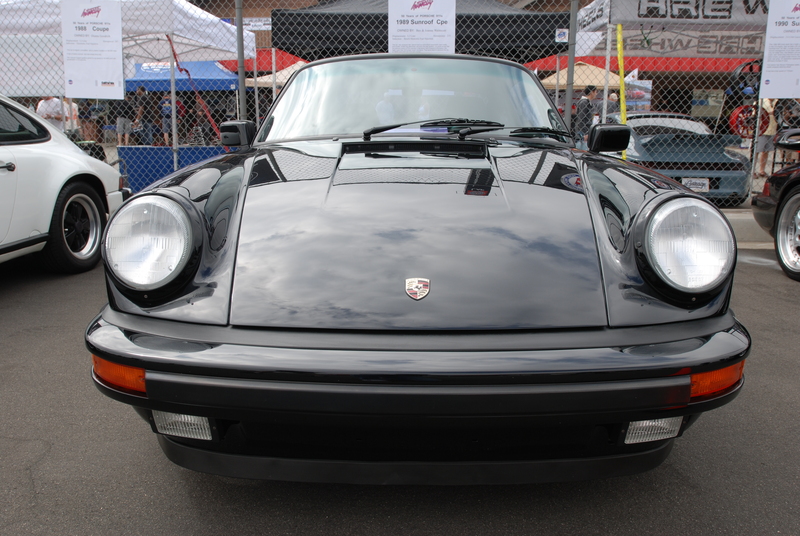 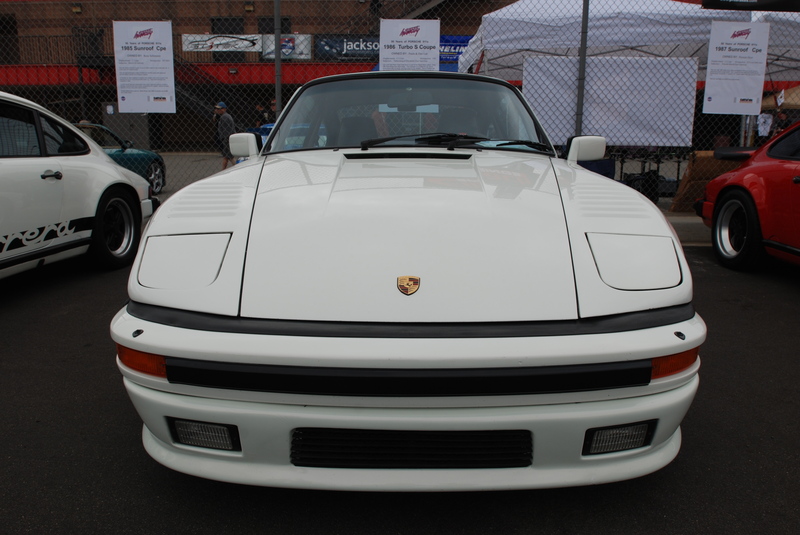 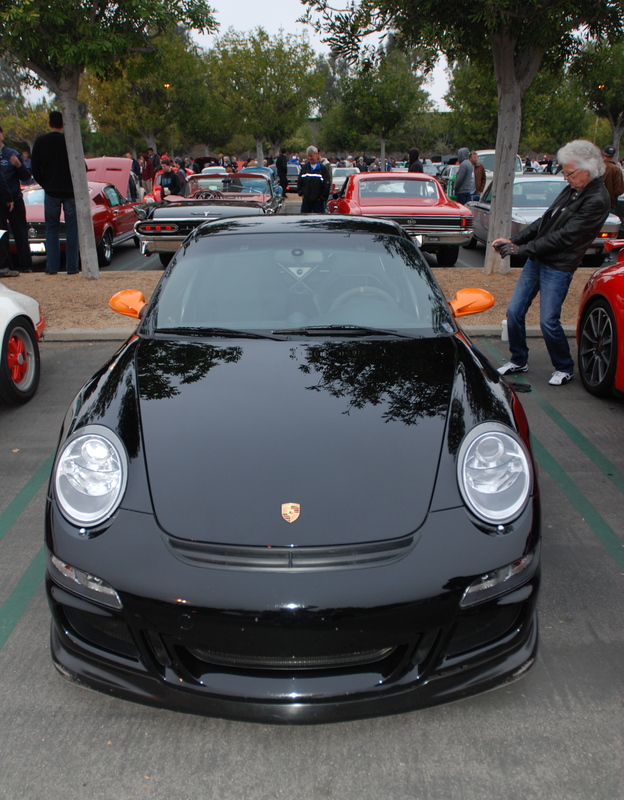 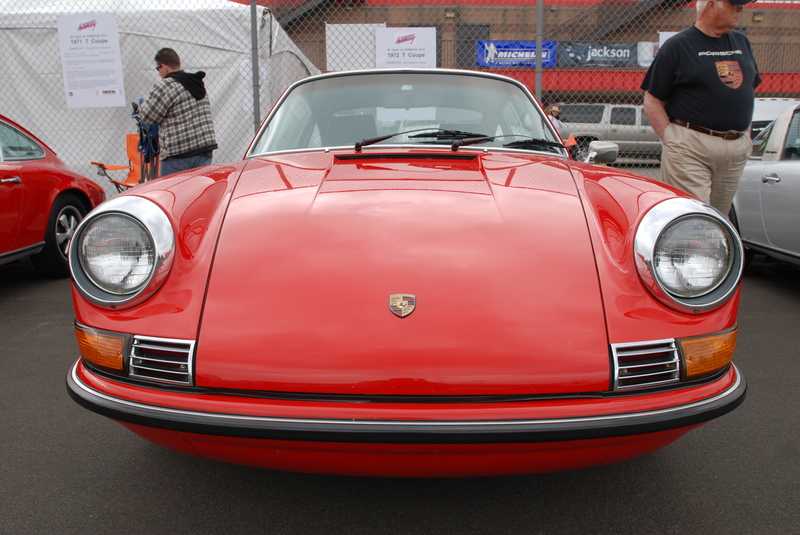 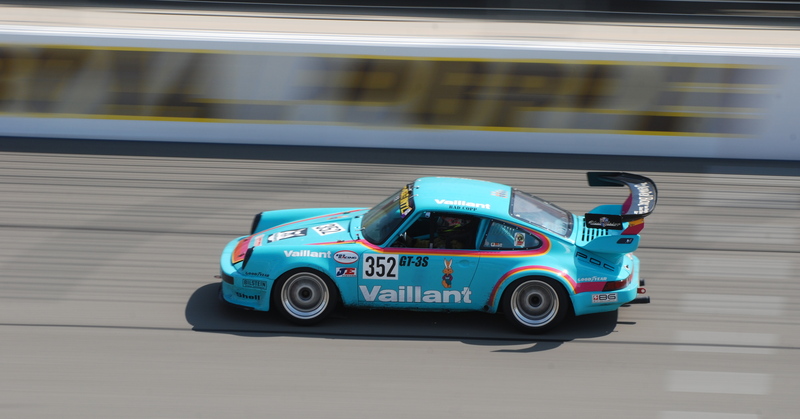 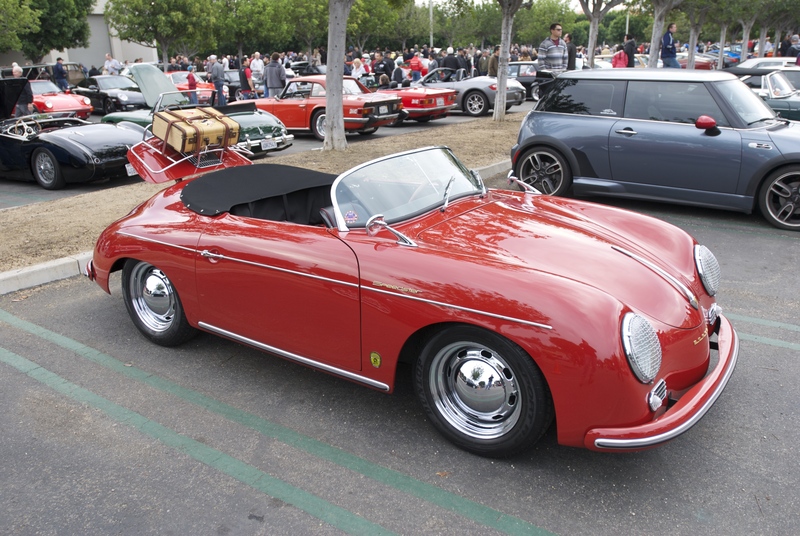 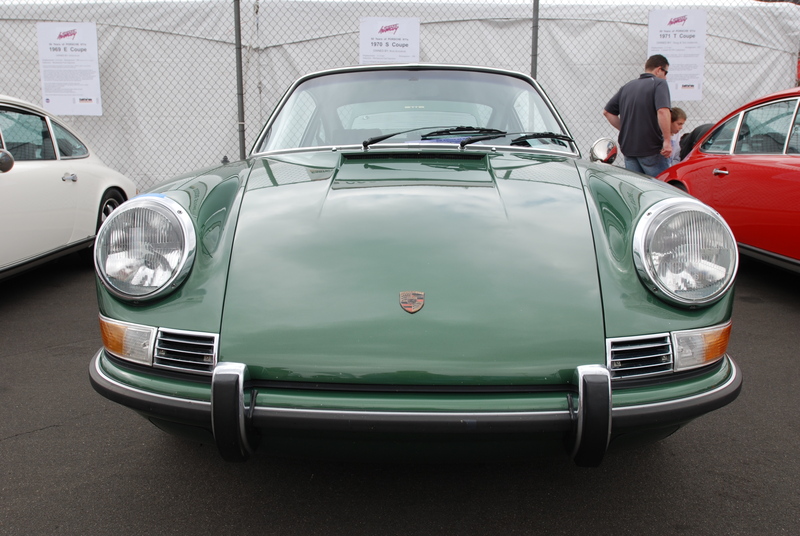 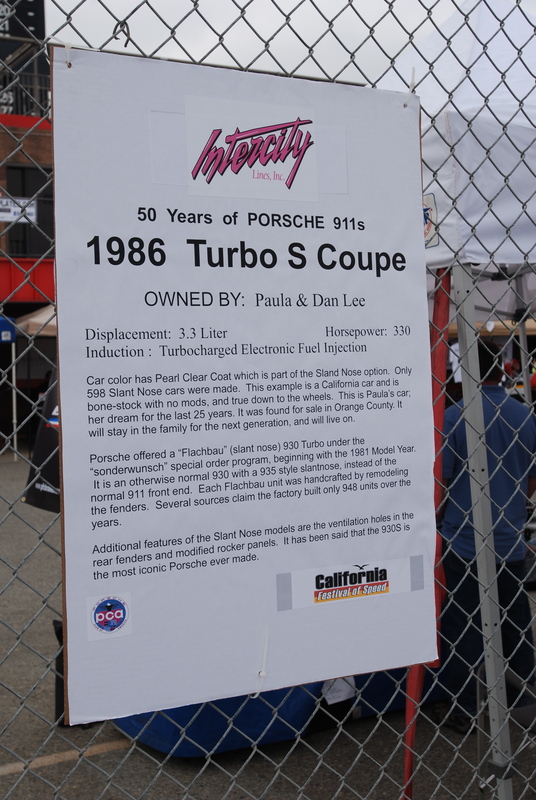 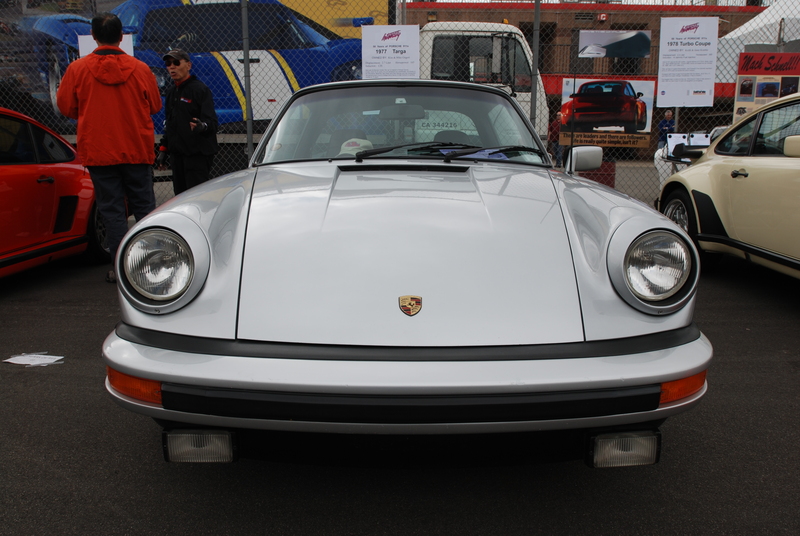 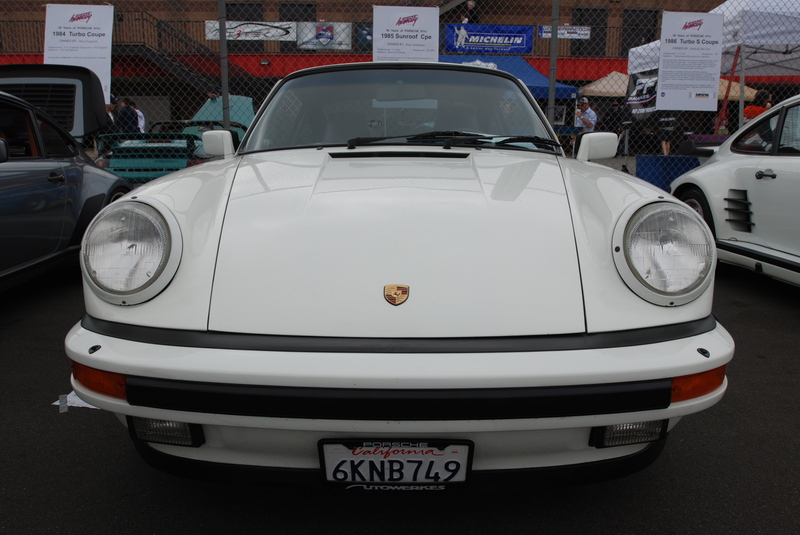 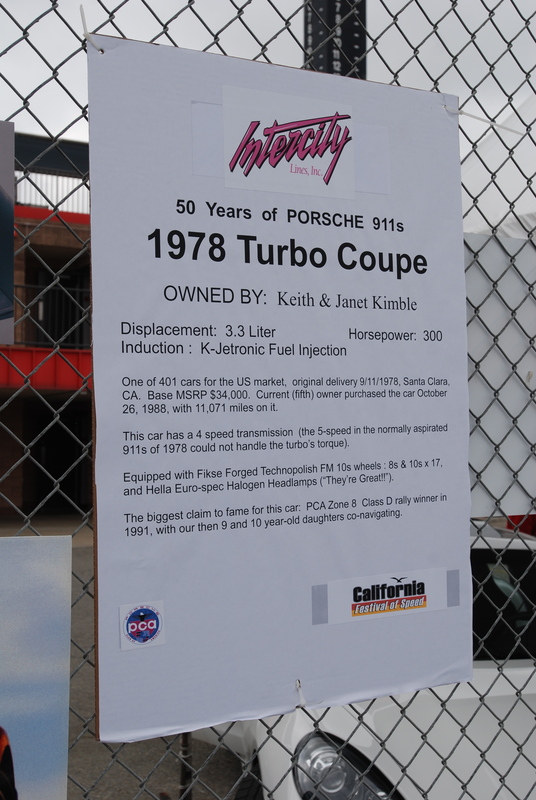 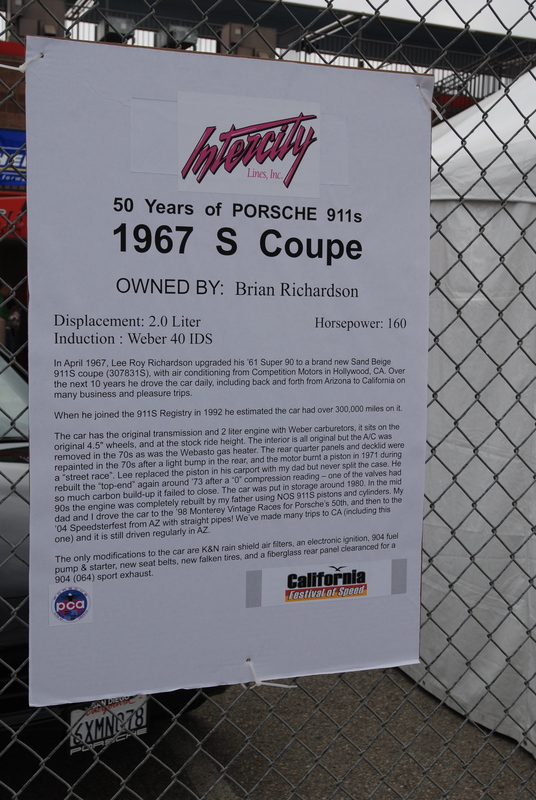 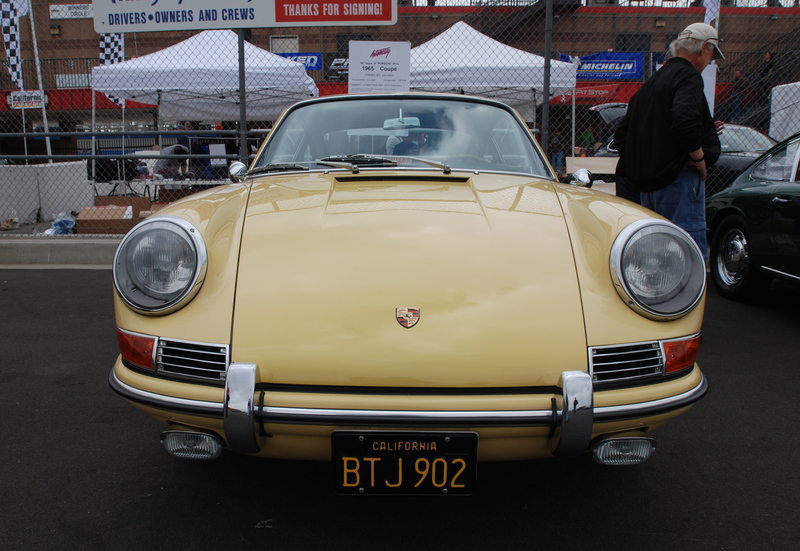 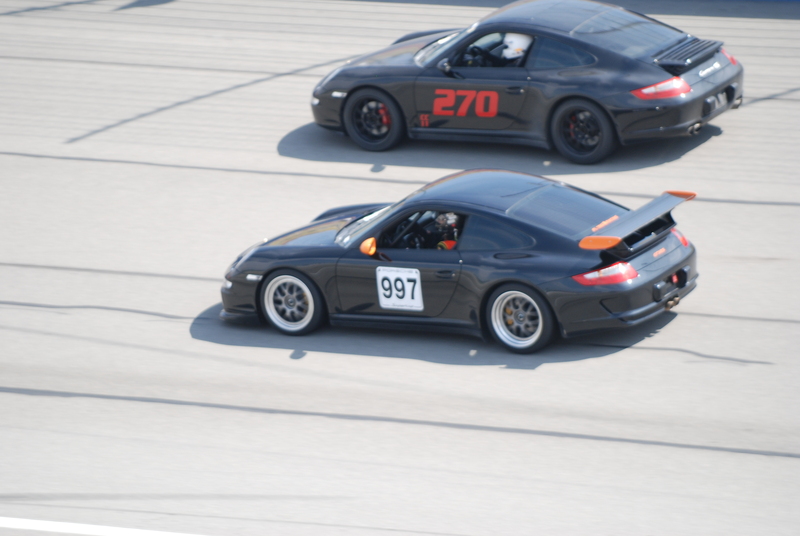 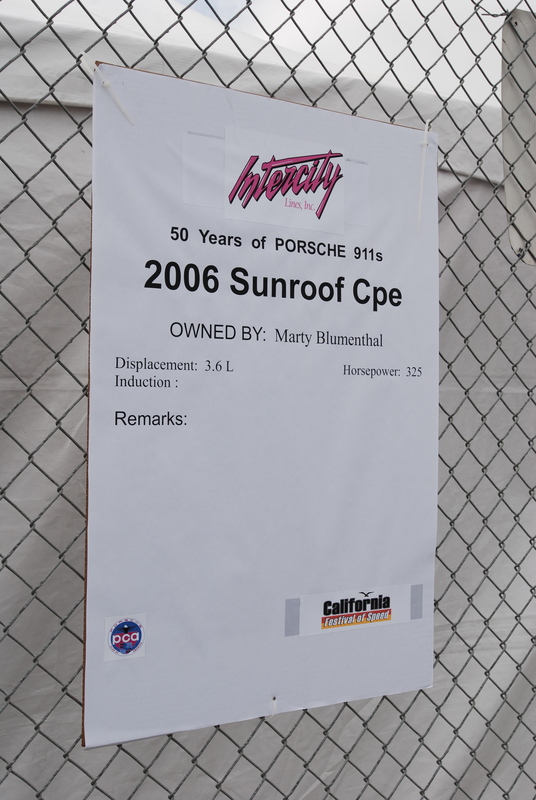 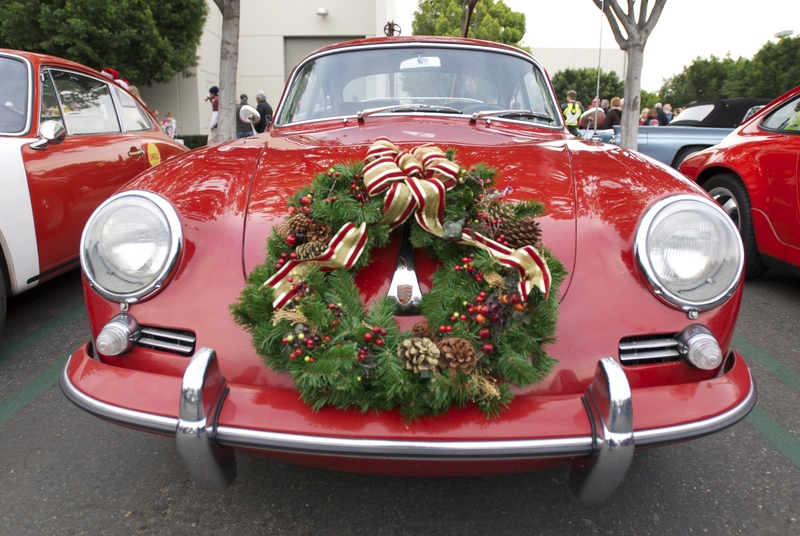 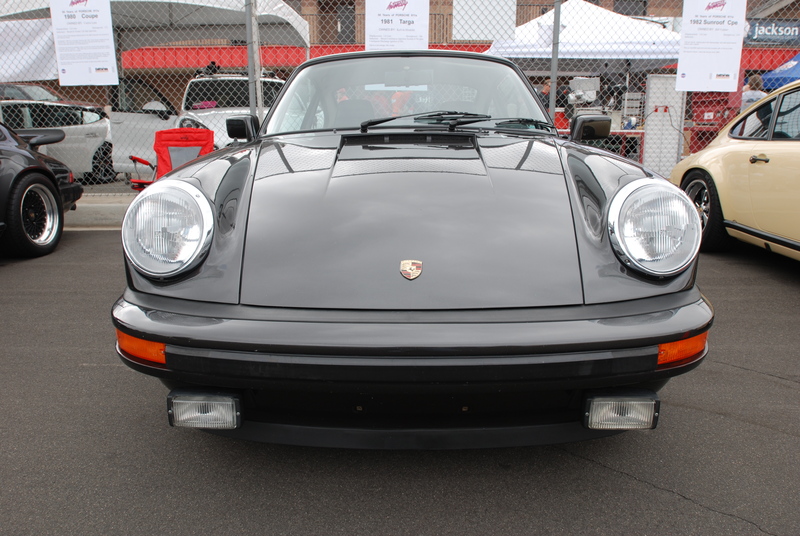 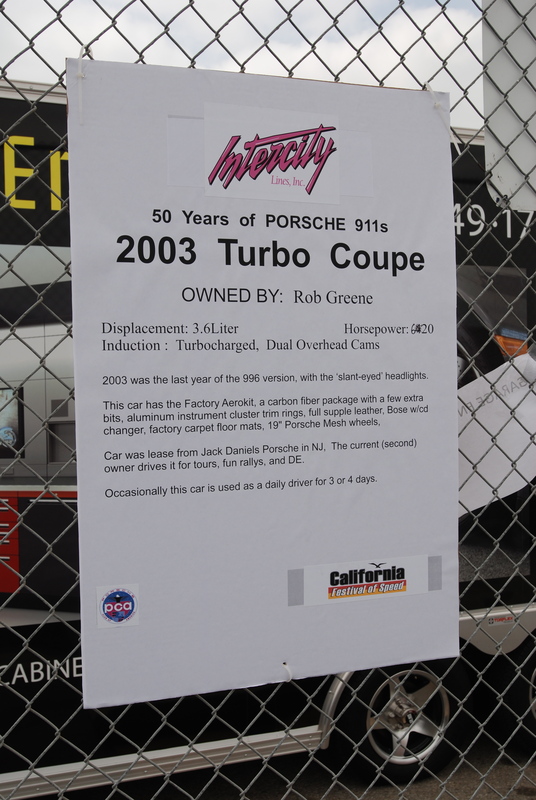 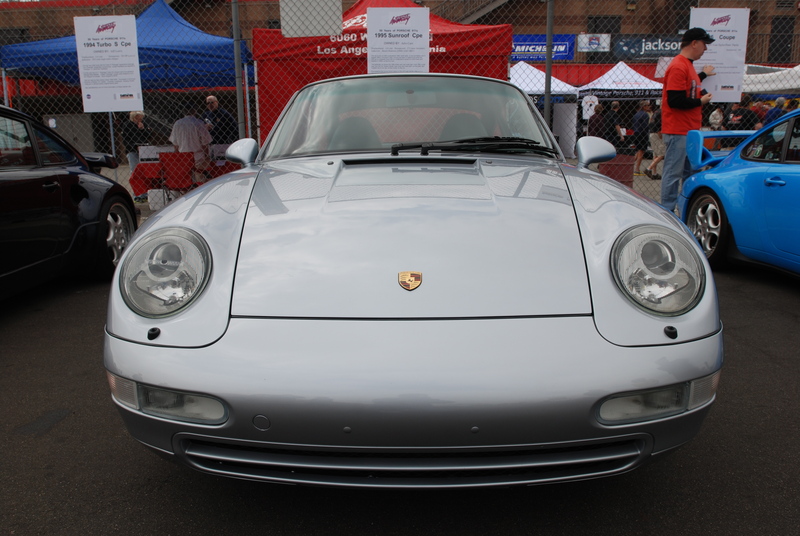 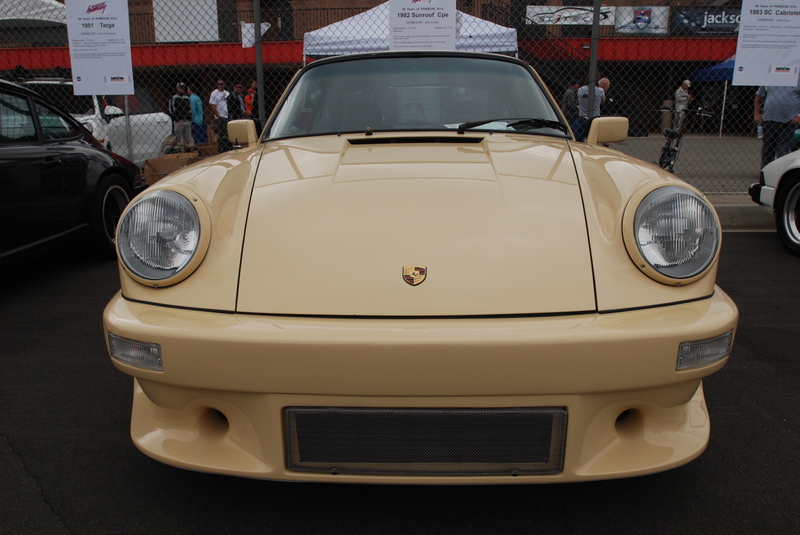 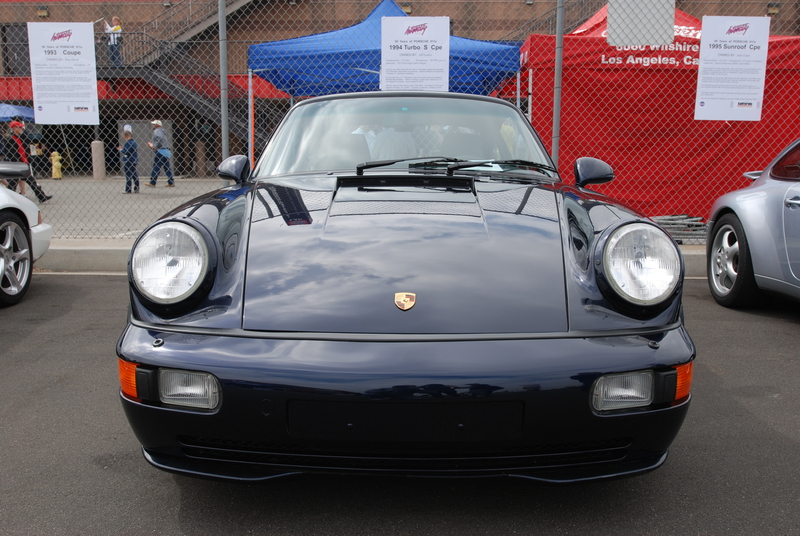 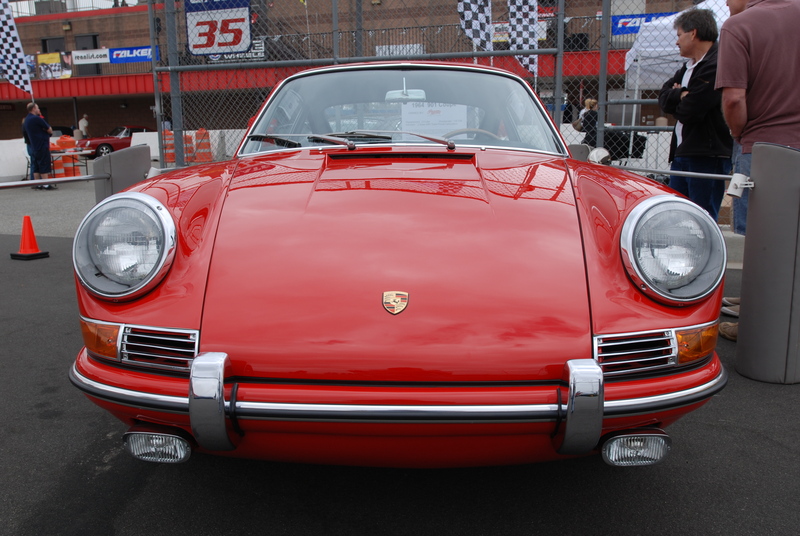 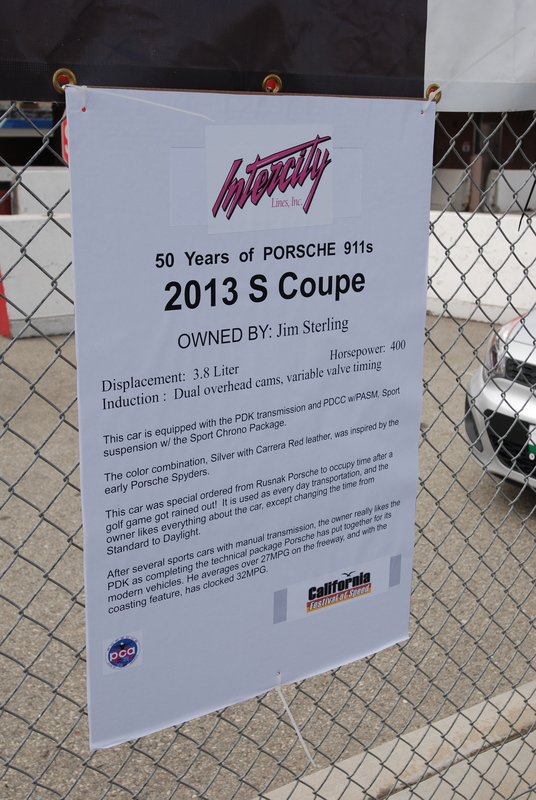 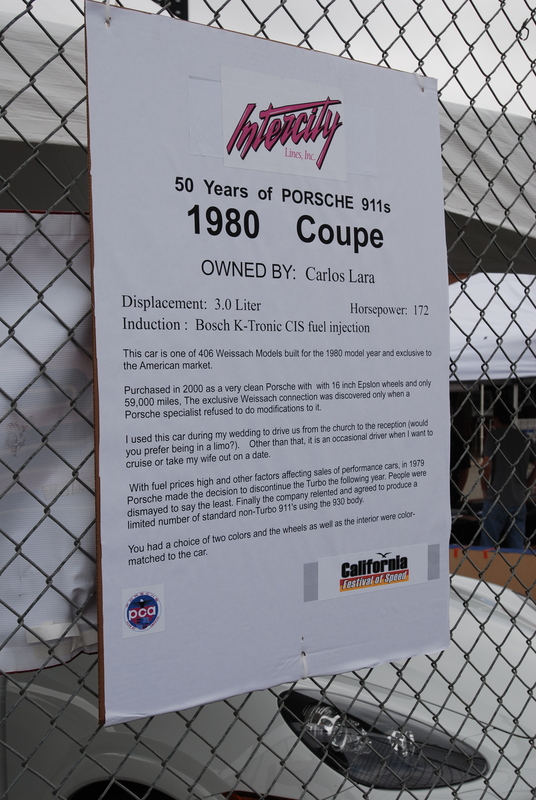 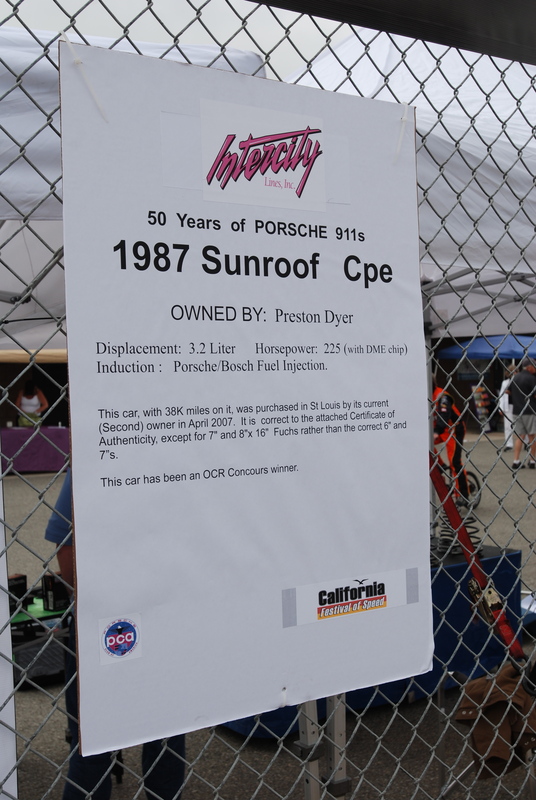 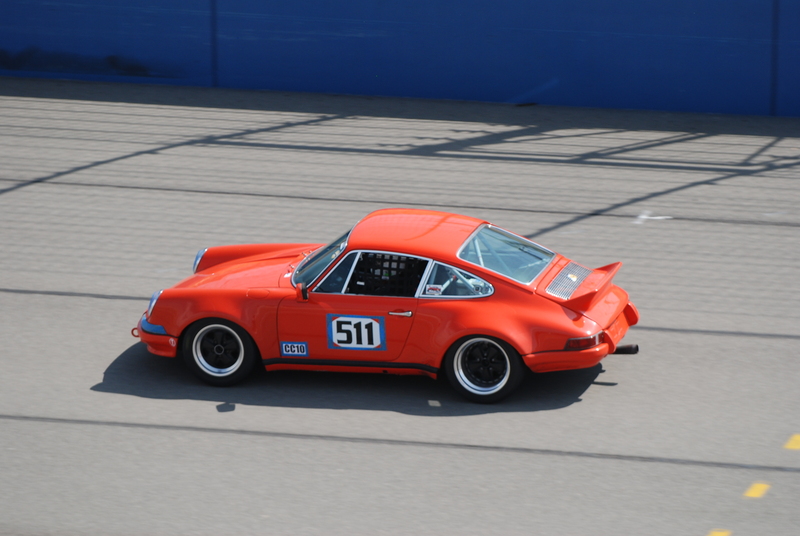 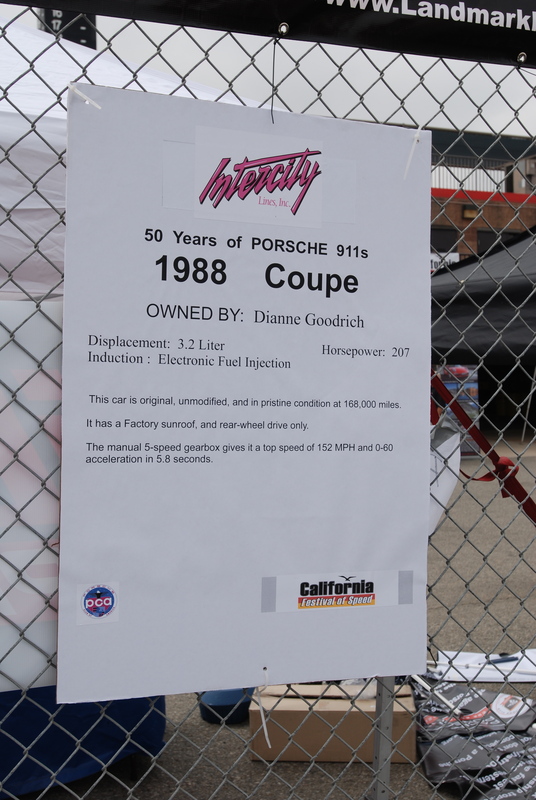 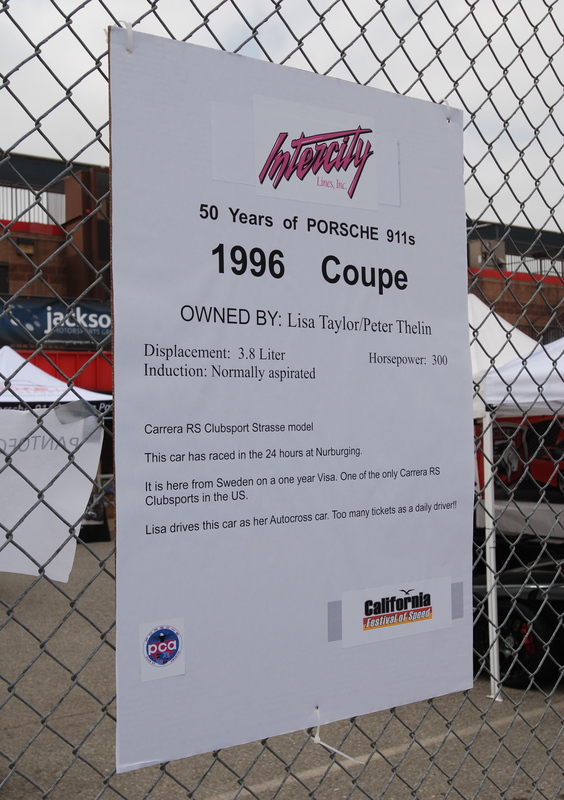 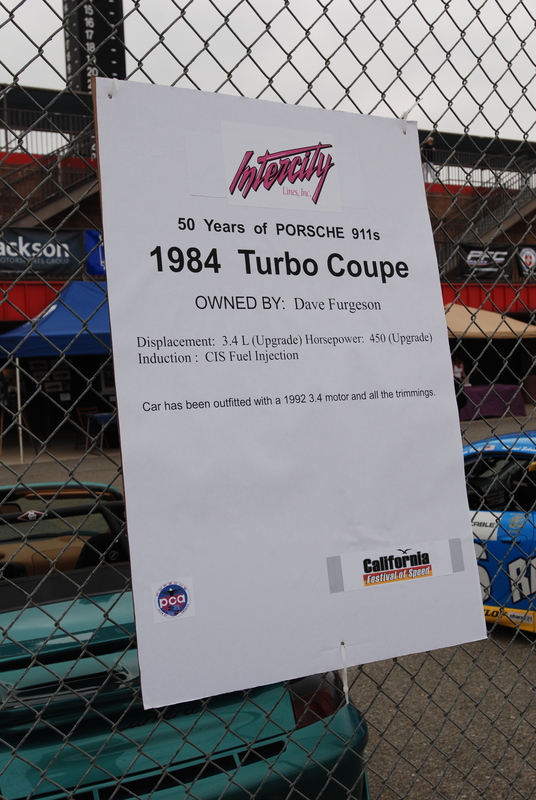 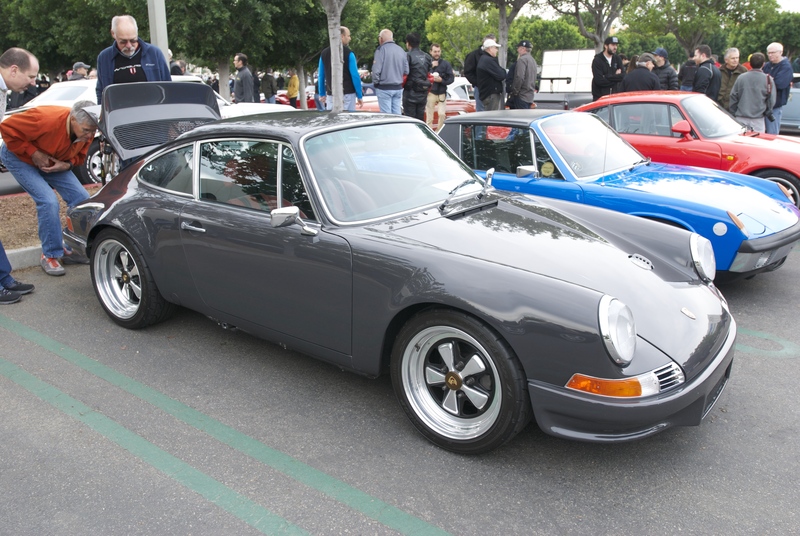 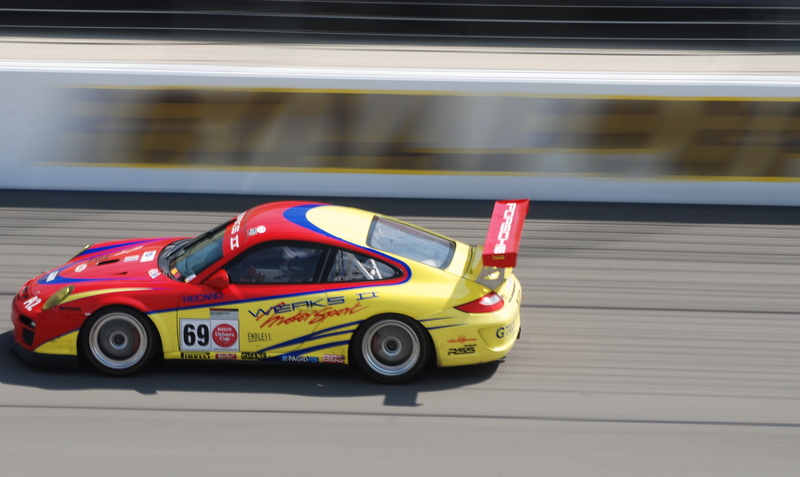 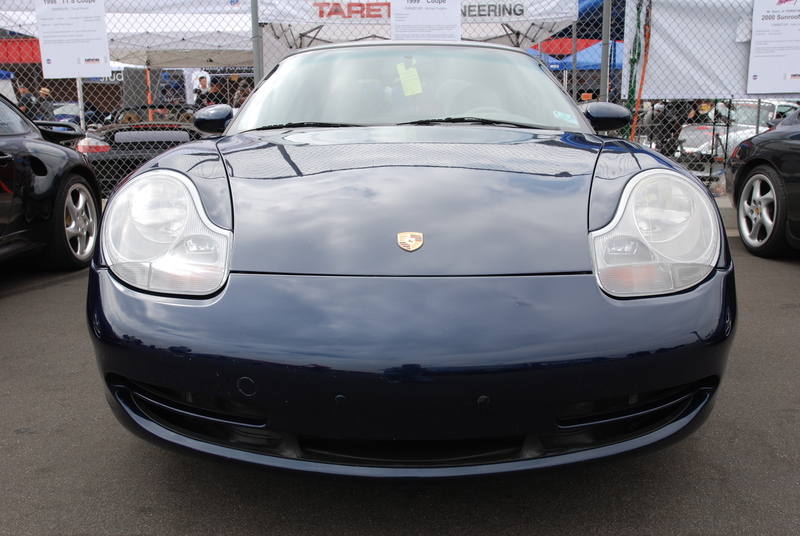 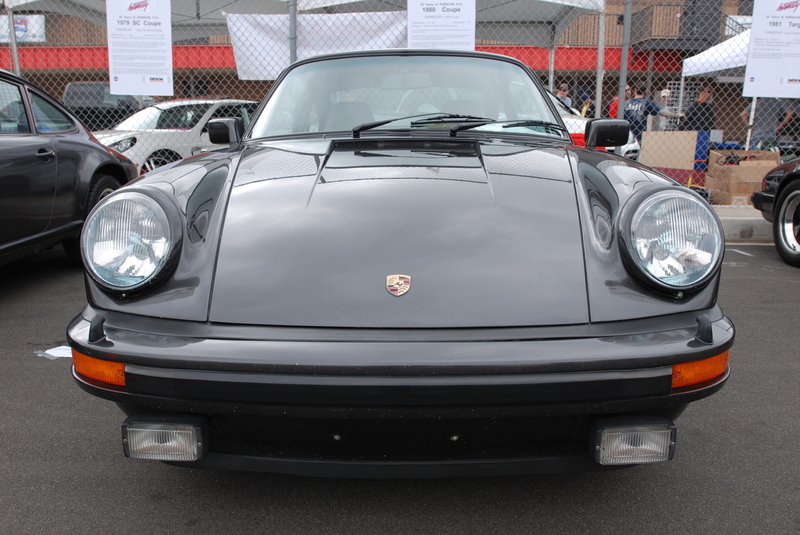 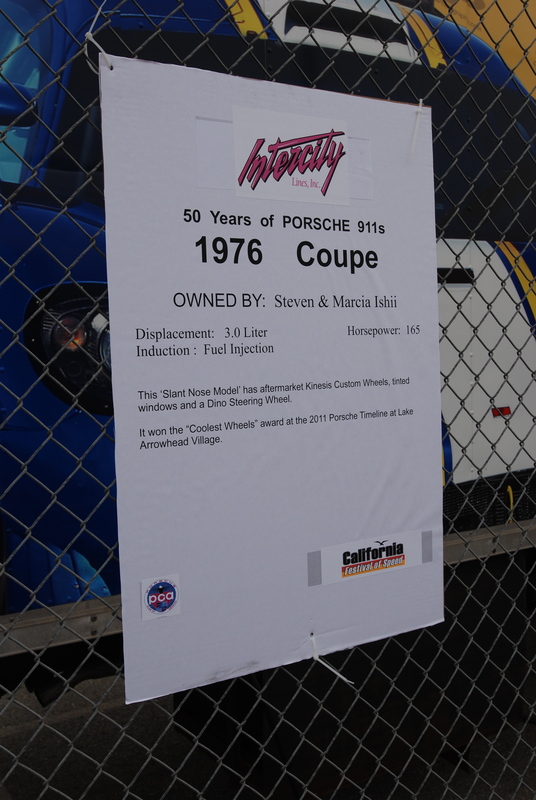 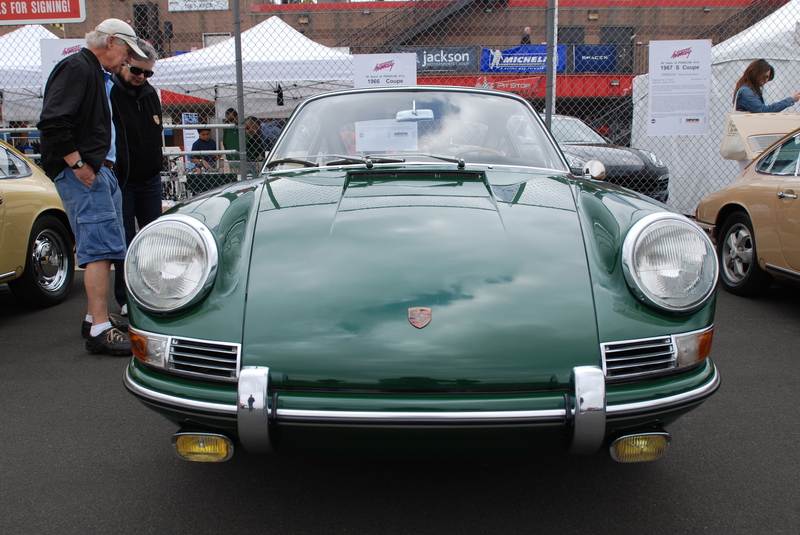 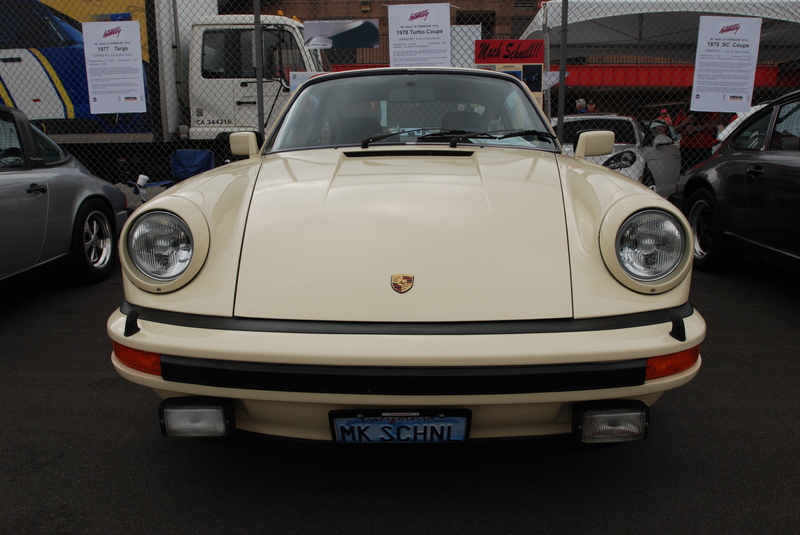 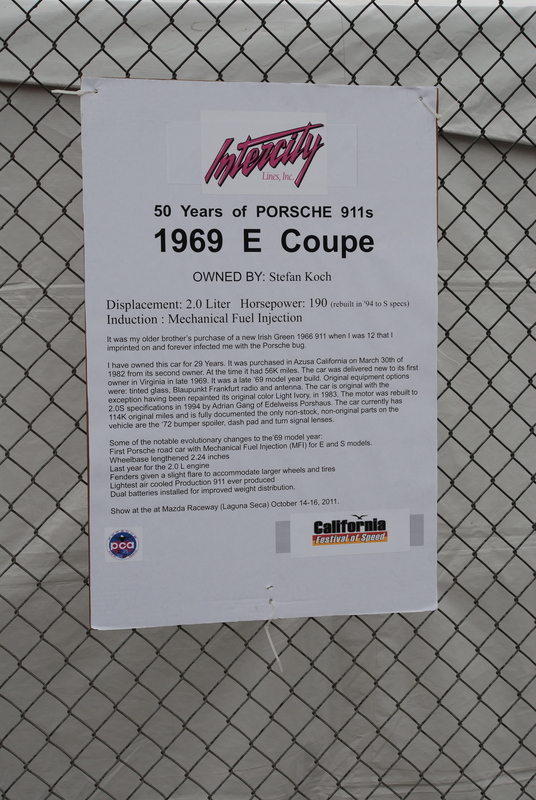 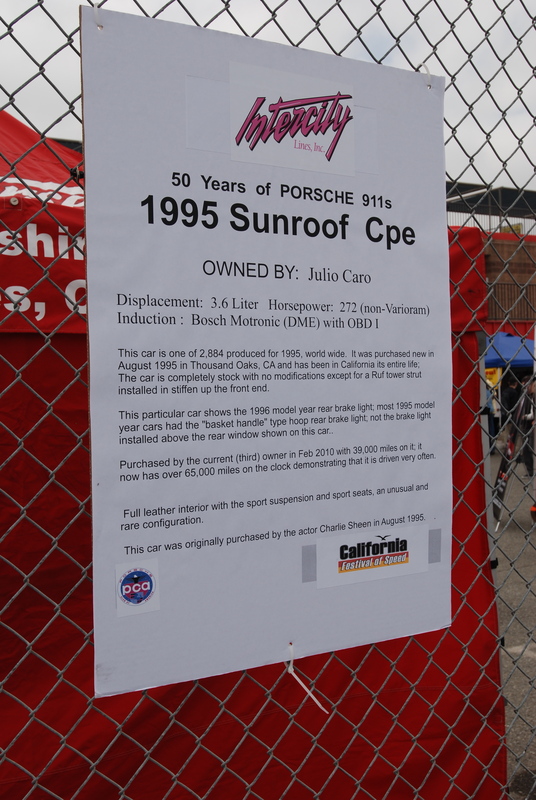 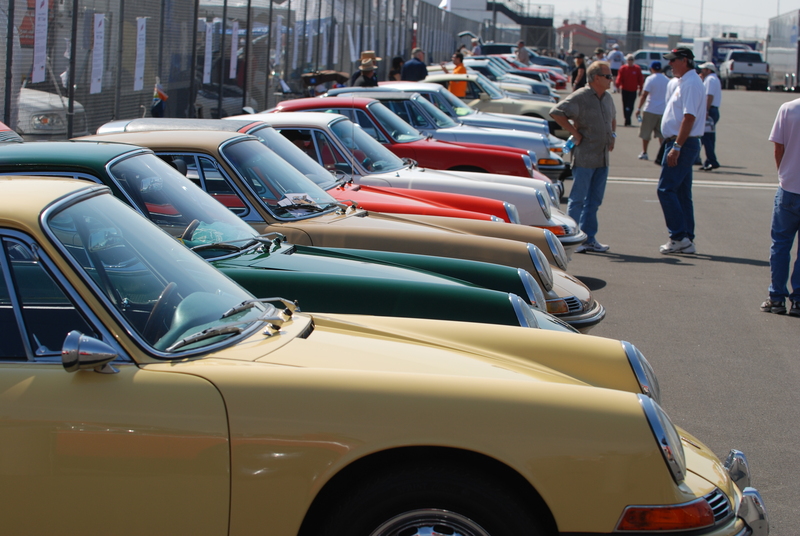 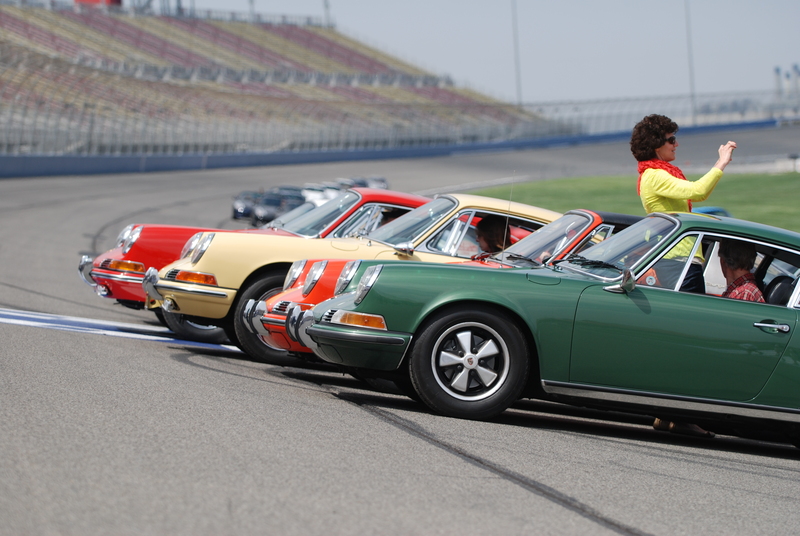 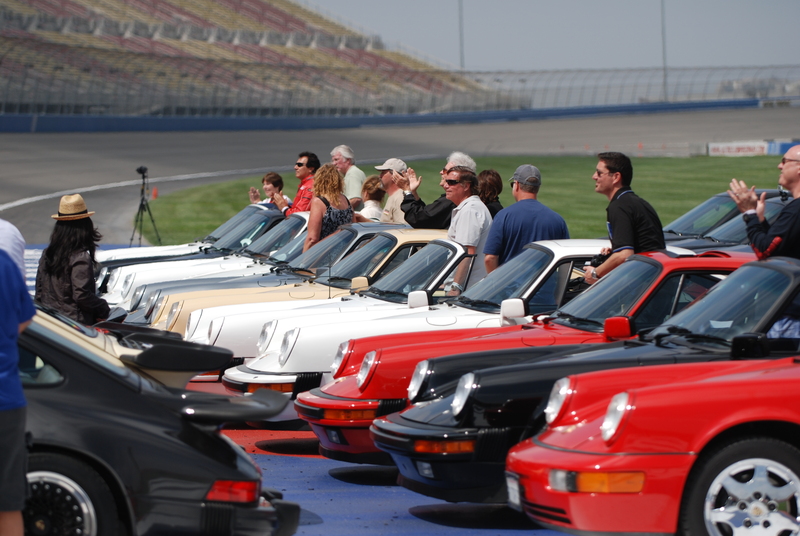 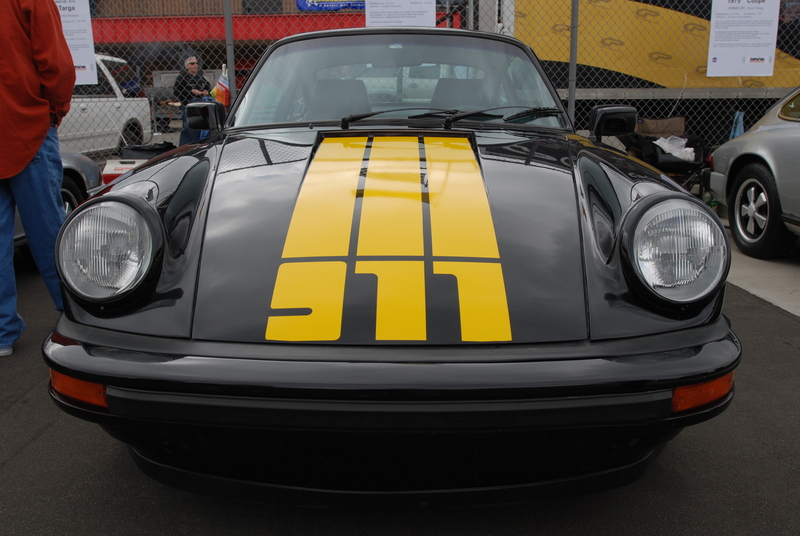 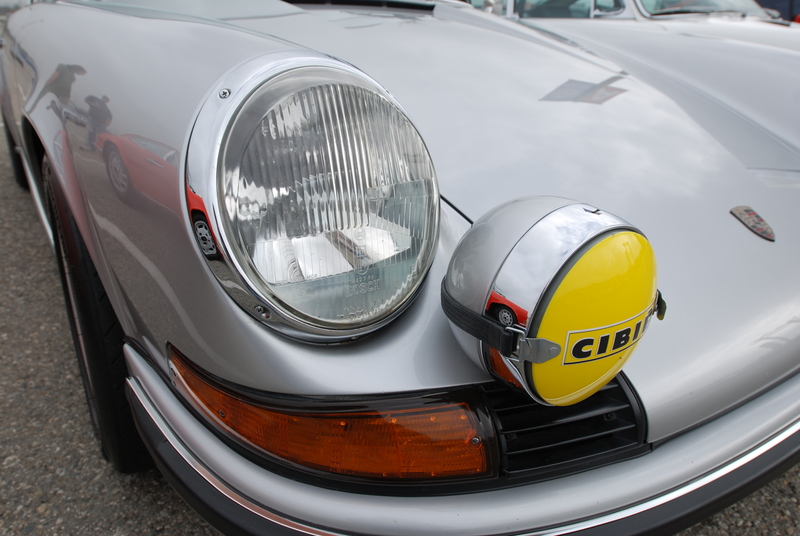 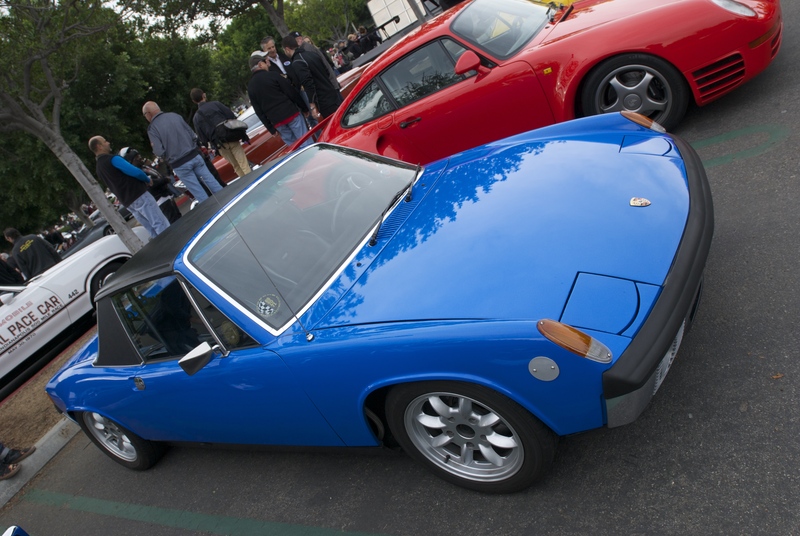 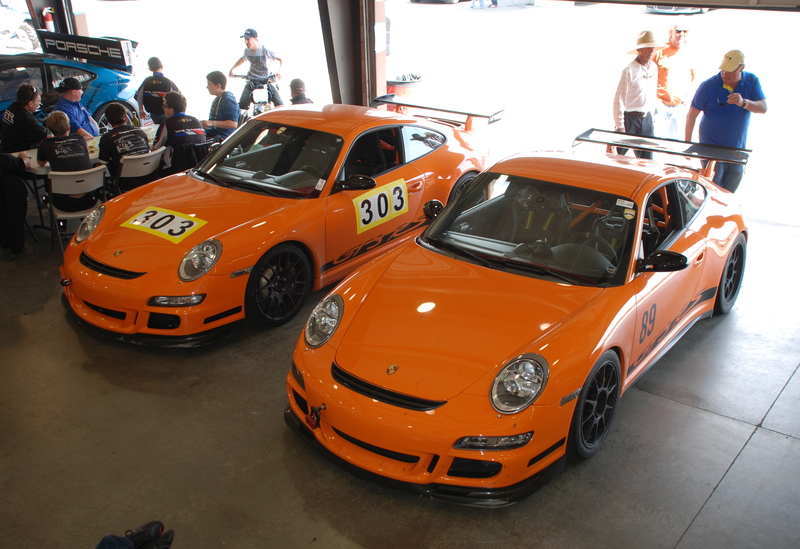 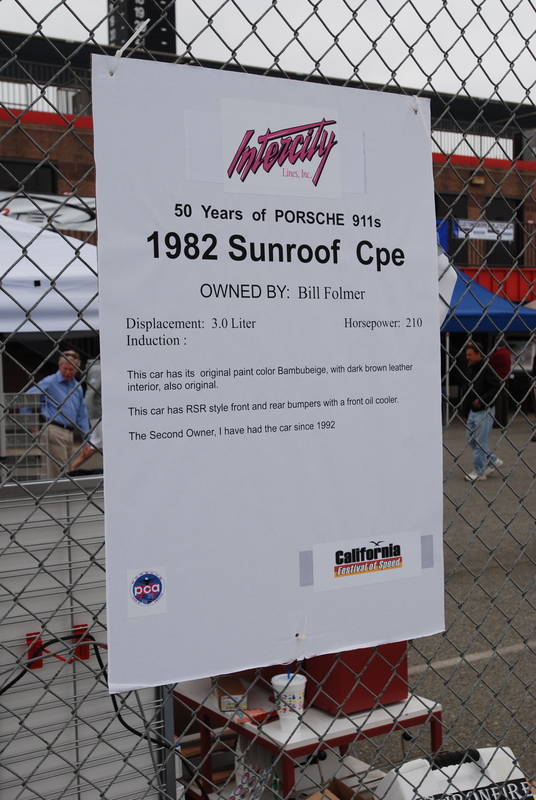 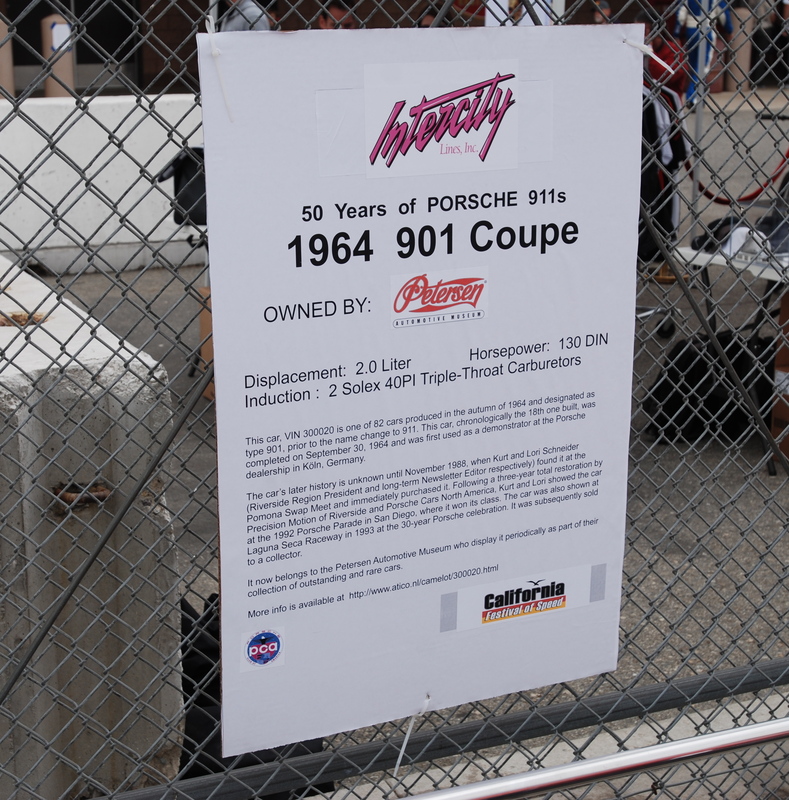 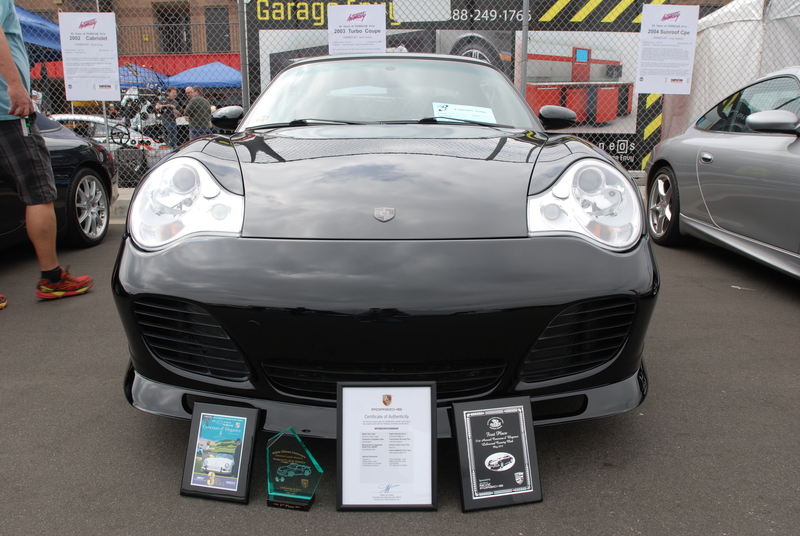 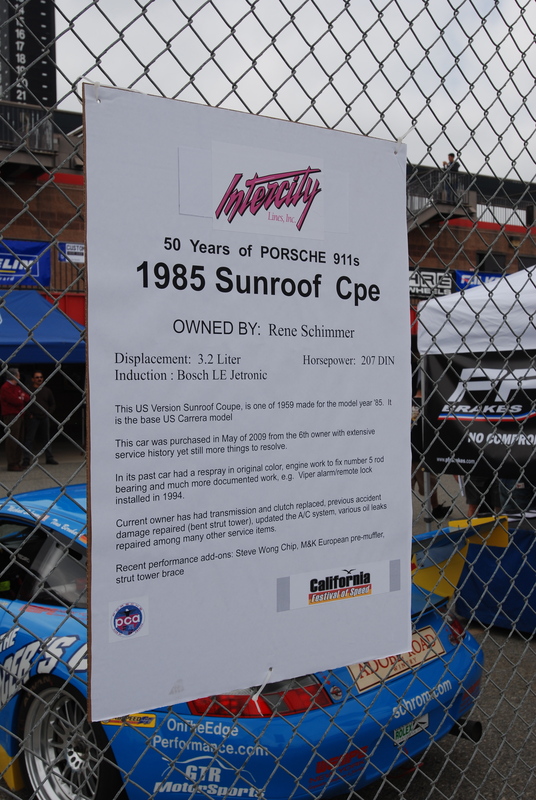 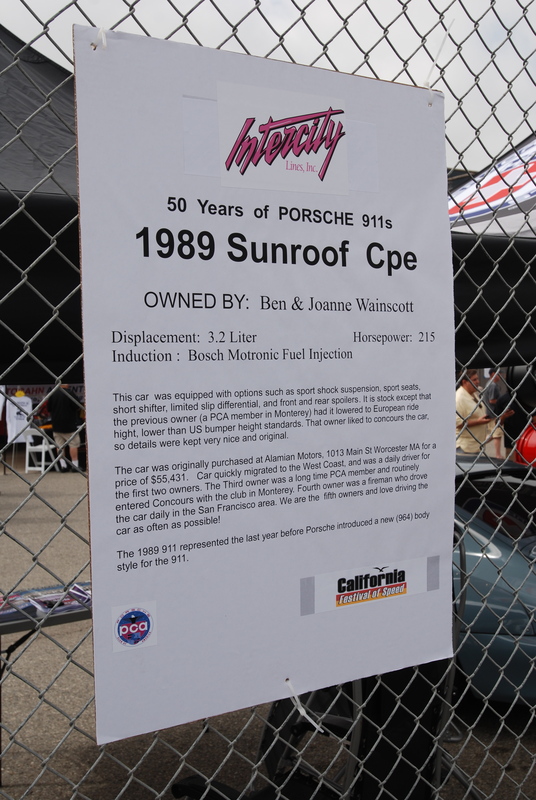 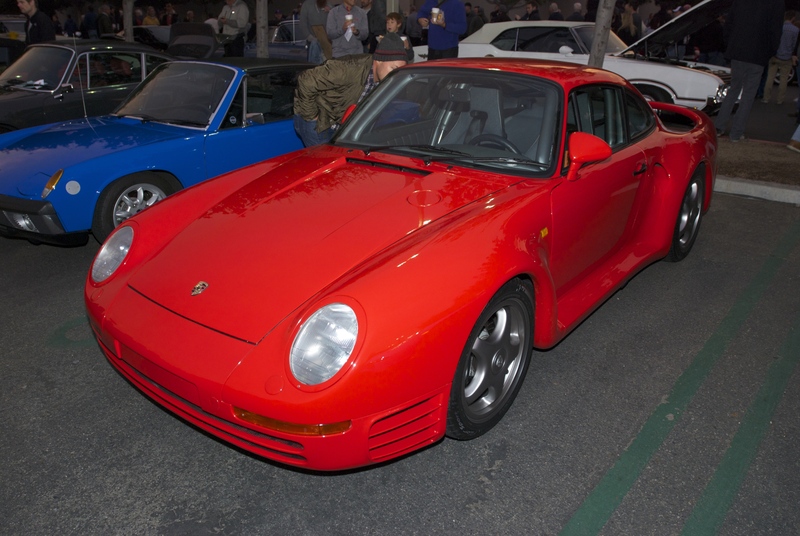 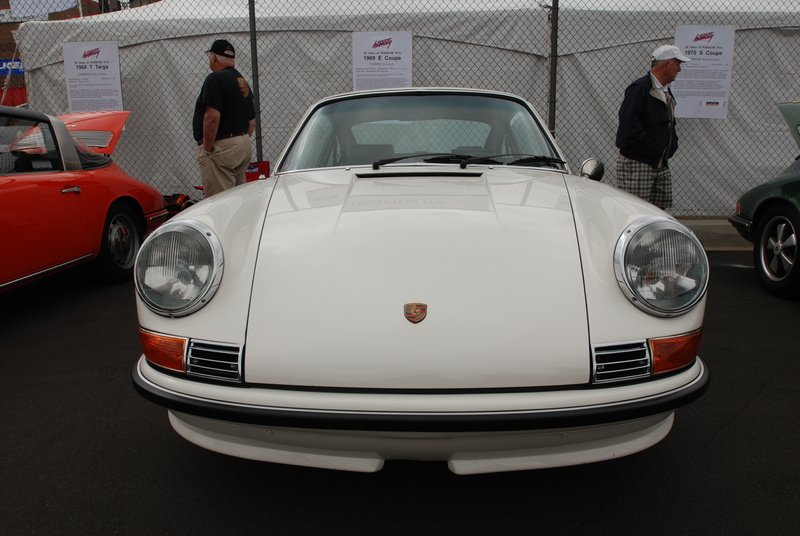 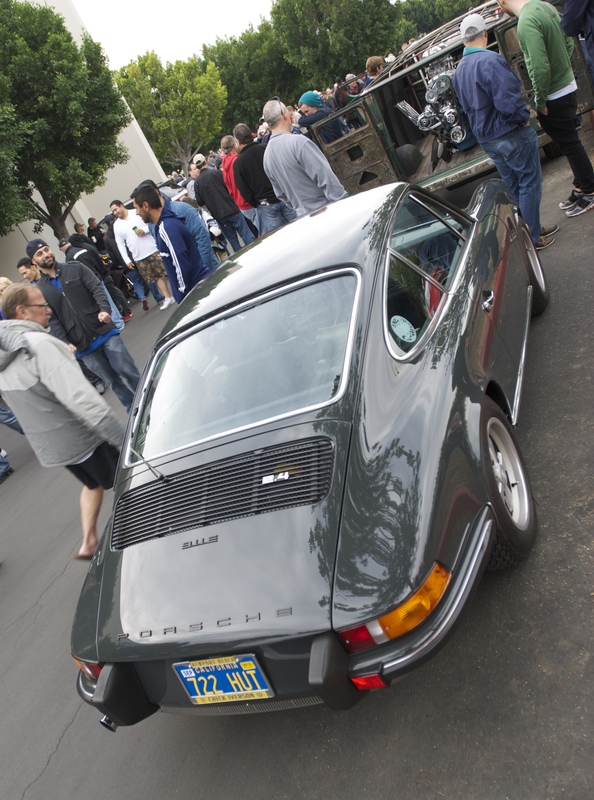 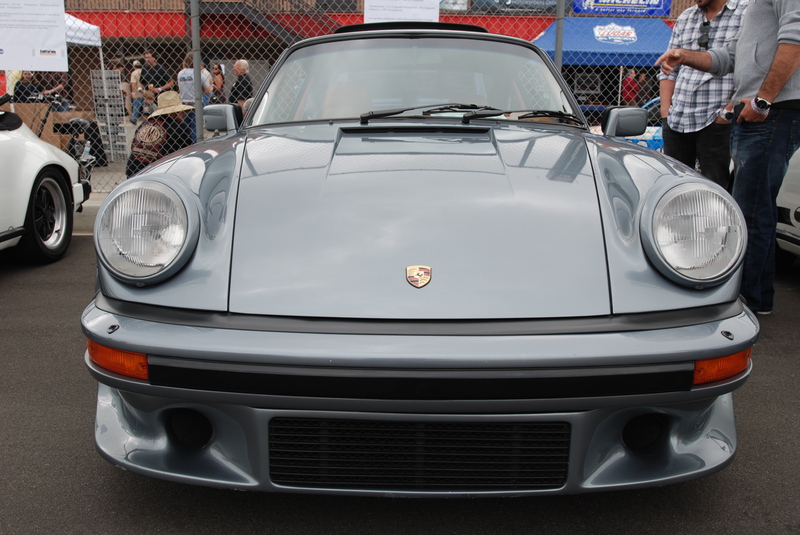 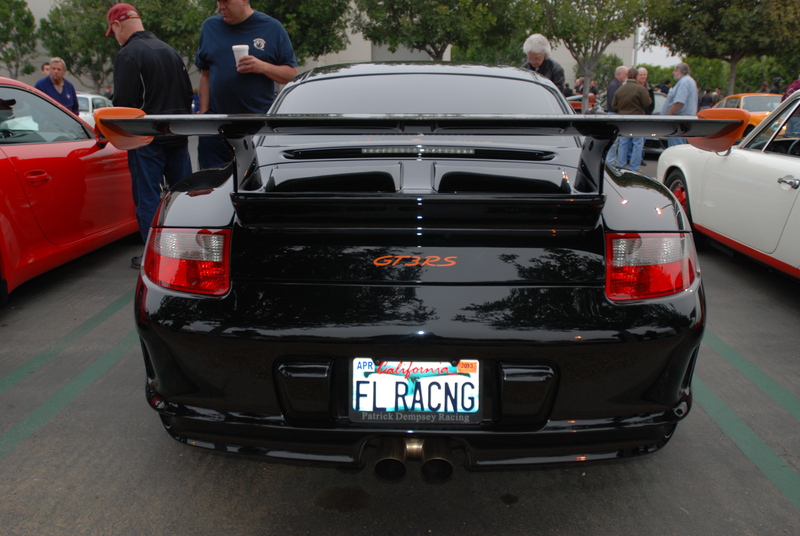 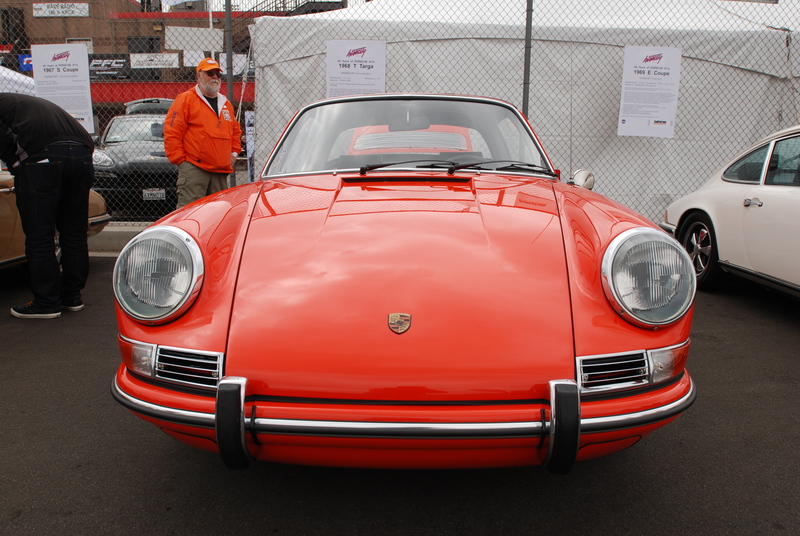 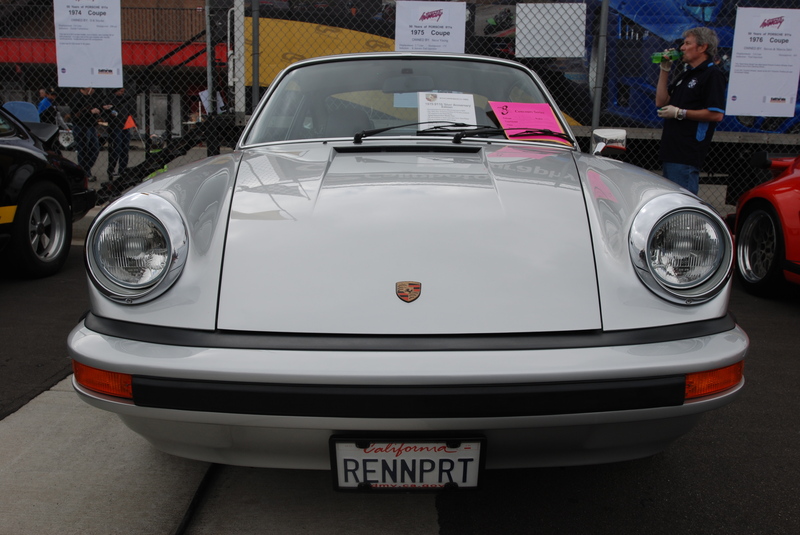 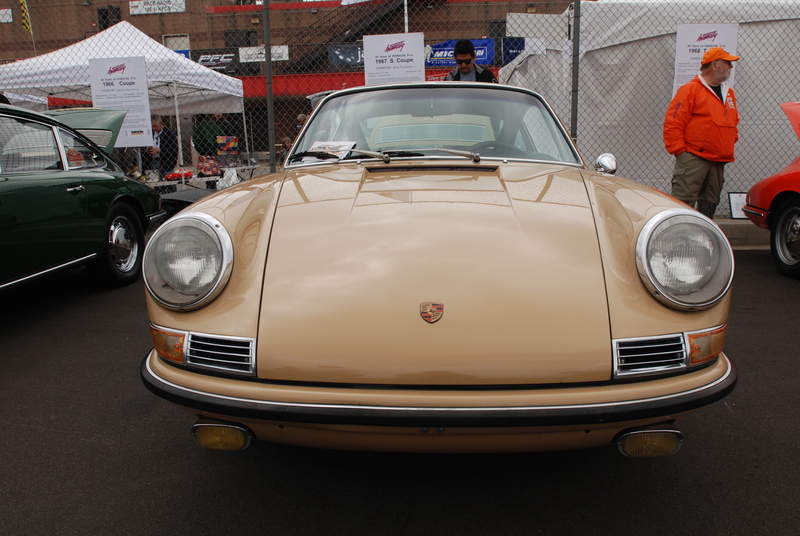 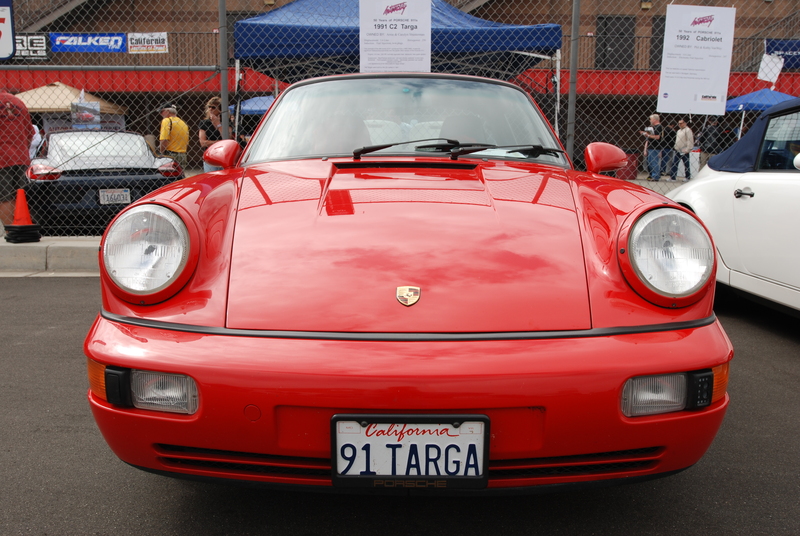 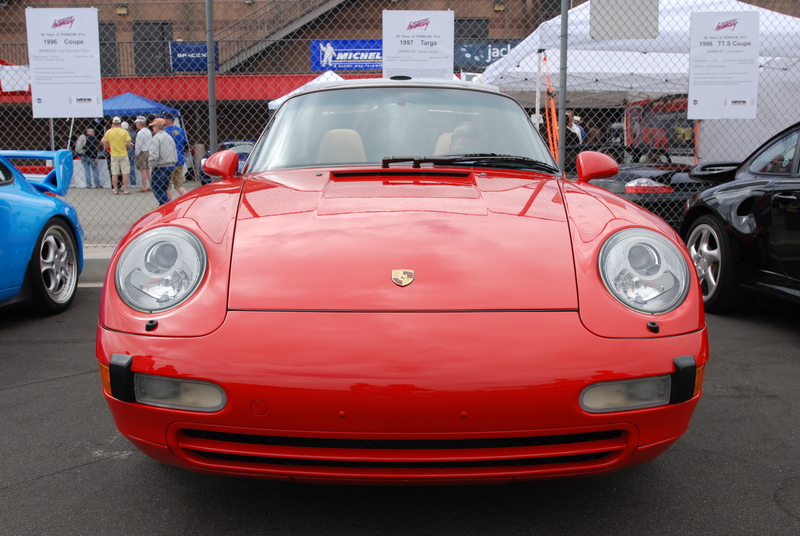 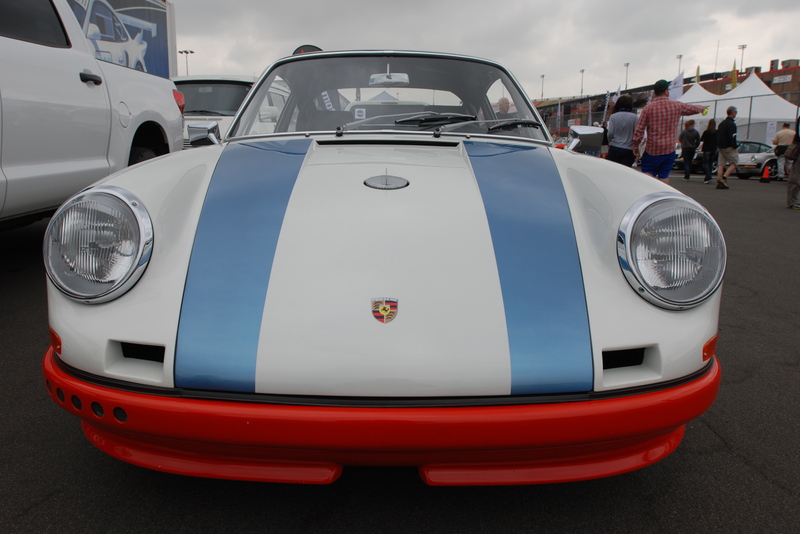 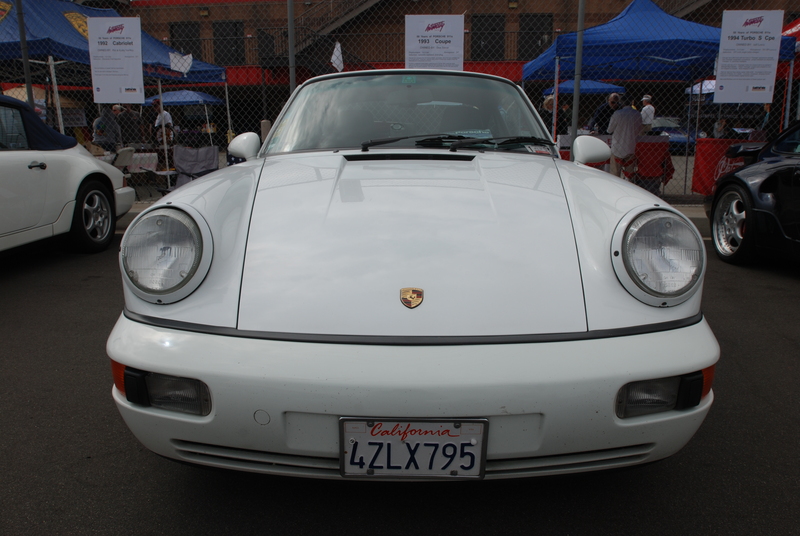 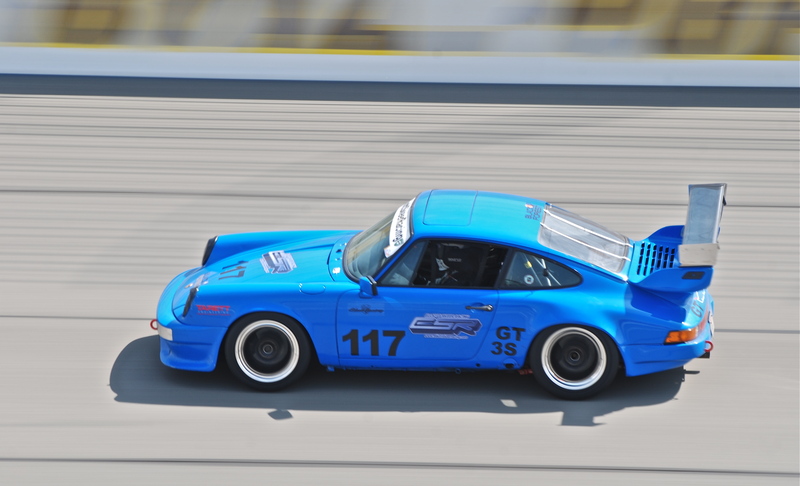 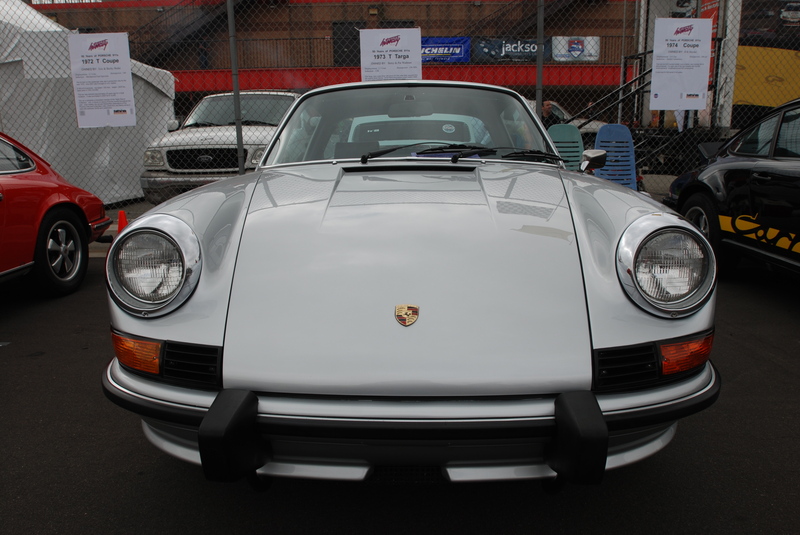 In addition to the regular activities listed for the weekend (Swap meet, Concours, Zone 8 Club Racing and Autocross, and Vendor row), Saturday had been selected for the 50th Anniversary celebration of the Porsche 911 event. 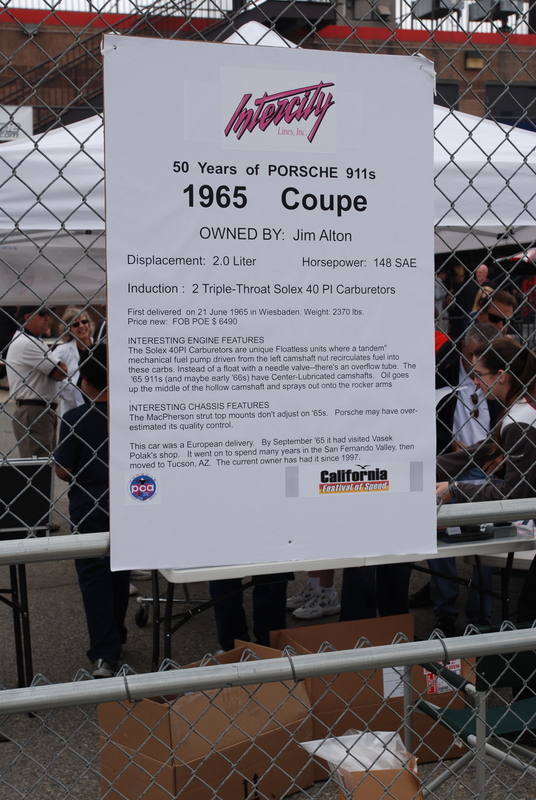 Given the sheer number of people crowded around the 50th anniversary display, this focused event would prove to be a huge success (see photo below). 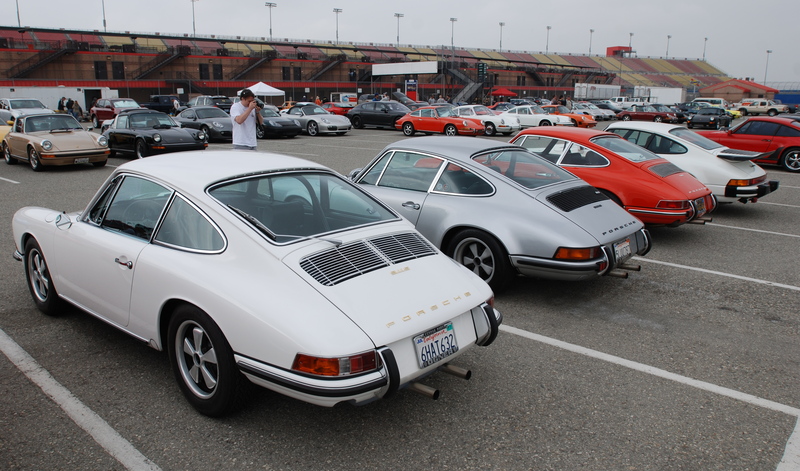 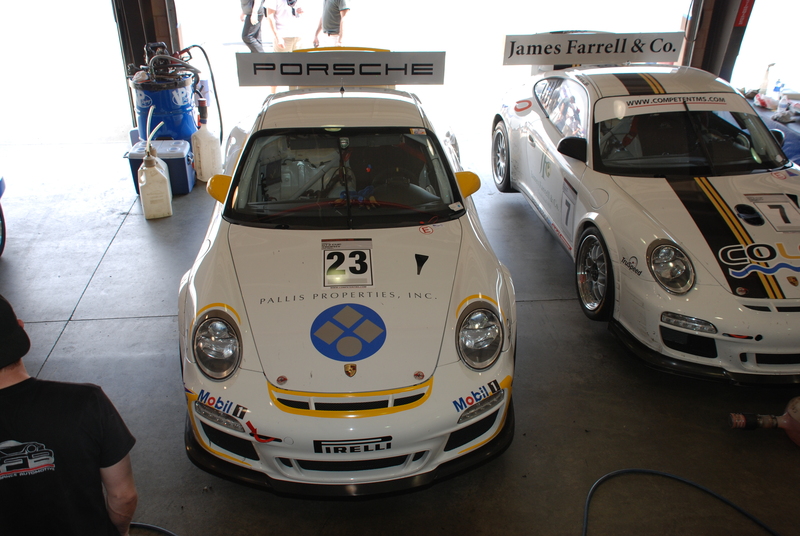 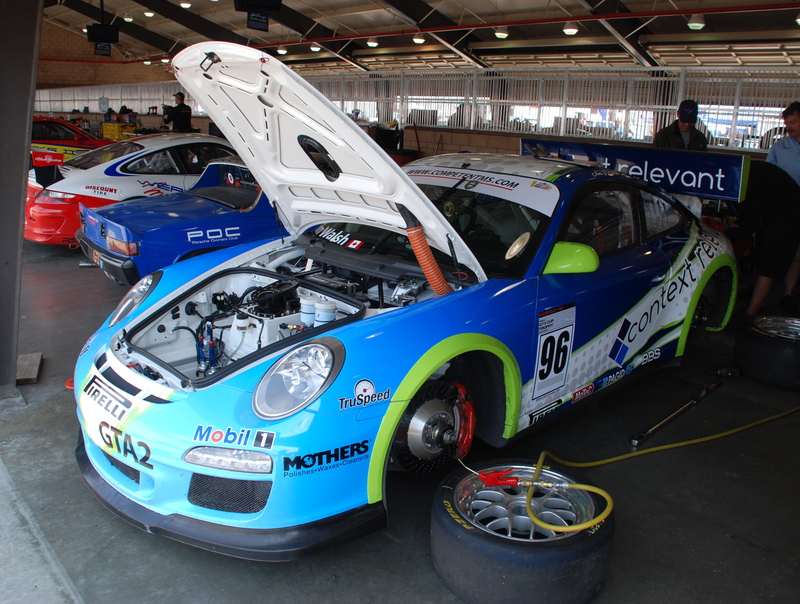 But even before entering the track’s infield area, there were plenty of Porsches to be found within the Porsche Corral (i.e. 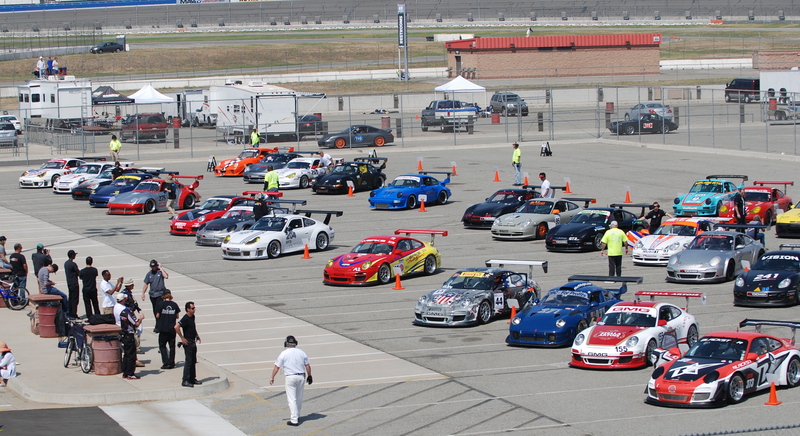 Porsche only parking lot). 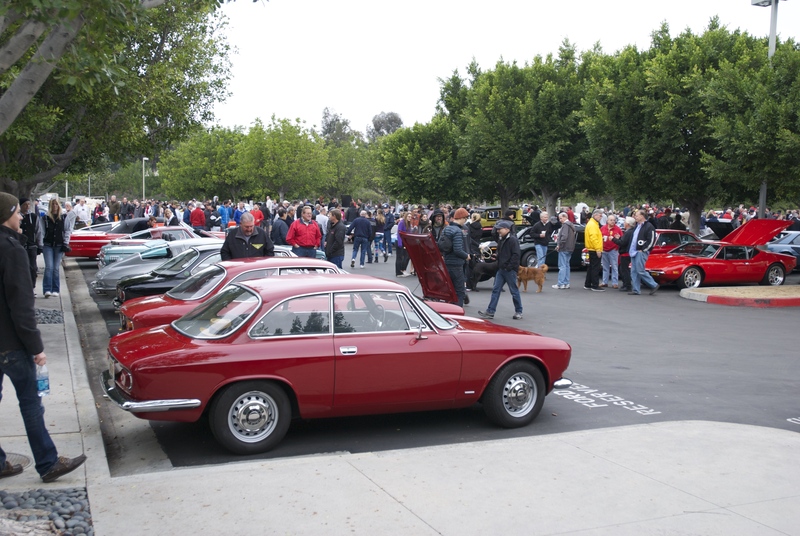 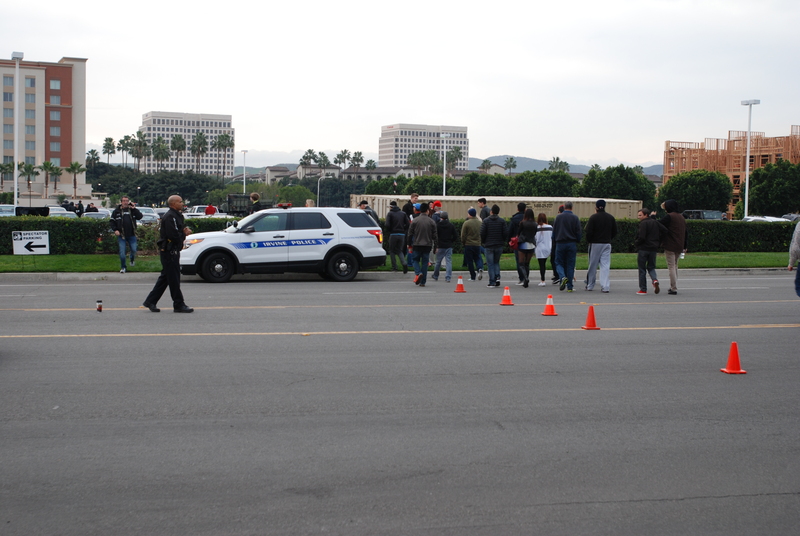 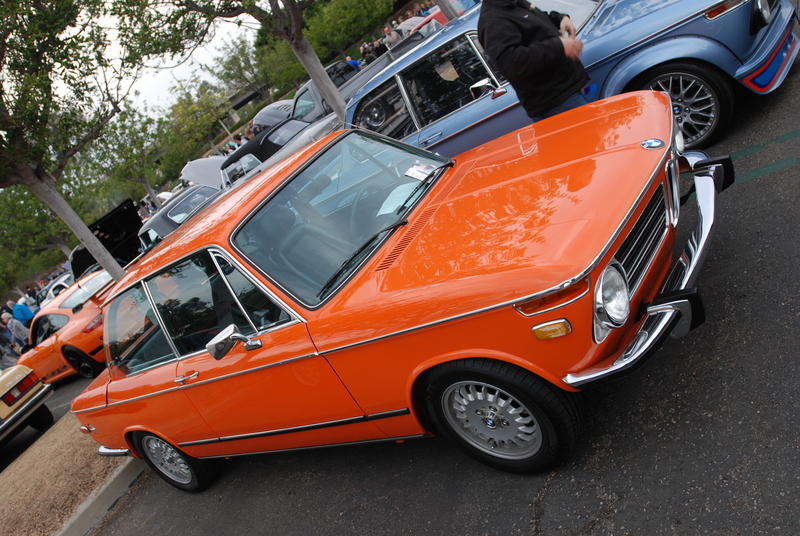 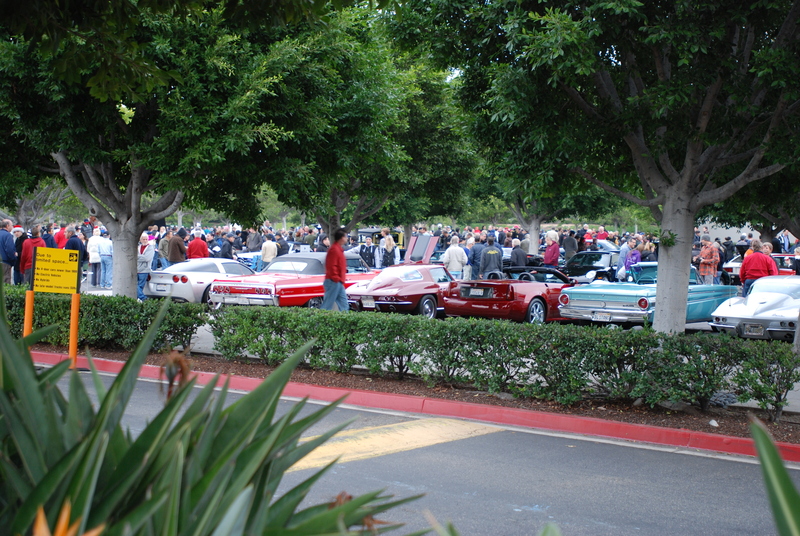 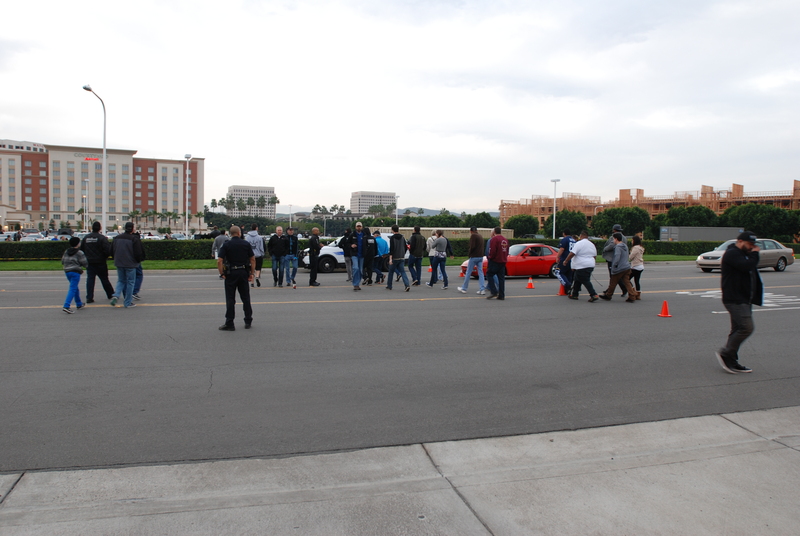 This area became its own mini car show, with a diverse cross-section of model years and body styles represented. 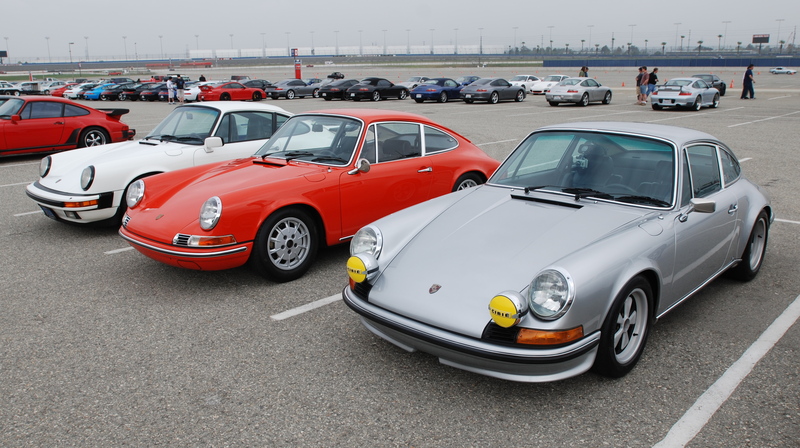 I later came to find out that the trio of early model Porsche 911’s that I was parked next to, belonged to three generations all from one family; the grandfather and his white 1967 911S, his sons silver 1972 911S, and his grandson’s orange 911T. 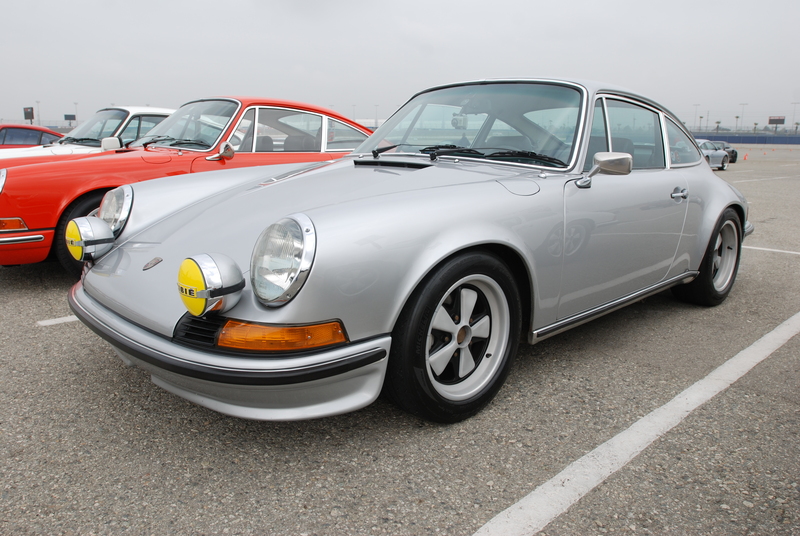 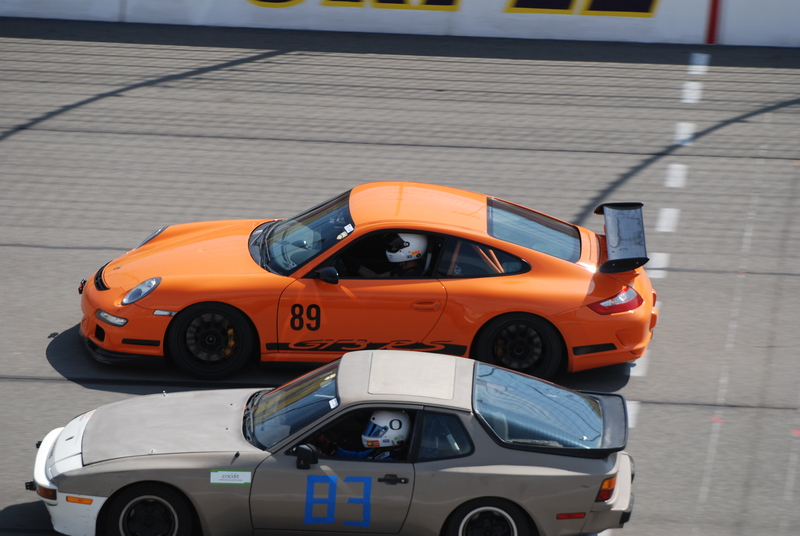 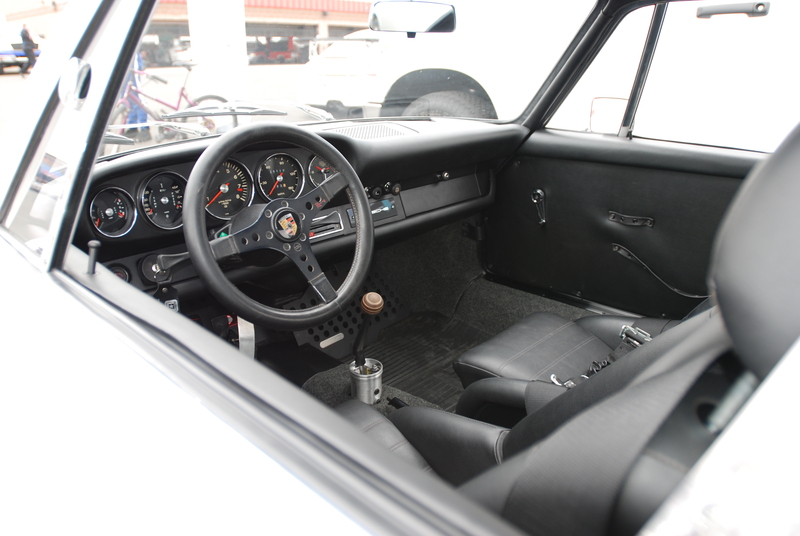 Even more impressive was the fact that the grandson had just learned to drive a manual transmission vehicle three days earlier, behind the wheel of the very same orange Porsche 911 T that he drove to the show. 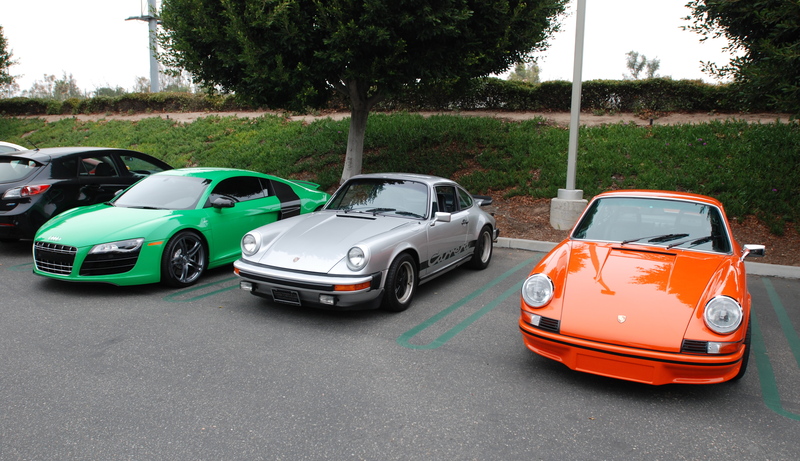 Three generations all with a passion for Porsche, and just one of many examples reflective of the success of the Porsche brand. 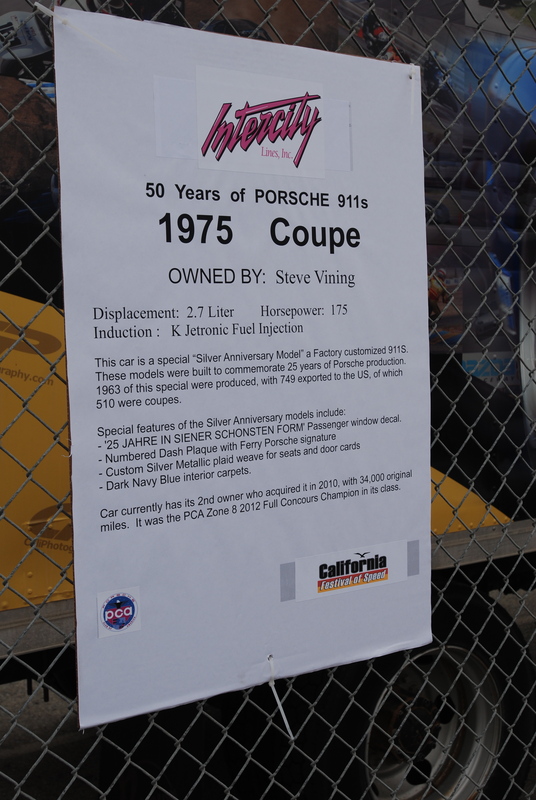 Word had gone out to the Porsche community back in February, that the Porsche Club of America was looking for owners (from within the Zone 8, PCA regions), with Porsche 911s representing model years 1964 through 2013, to participate in a 50th anniversary celebration of the Porsche 911, to be held at the California Festival of Speed weekend in early April. 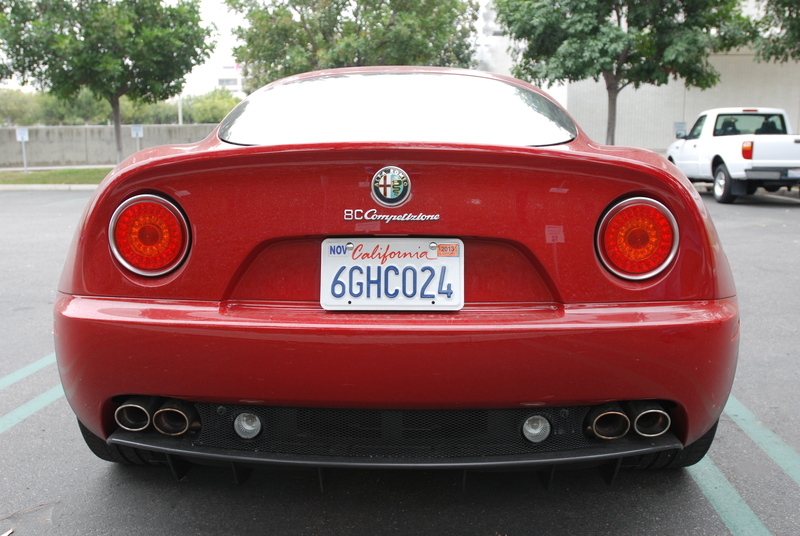 Owners were requested to submit information about their car and also include a photo for review. 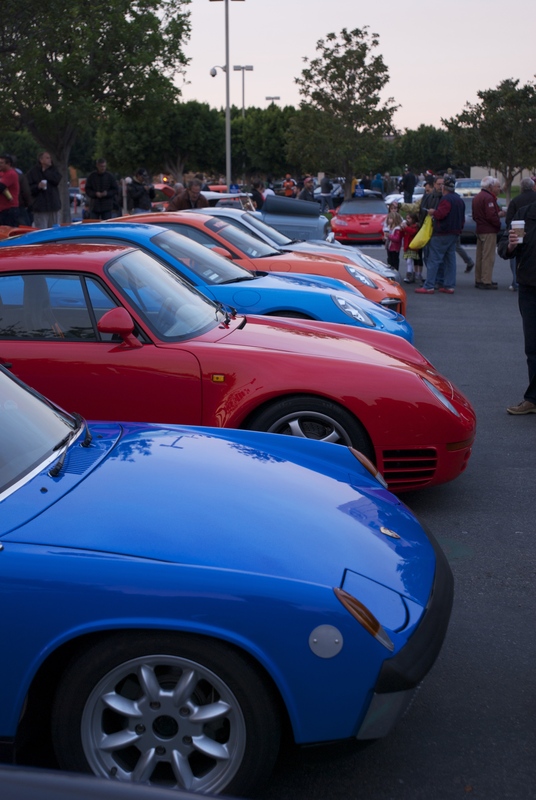 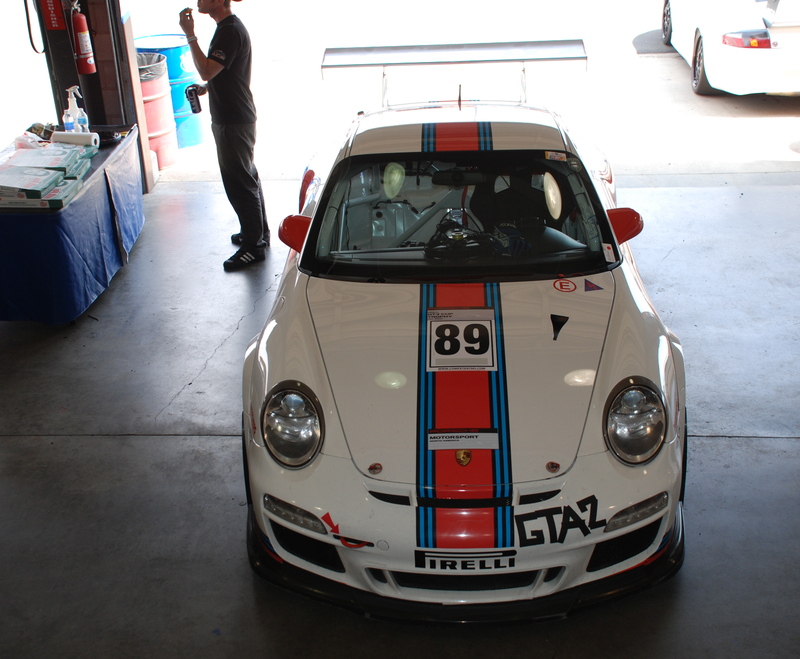 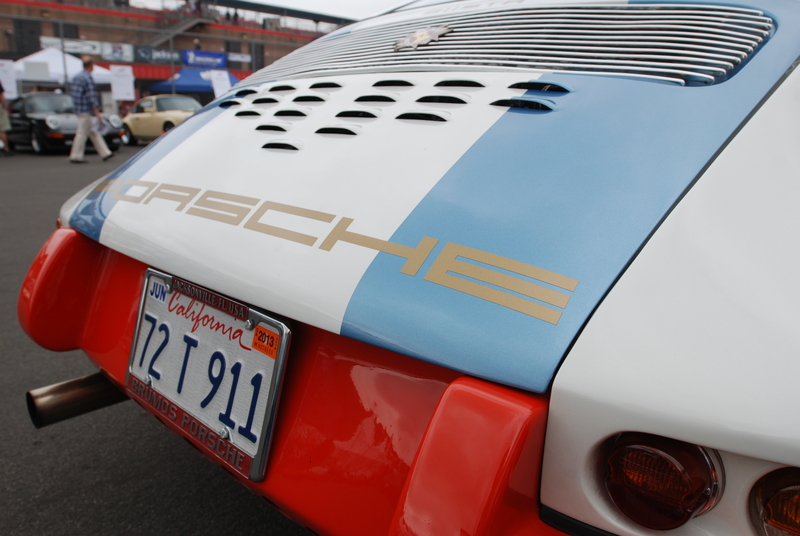 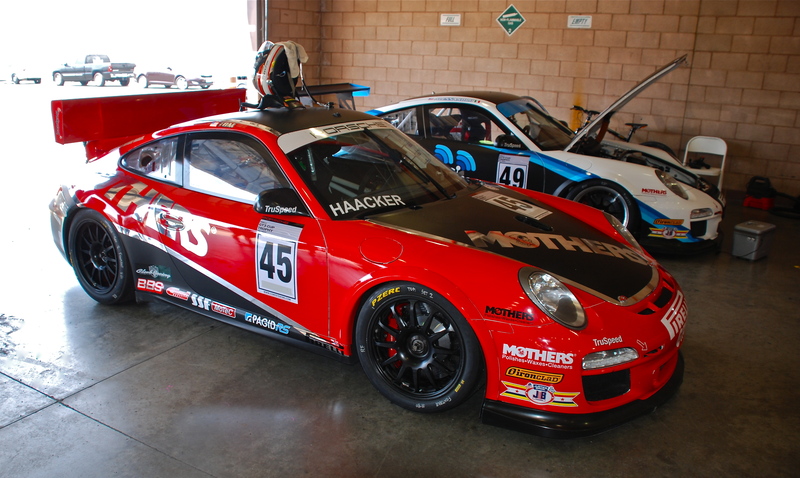 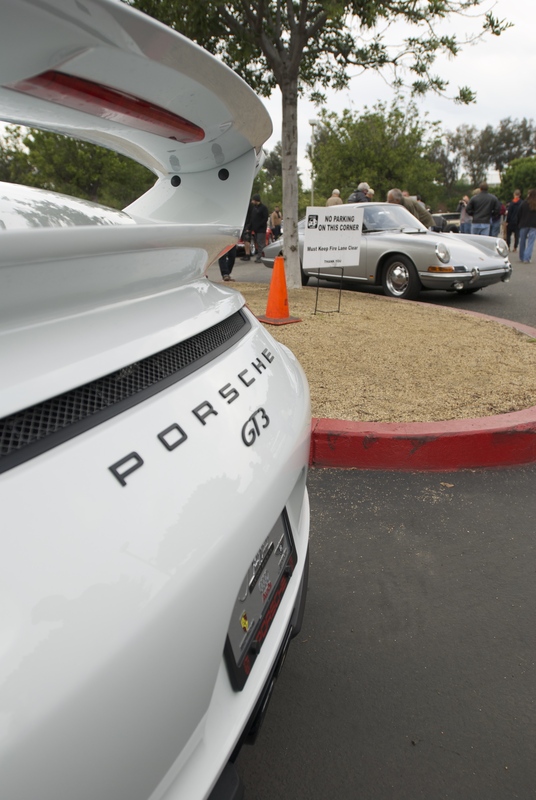 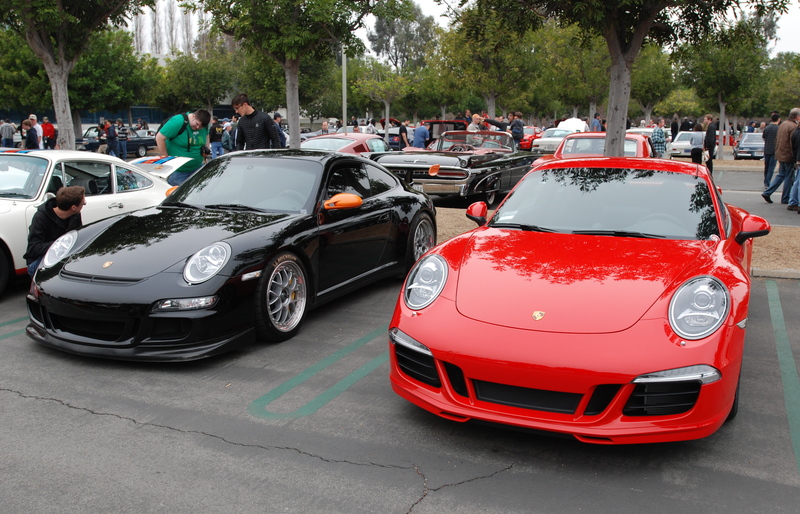 Given the sheer number of Porsches that reside within Southern California, this challenge was quickly met, and on the morning of the event, every production year was represented. 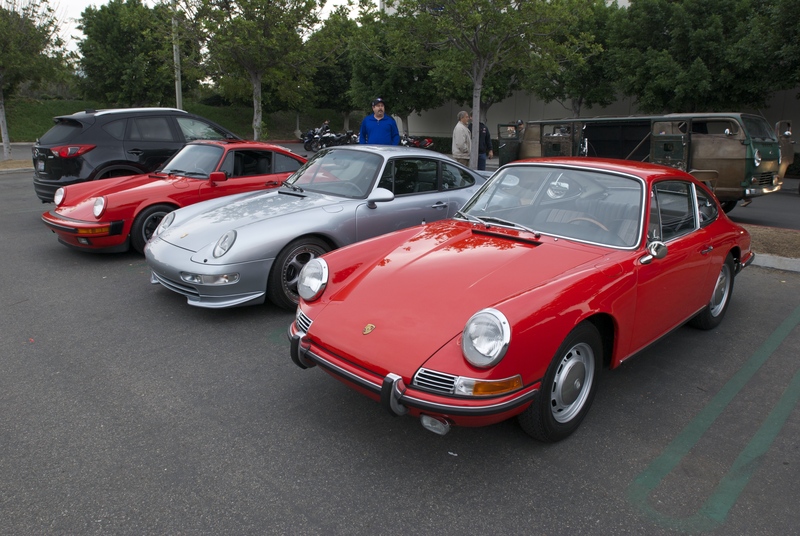 PCA had located models from the earliest example represented (an ultra-rare 1964 Porsche 901), to the present day model, a 2013 Porsche Type 991 911 Carrera S. The display was arranged by model year, beginning with the earliest model, starting at the left end of the row and then moving chronologically to the right. 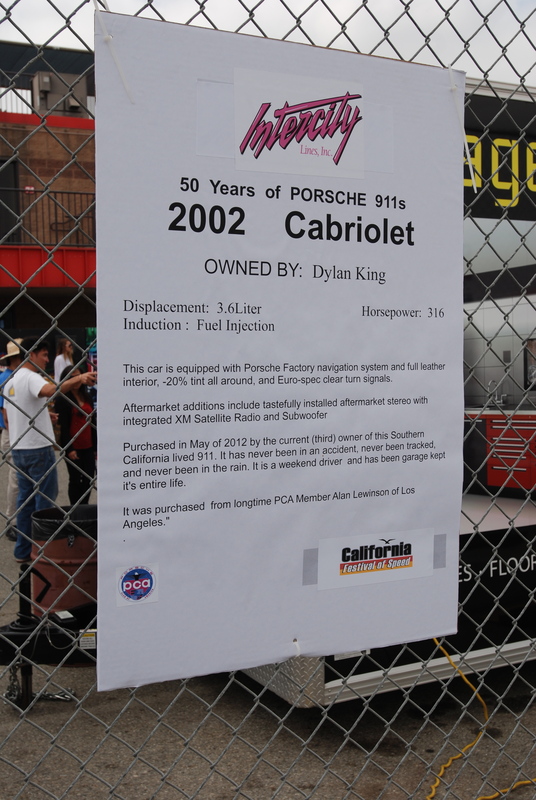 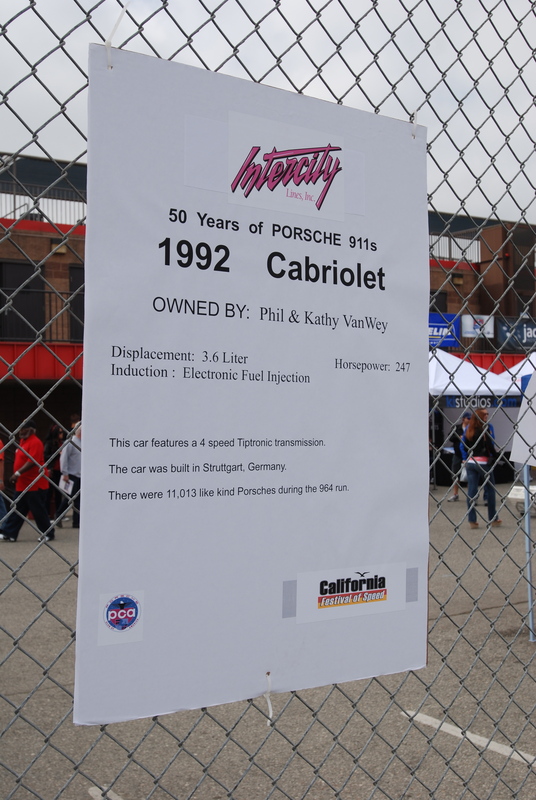 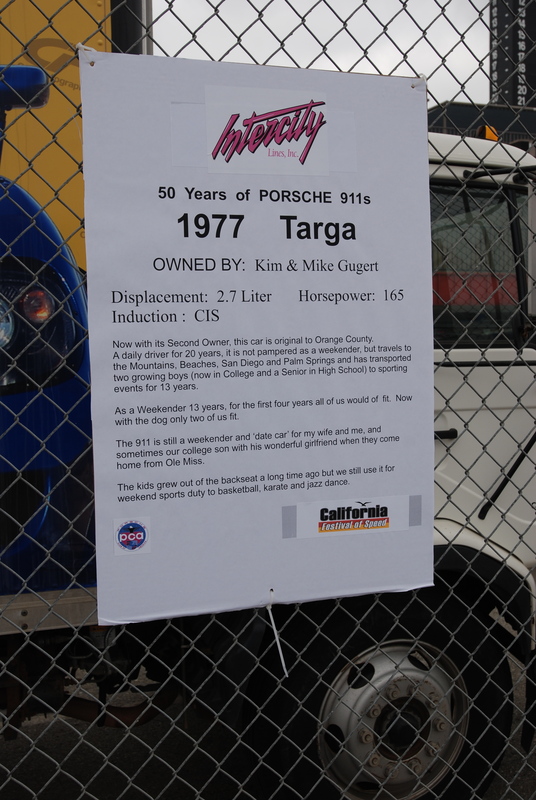 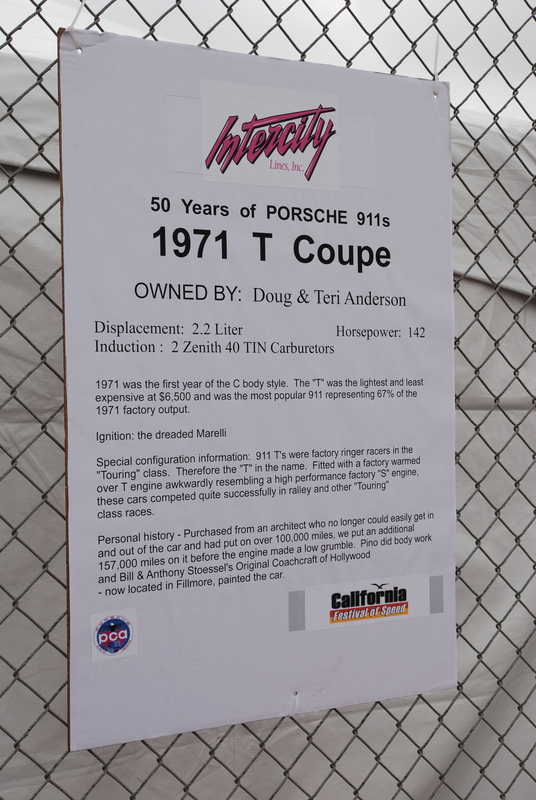 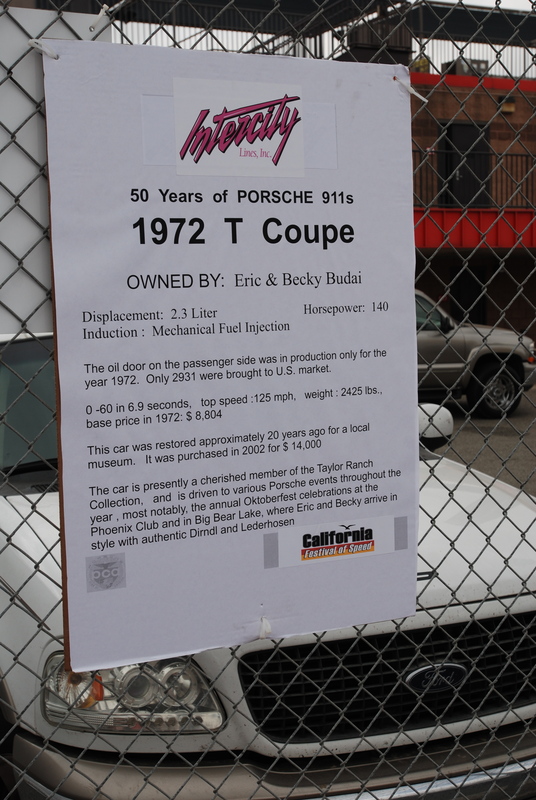 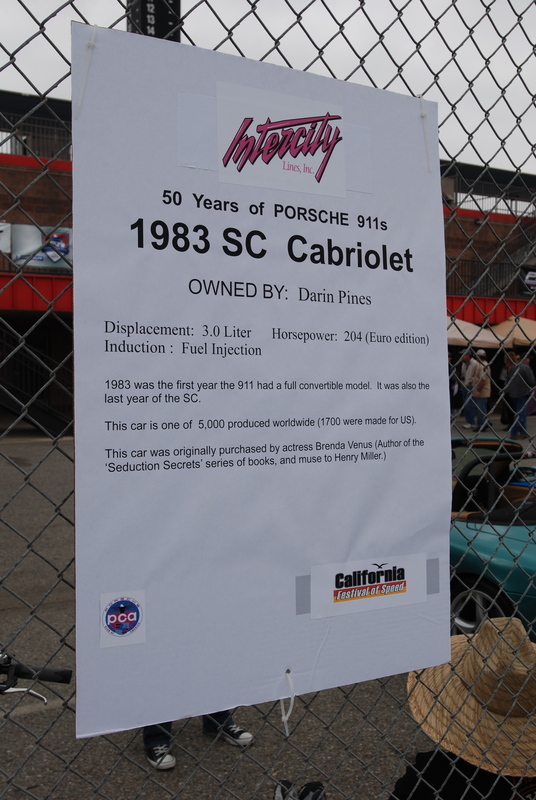 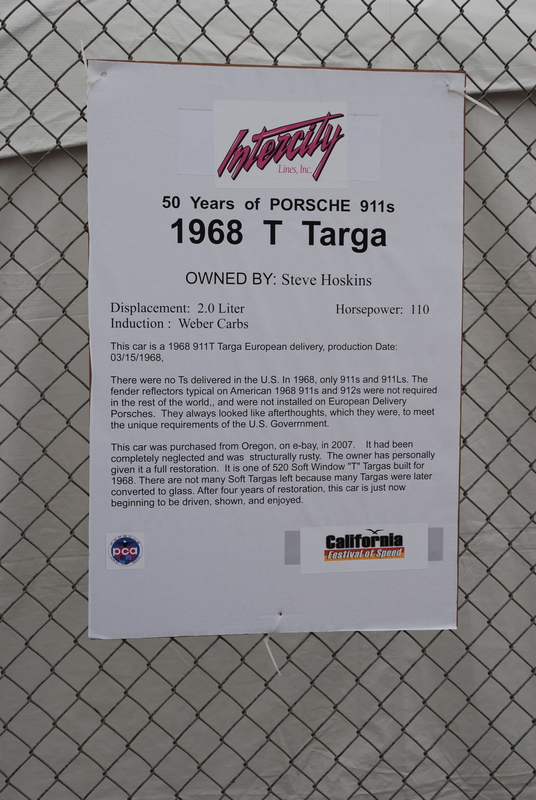 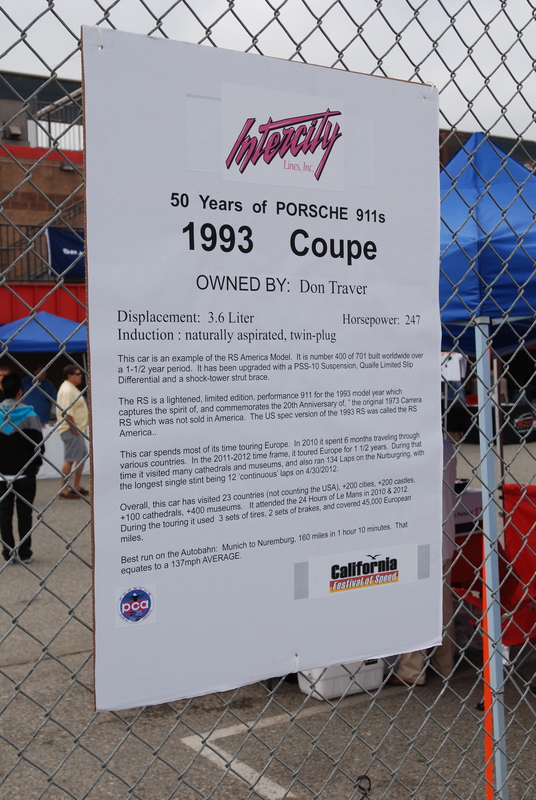 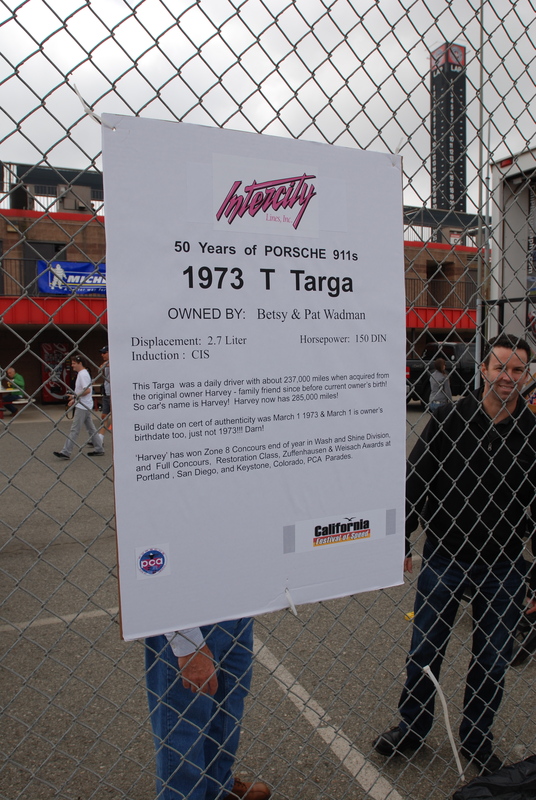 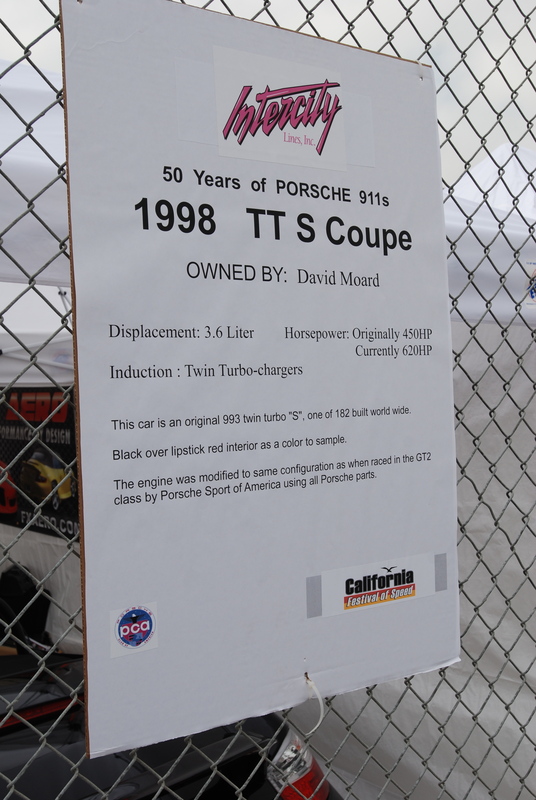 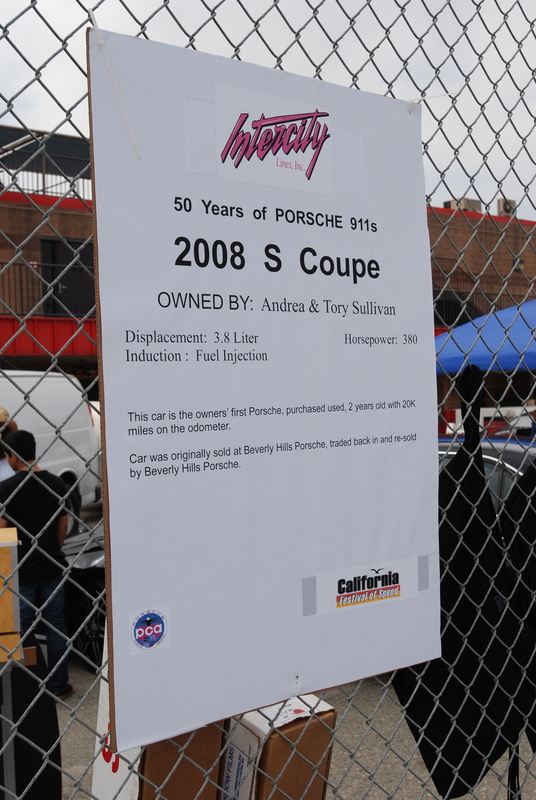 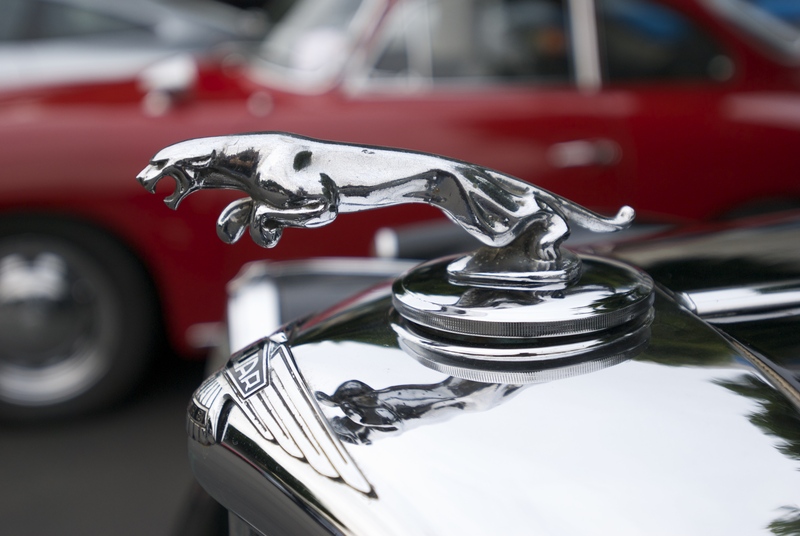 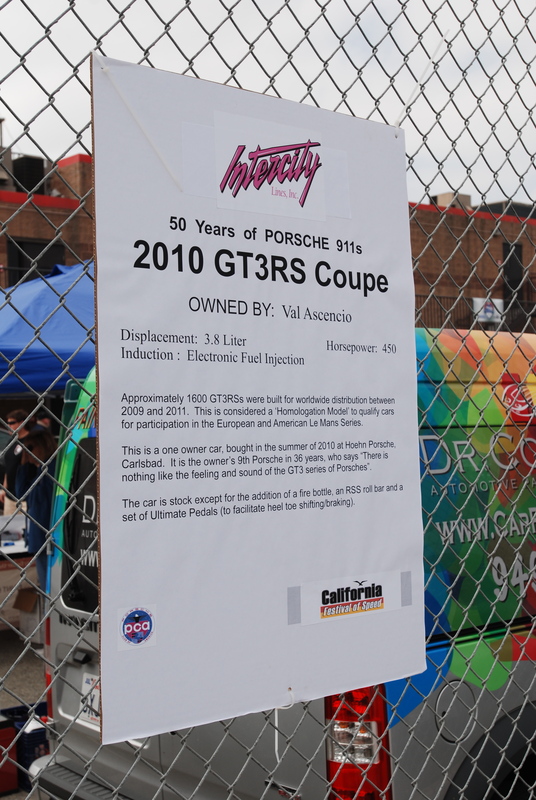 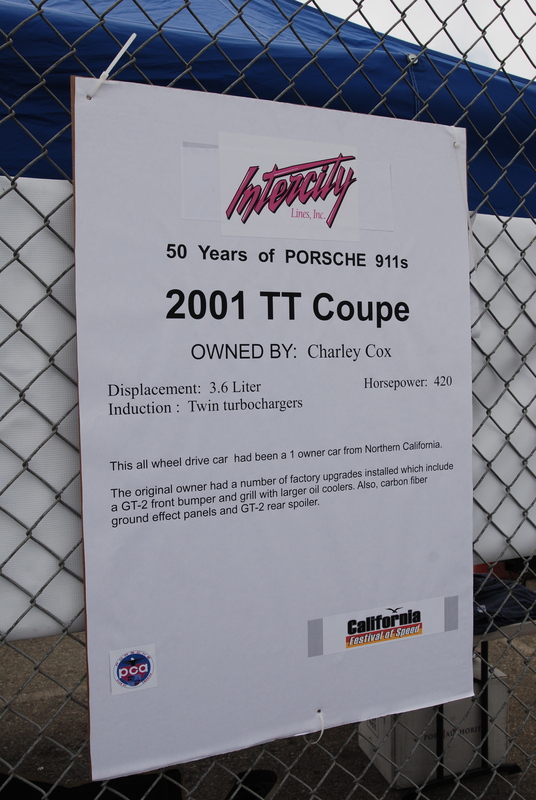 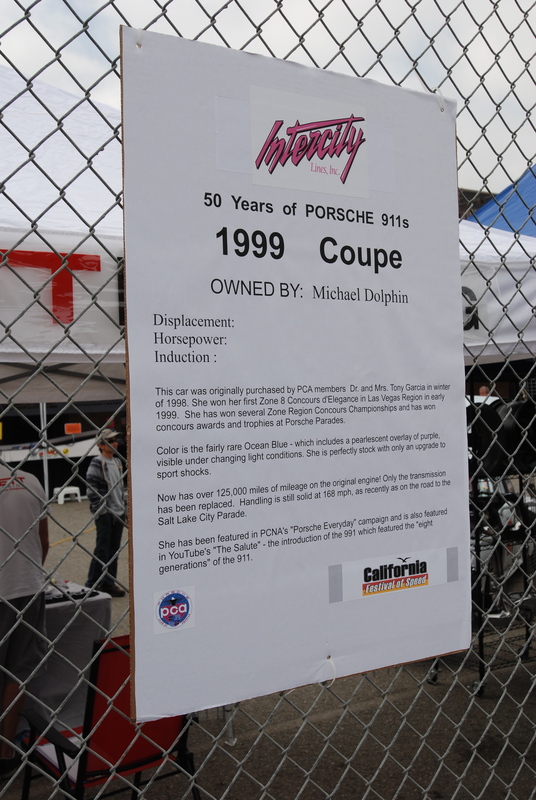 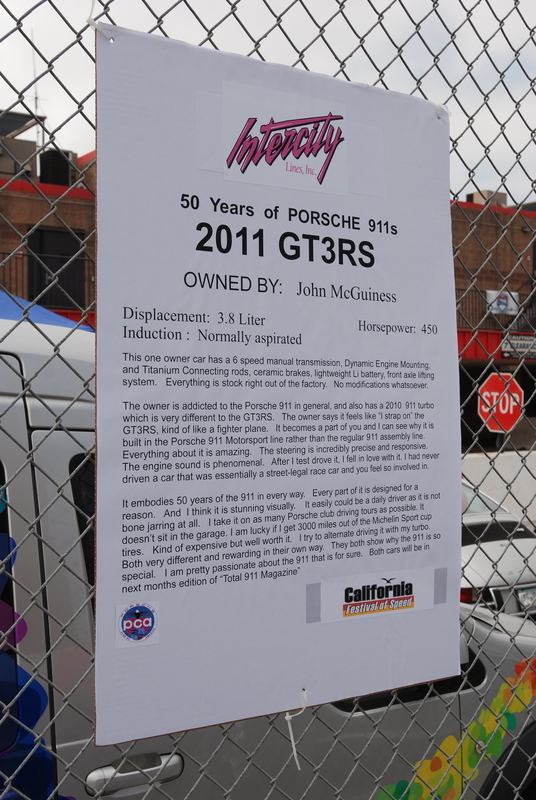 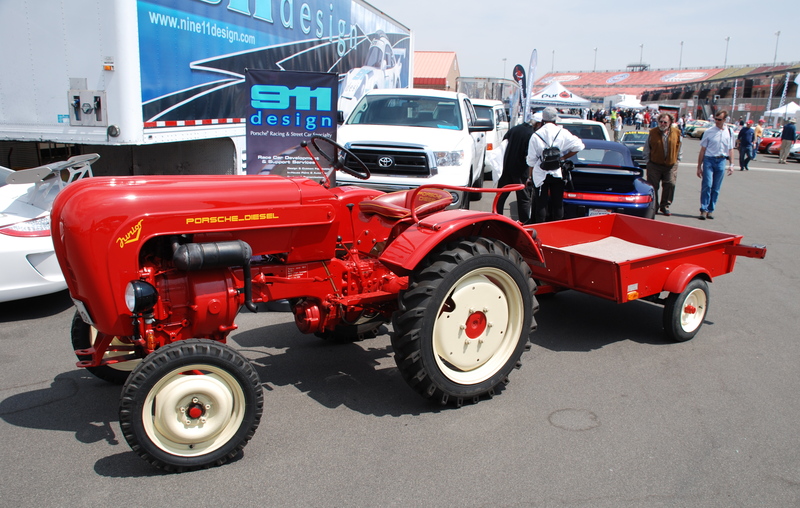 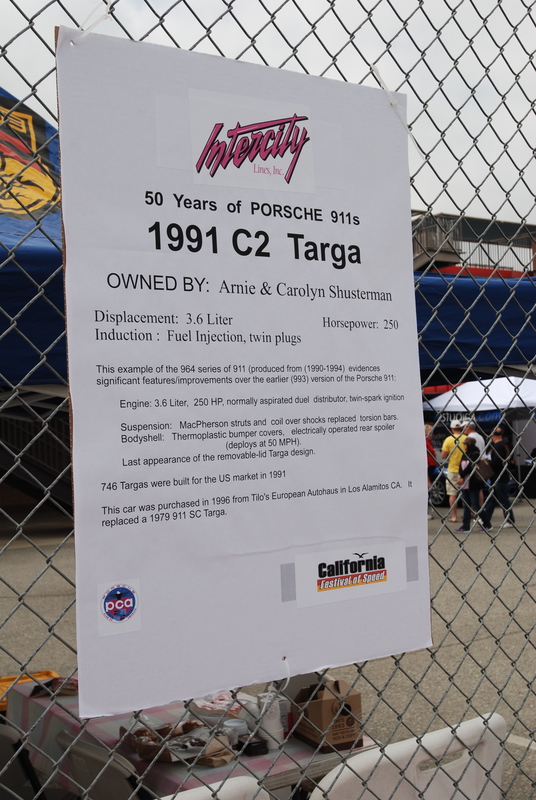 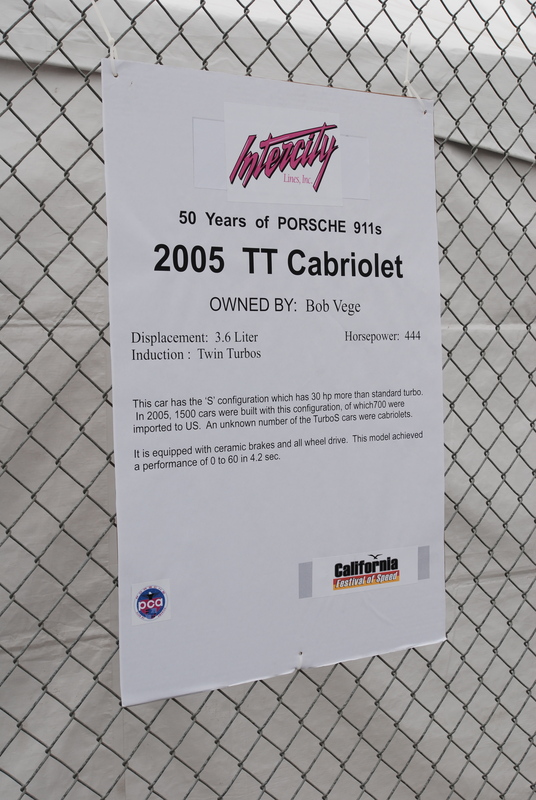 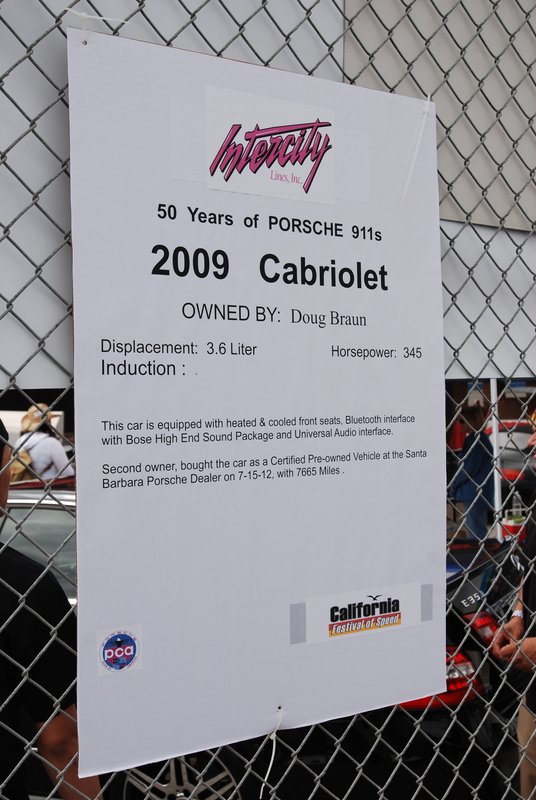 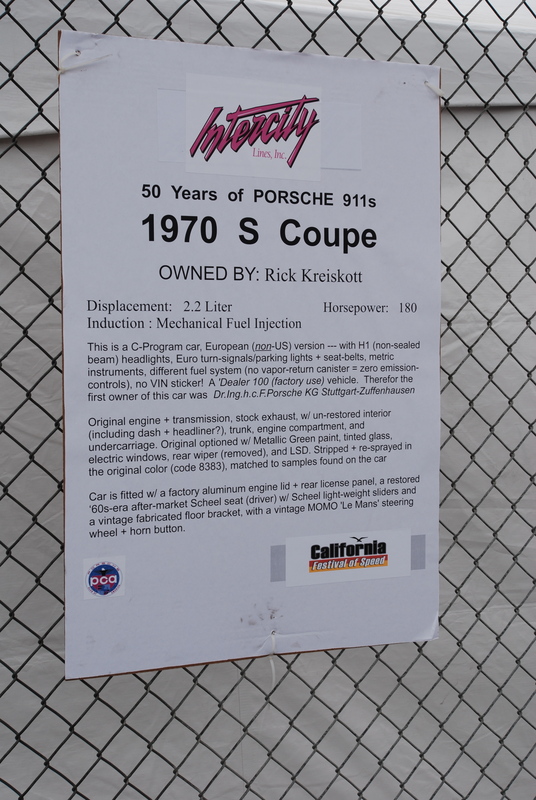 Each vehicle was also displayed with a printed biography, mounted behind each car on the chain link fence, and which served as the backdrop for the entire display. 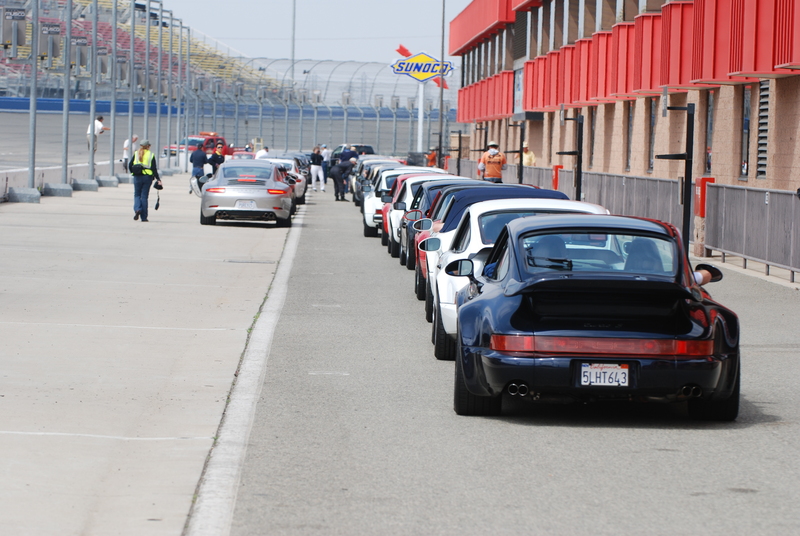 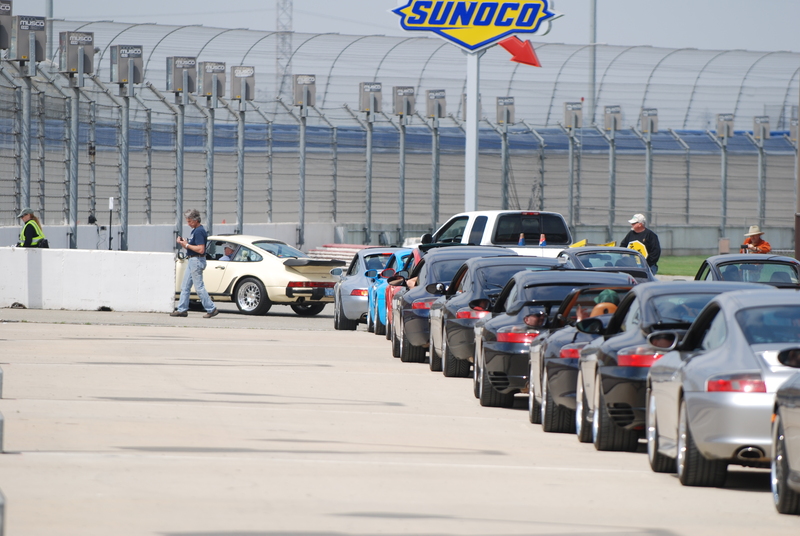 Around 11:30 AM, all of the participants and their cars were gathered up for a group photo, to be taken out on the race track at the start / finish line; queued up on pit lane, ready to head out onto the track (as seen below). 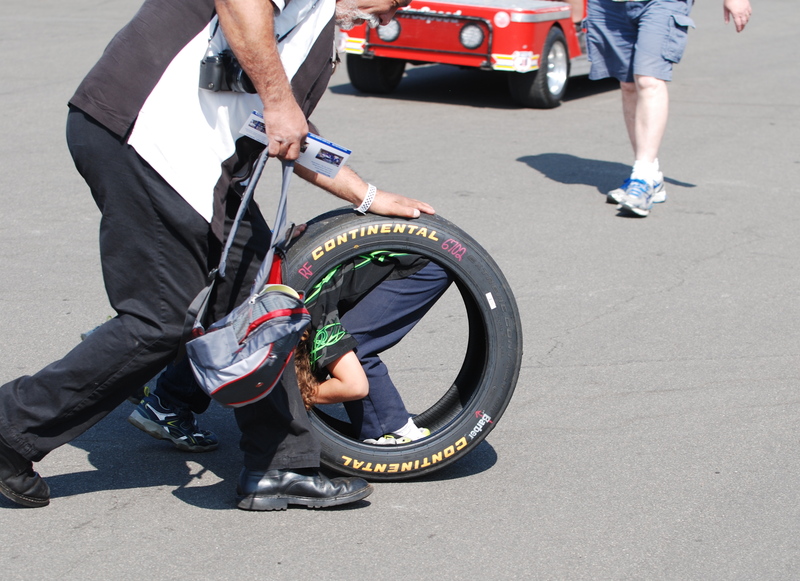 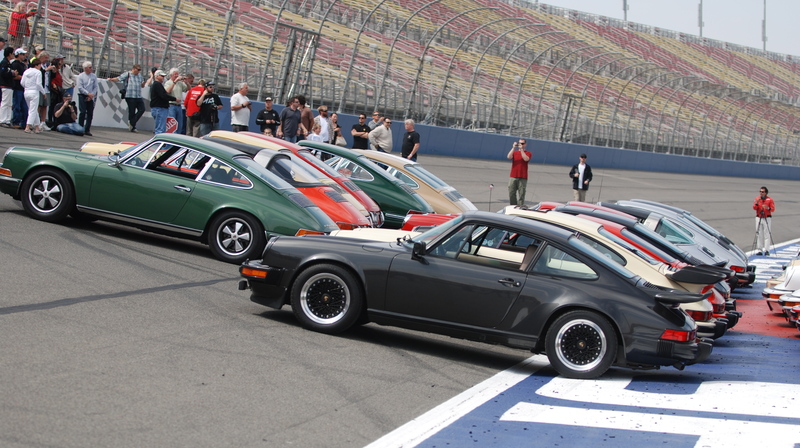 Once all of the cars had gathered on pit lane, they were then released out onto the track to begin their staging for the group shot (see below). 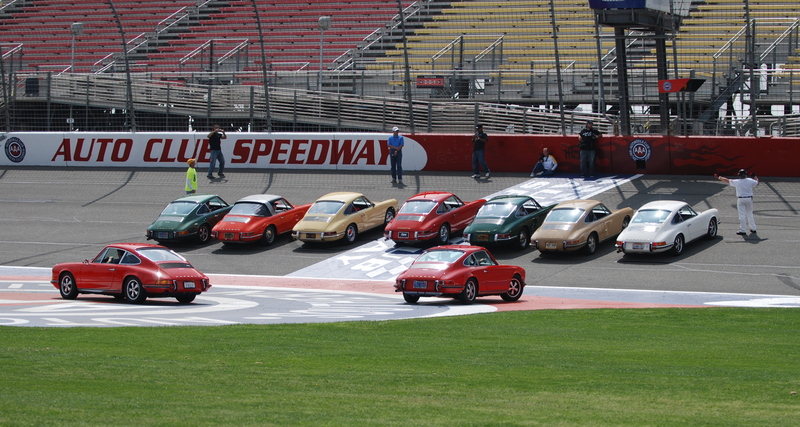 Fourth row of assembled Porsche 911s from the group photo (below). 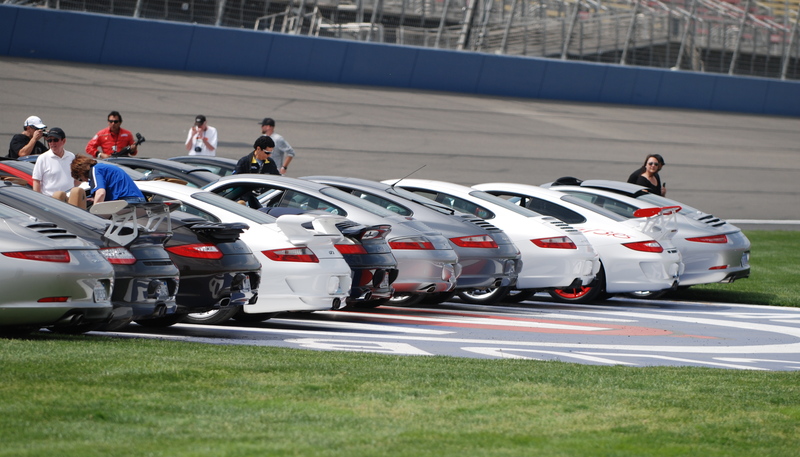 With all of the cars aligned and the owners positioned outside of their cars, a series of photos were taken, and upon completion, the vehicles were quickly reorganized and then sent off to enjoy several parade laps around the race track. 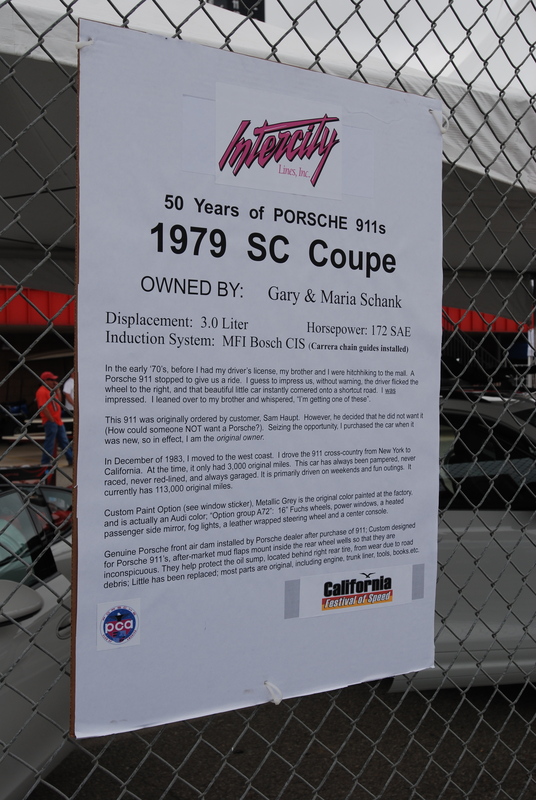 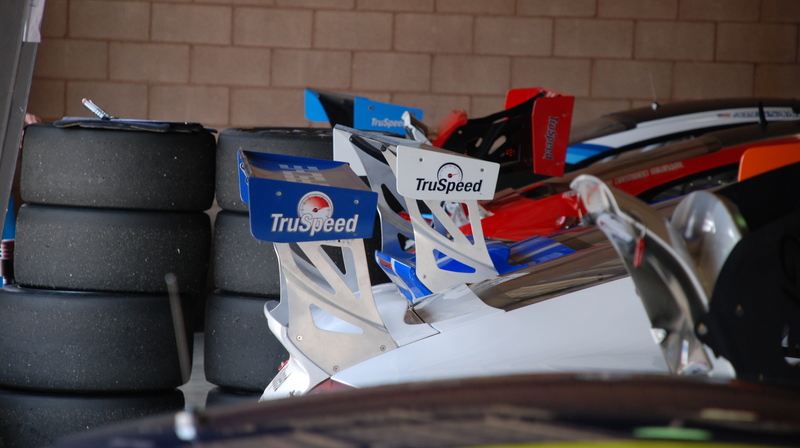 Please stay tuned for my continued coverage from the California Festival of Speed / Part 2; featuring Club racing, vehicle encores and debuts. 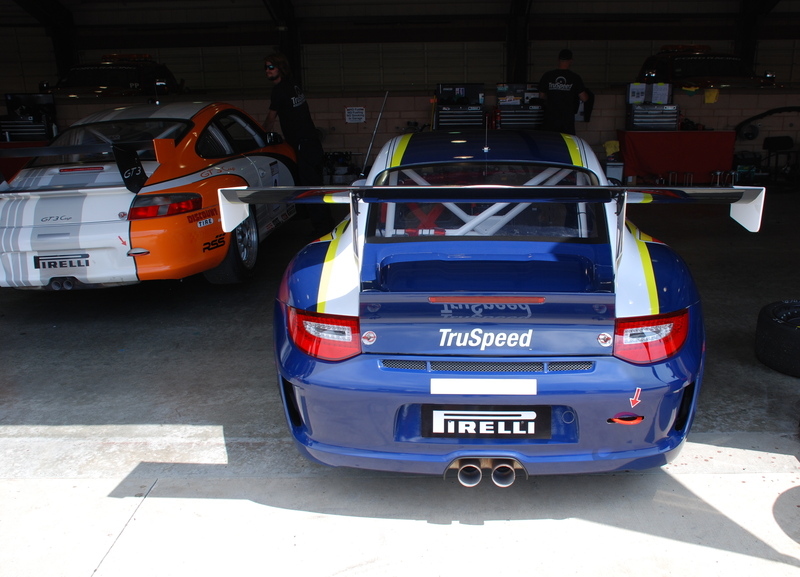 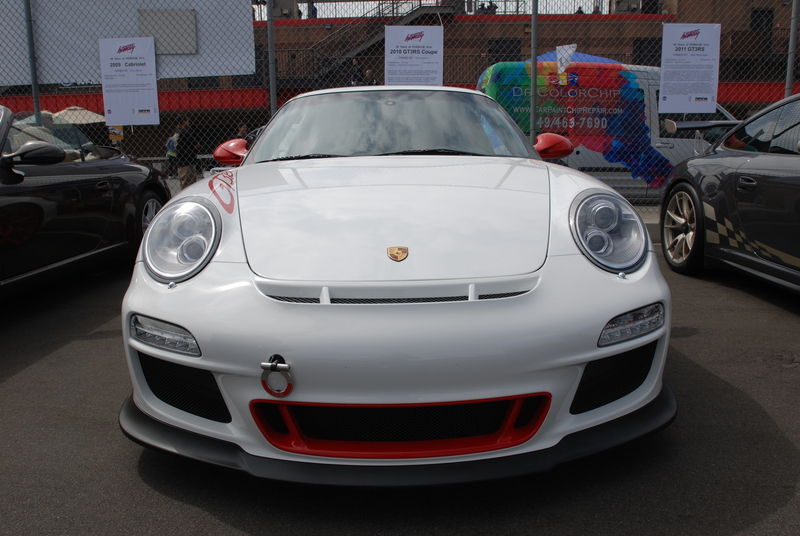 complete with the Aerokit cup option; a performance inspired front spoiler and fixed rear wing ( a smaller version of the rear wing found on the newly introduced Porsche GT3). 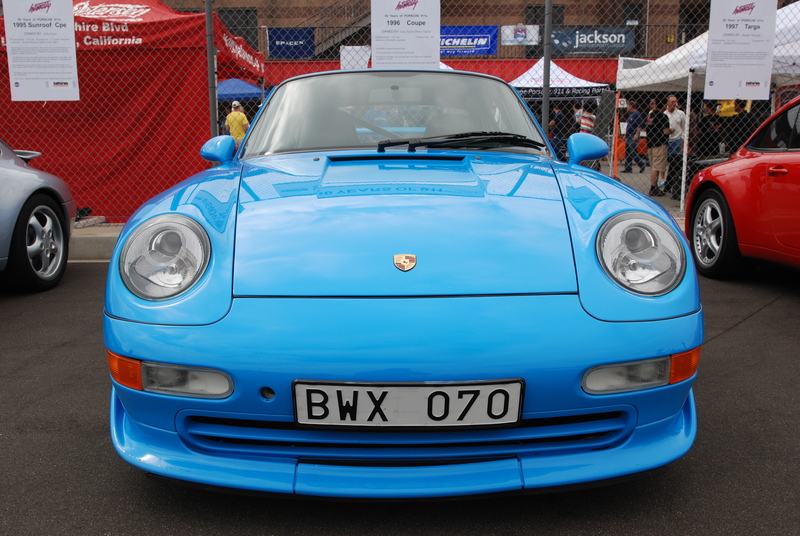 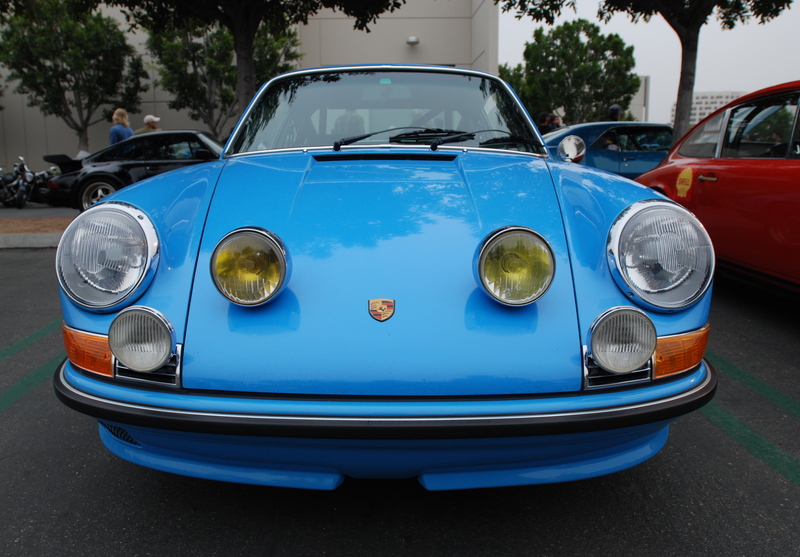 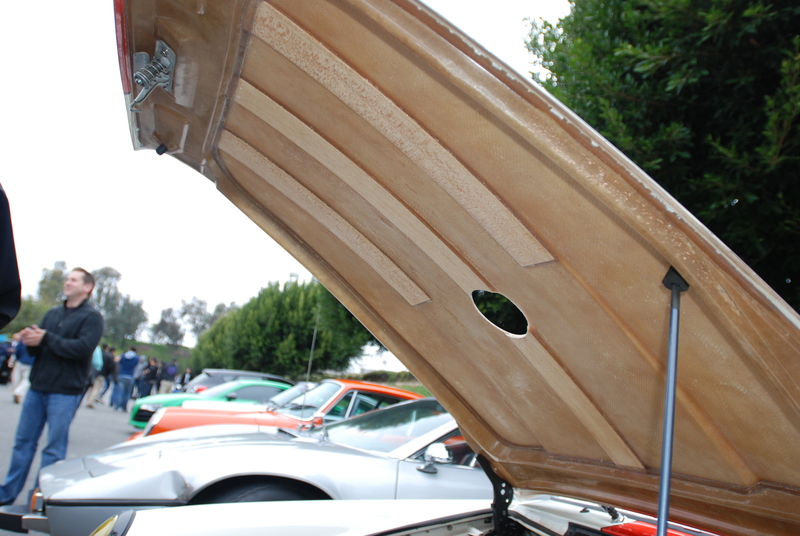 Even the rear portion of the hood mounted, fog lights housings were painted to match the pastel blue body color. 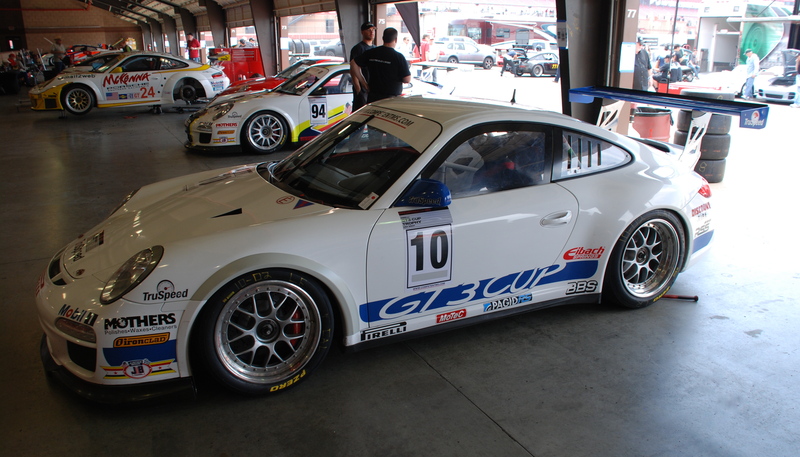 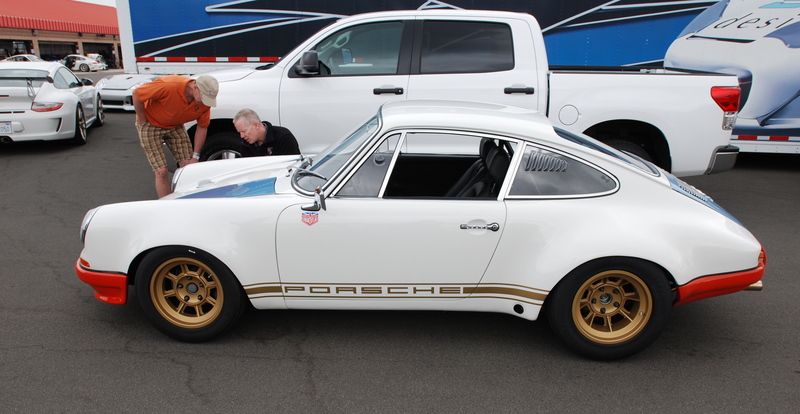 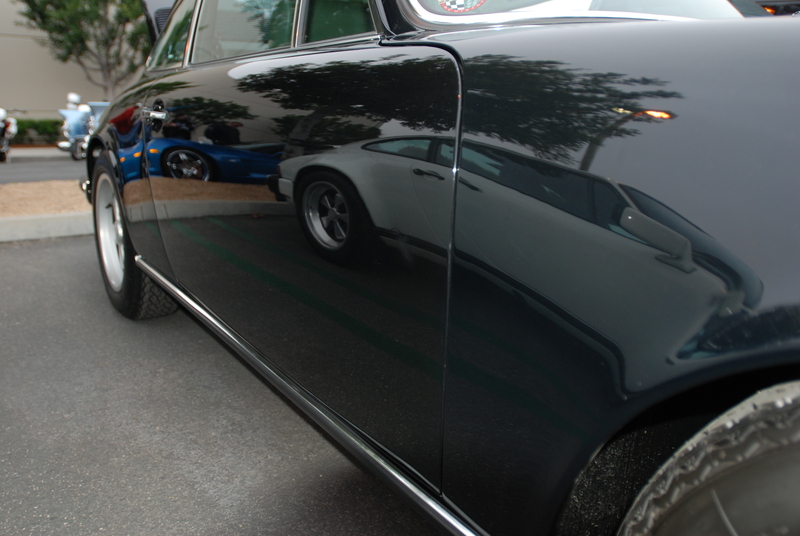 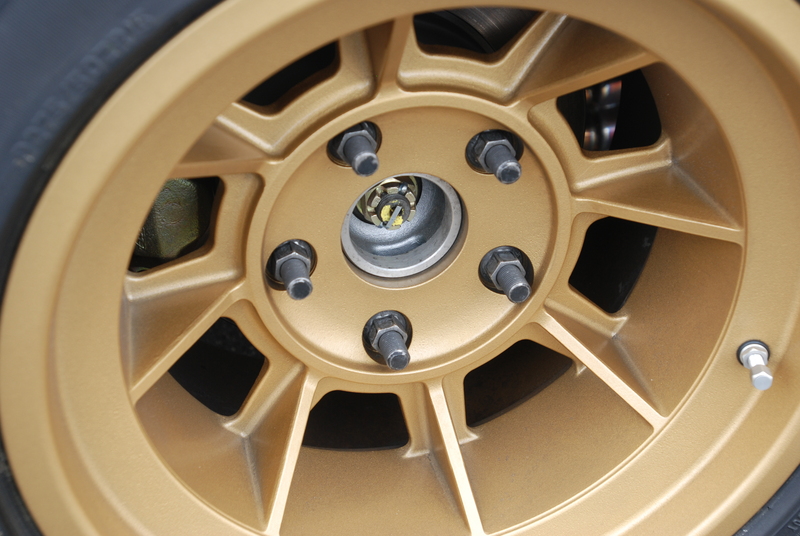 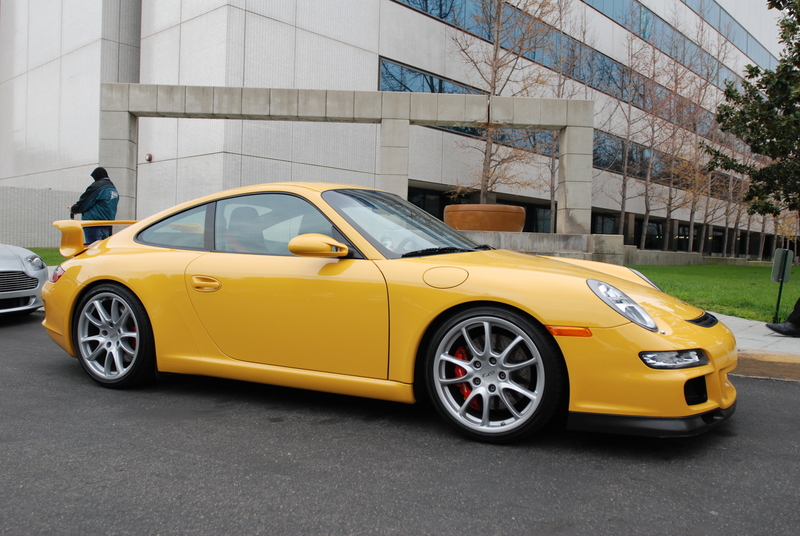 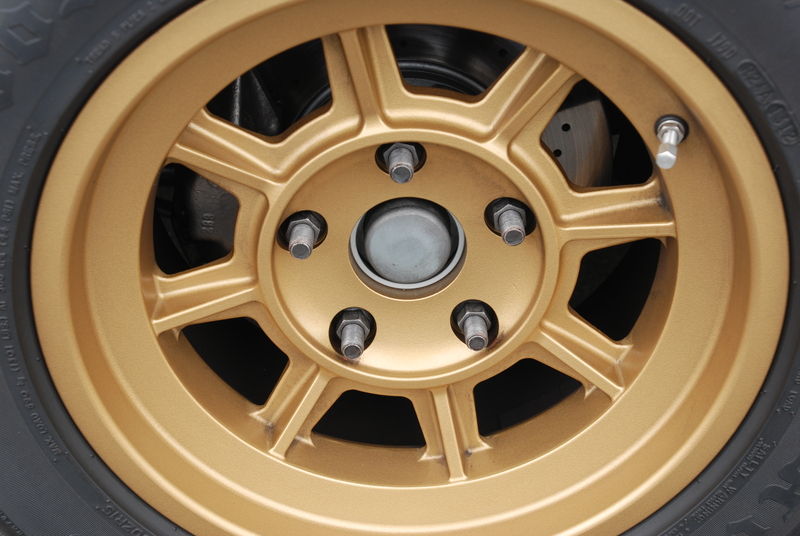 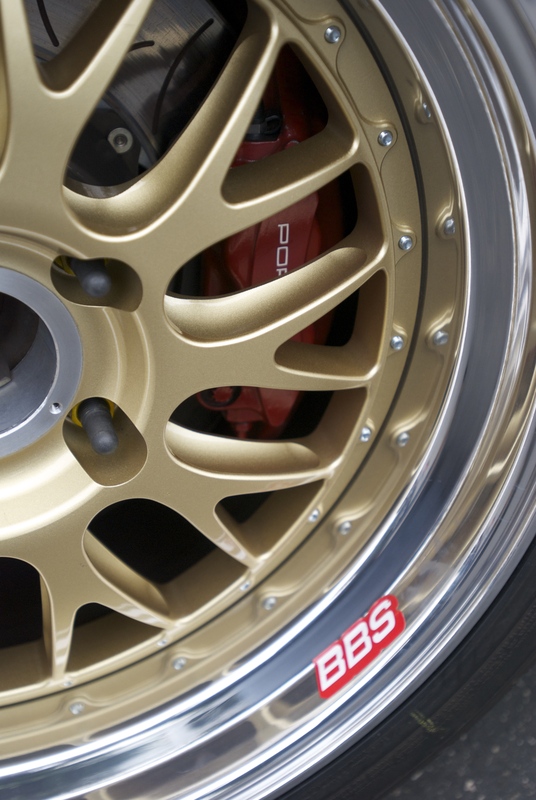 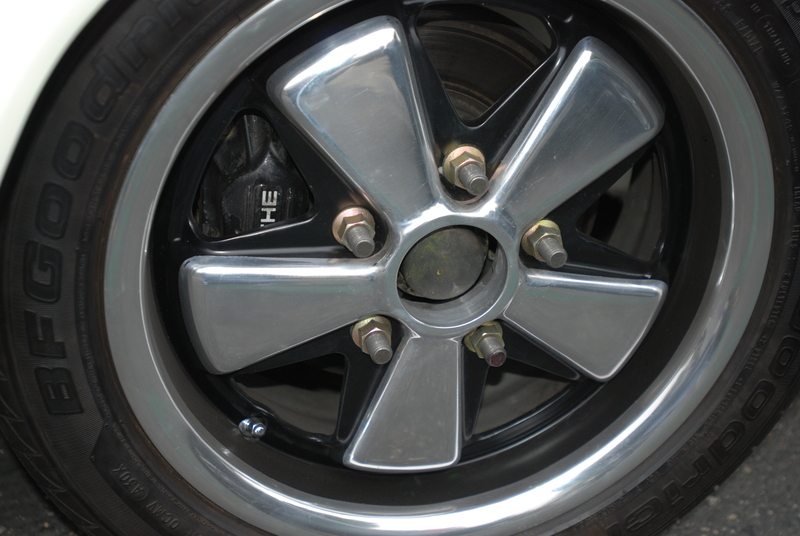 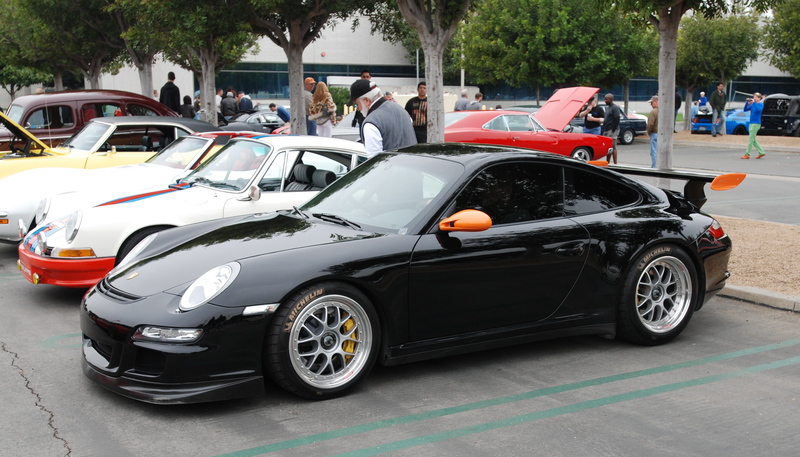 The stock appearing wheels were also modified; billet centers were created to mimic the look of the original, base level steel wheels Porsche offered during the late 1960’s and early 1970’s. 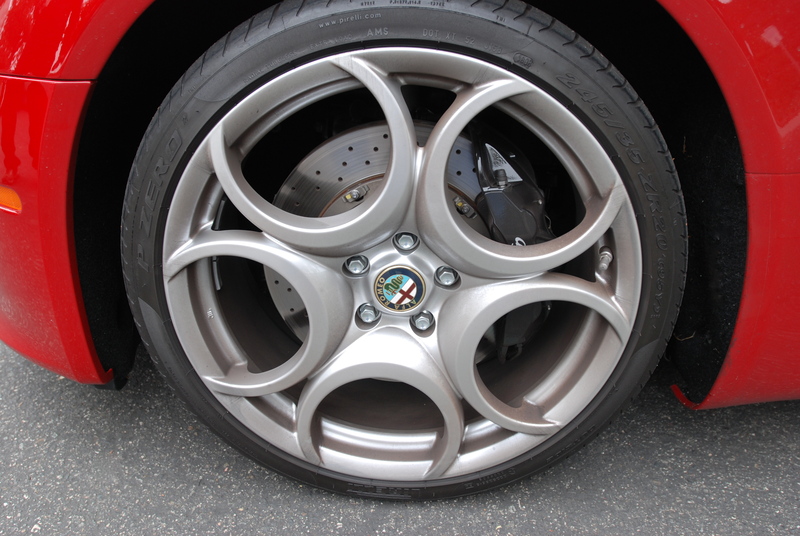 However, these new wheels were designed with sufficient backspacing to not only accommodate the larger than stock brake calipers and wider tires, but eliminated the need for the owner to alter the stock fenders in order to run the new wider wheels and tires. 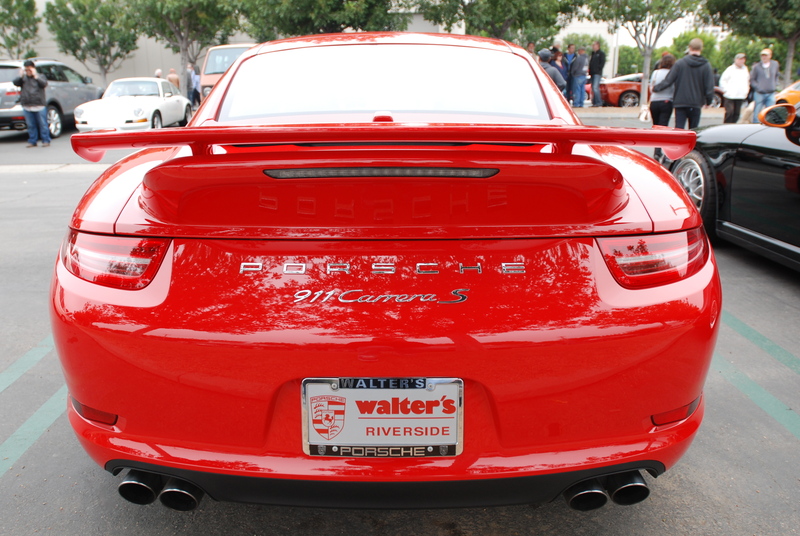 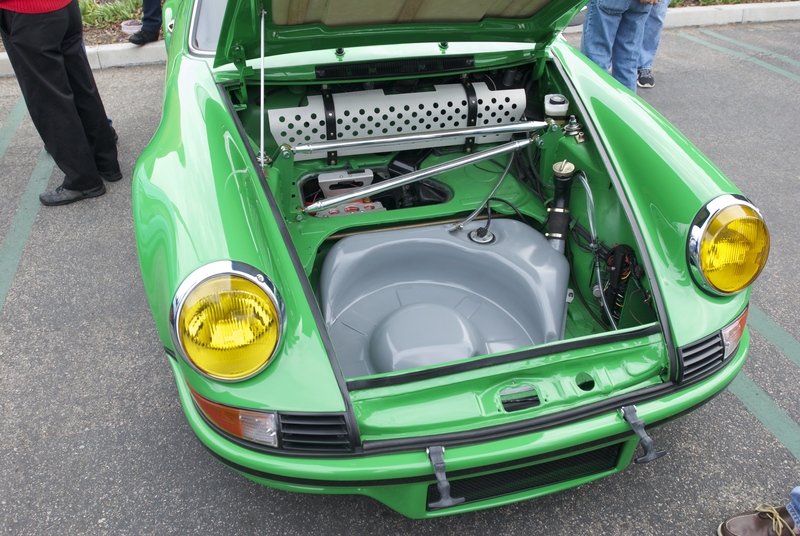 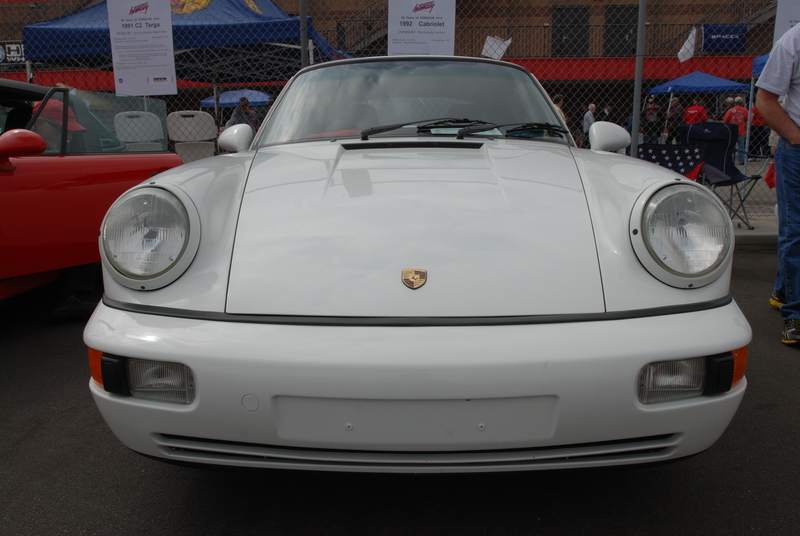 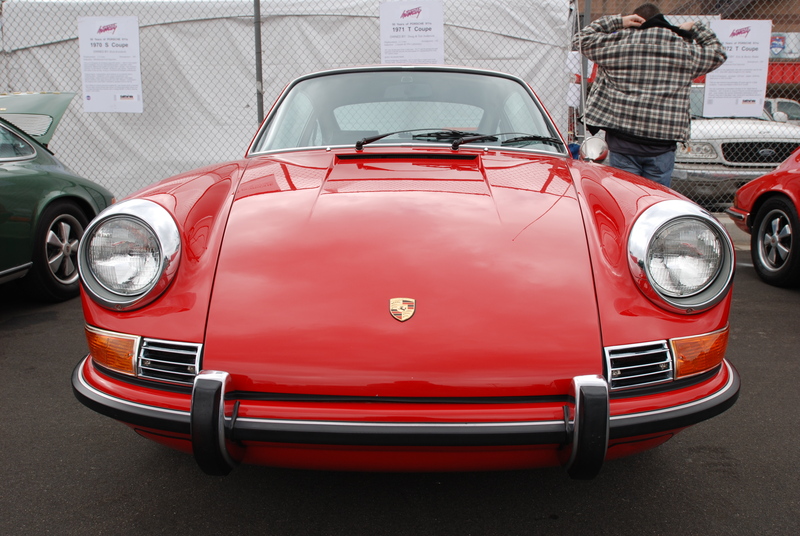 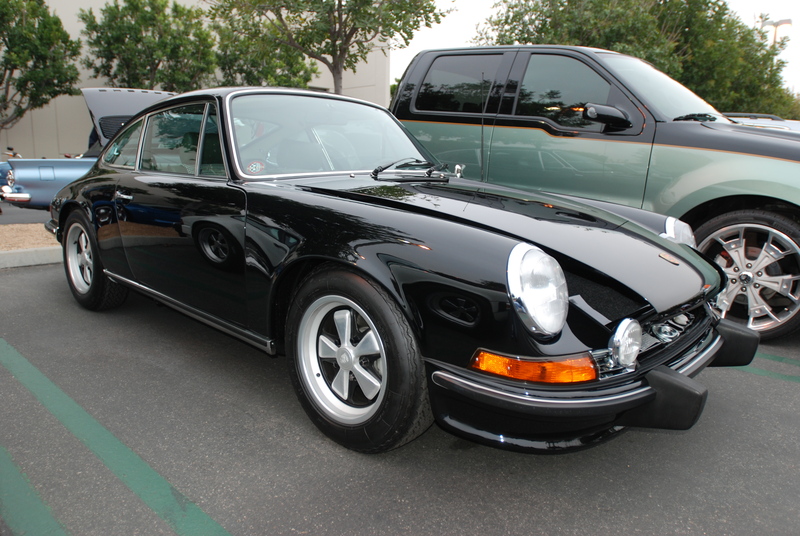 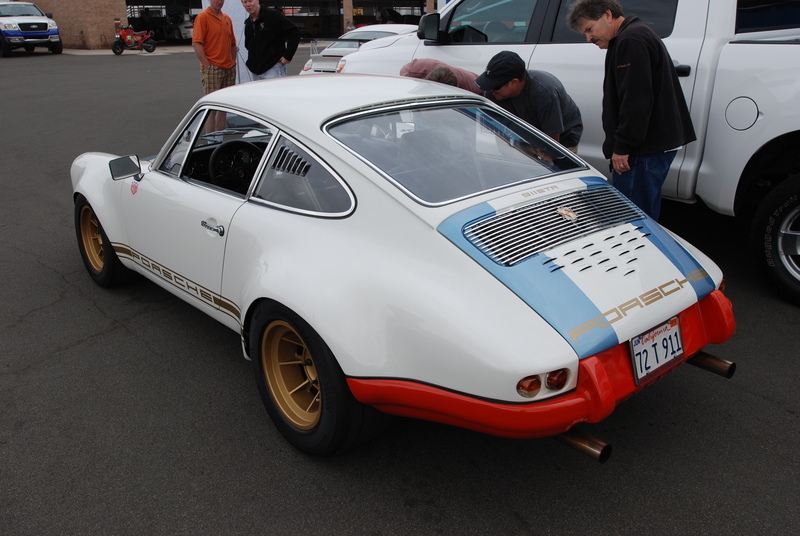 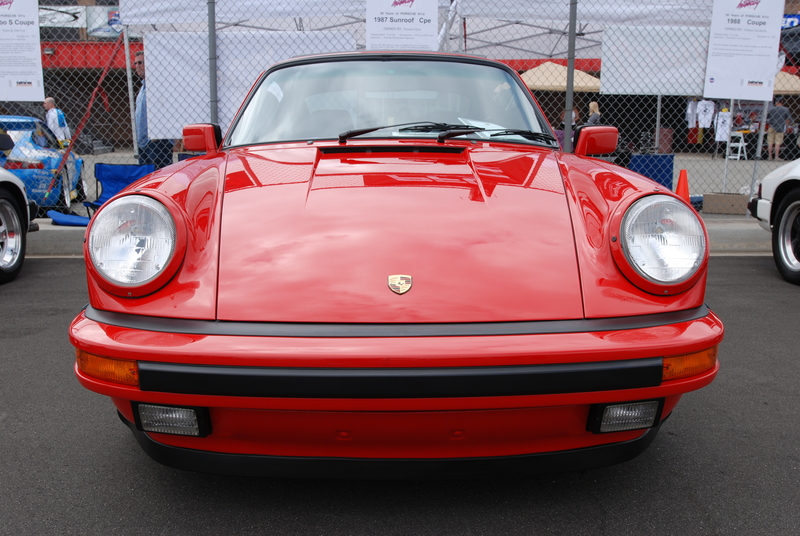 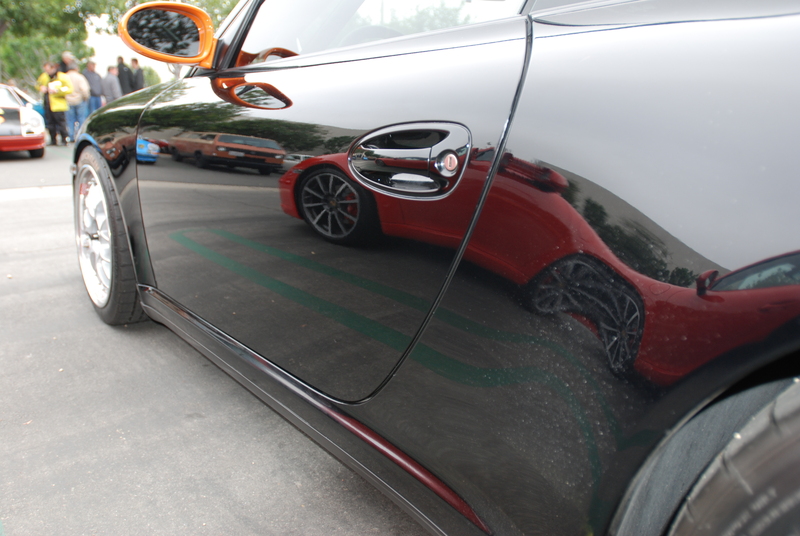 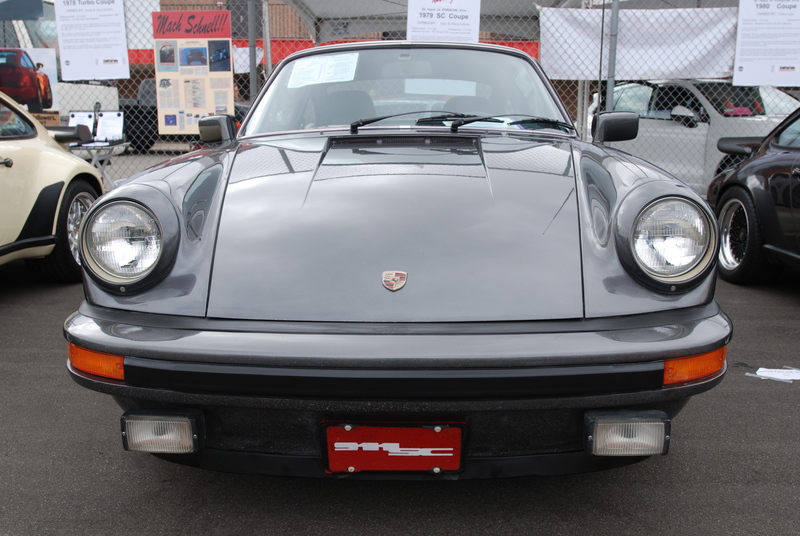 Even the 2.4 liter 911E spec motor out back was spotless and appeared showroom fresh, with the underside of the rear deck lid revealing the drive mechanism and housing with its mounting bracket for the rarely seen, factory optional rear window wiper. 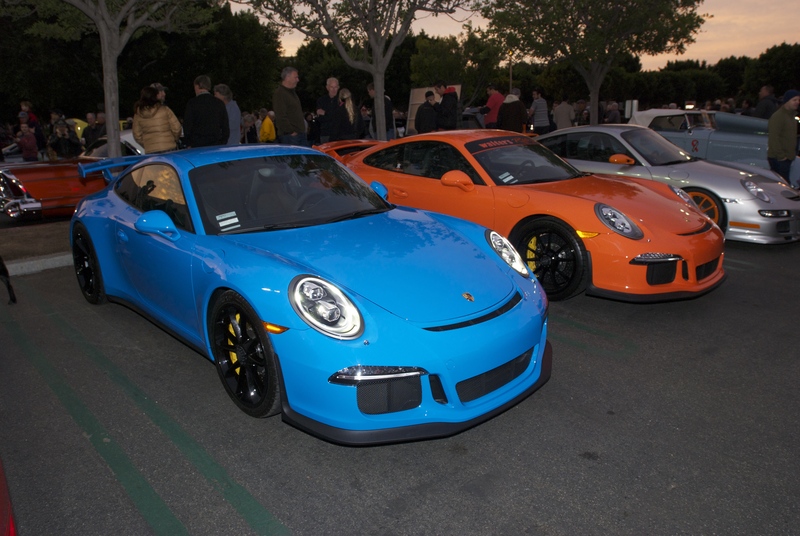 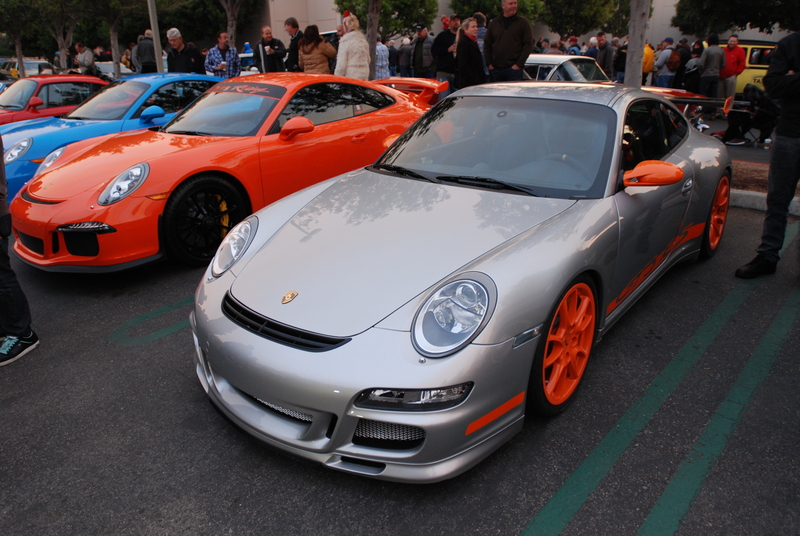 Parked perpendicular to Porsche row, was another trio of fresh faces to cars&coffee; a viper green Audi R8, a silver Porsche 911 Carrera, and an orange Porsche 911 Carrera RS recreation. 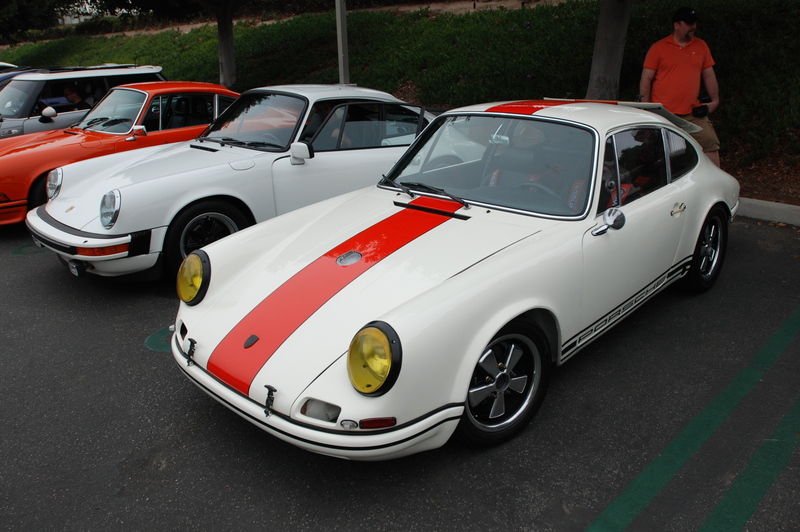 What’s so cool about this 911R tribute, is that the owner used one of Porsches original 911R’s as the blueprint for building and detailing this car. 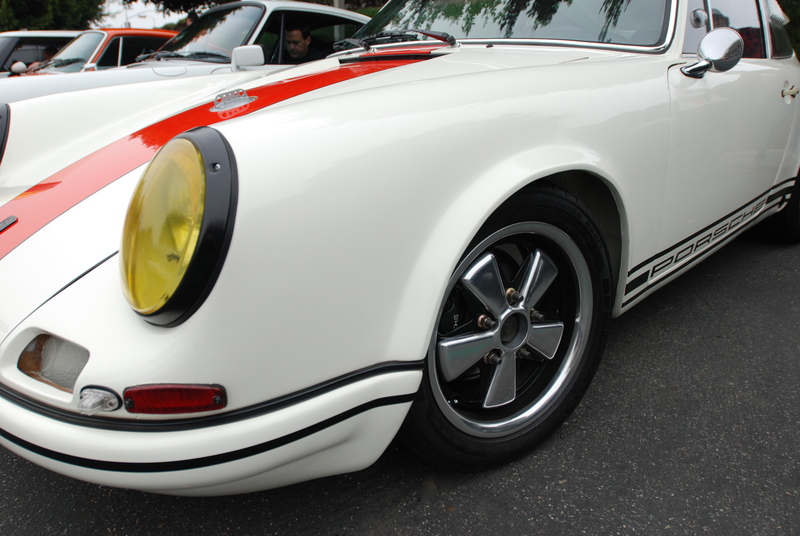 Even more impressive is that the owner produced all of the fiberglass parts himself; from the front fenders with their 911R specific flare (below), to the front hood, rear decklid, rear tail light lenses, and all of the fiberglass shrouding found on the motor. 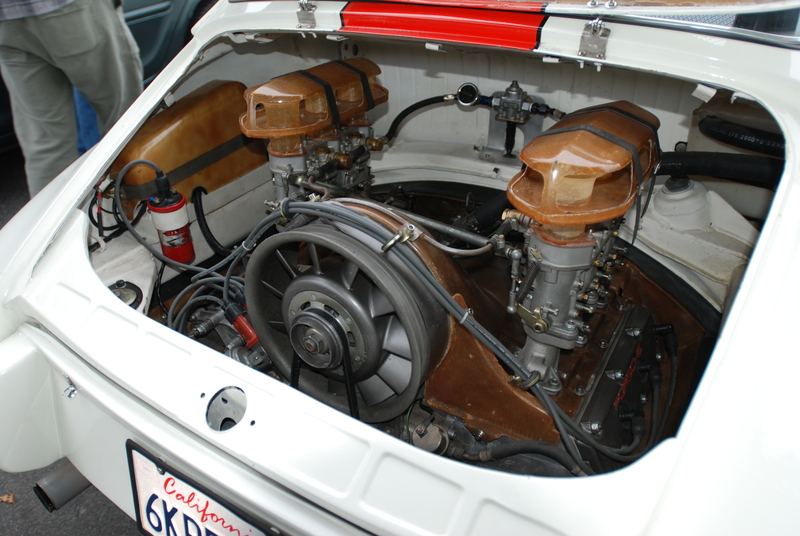 He even designed the water shields with integral carburetor venturi, lower heat shields, as well as the housing to protect the electronics within in the engine compartment. 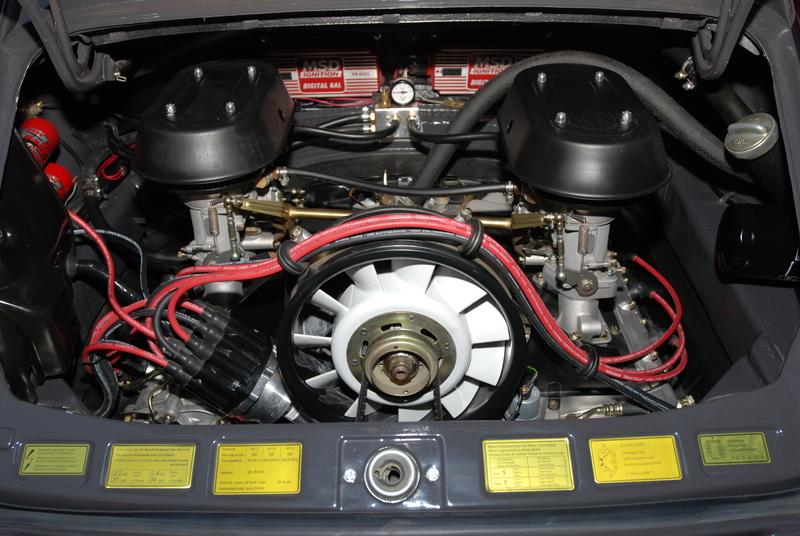 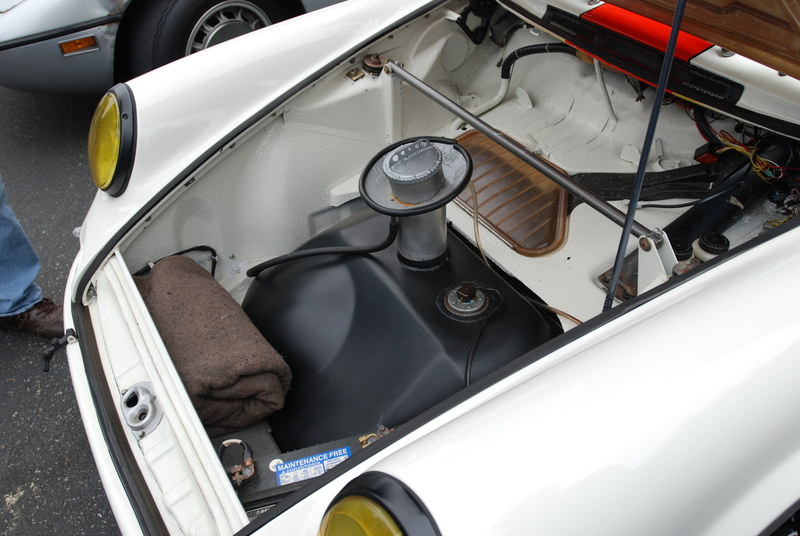 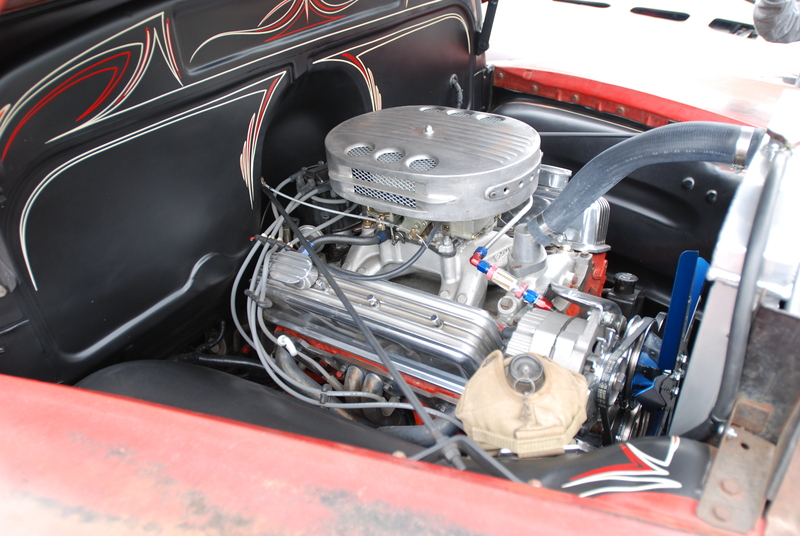 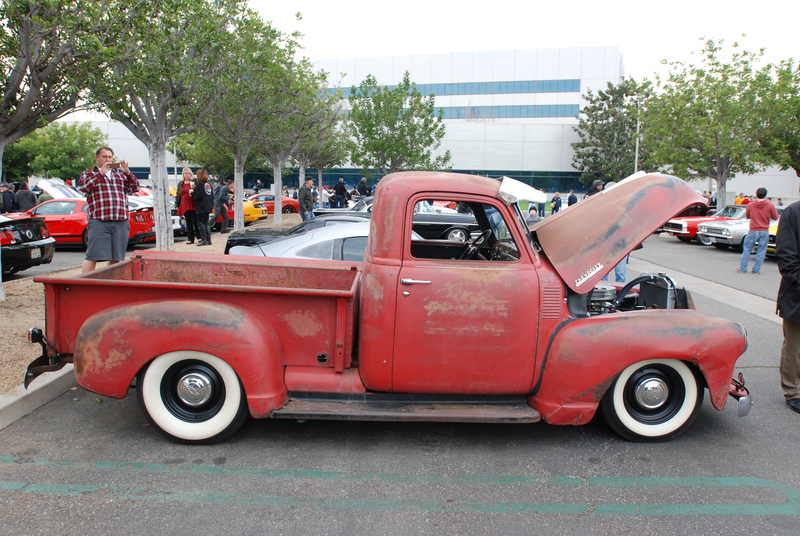 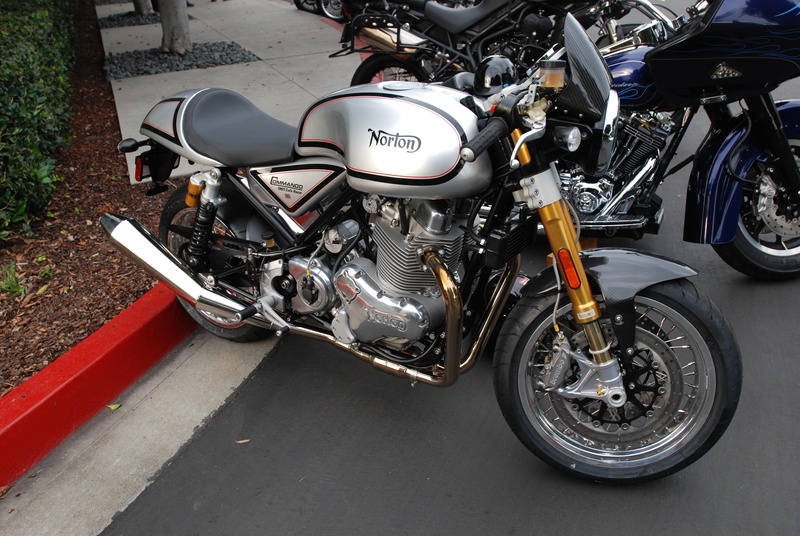 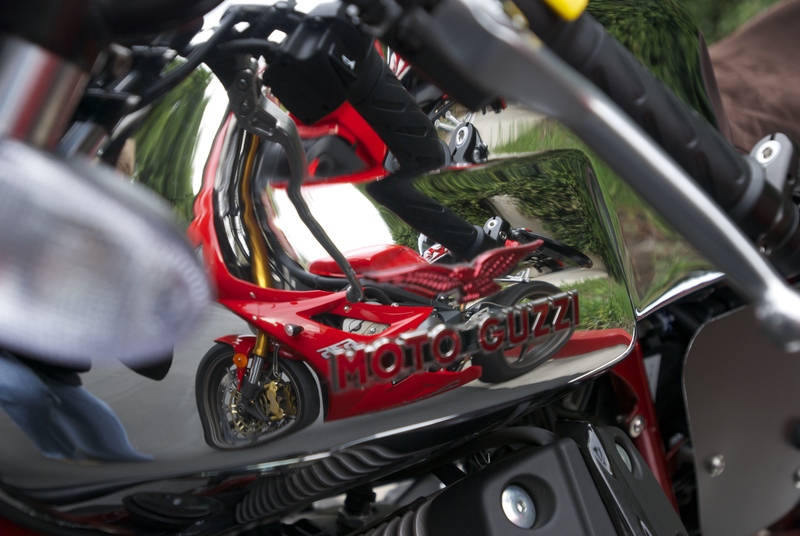 Even the front trunk received the R treatment, with a fiberglass lid created for the smugglers box, and the inclusion of a custom fabricated, steel 100 liter fuel tank, incorporating a center fuel filler with gasketed collar and drain, race inspired gas cap, and a period correct strut bar. 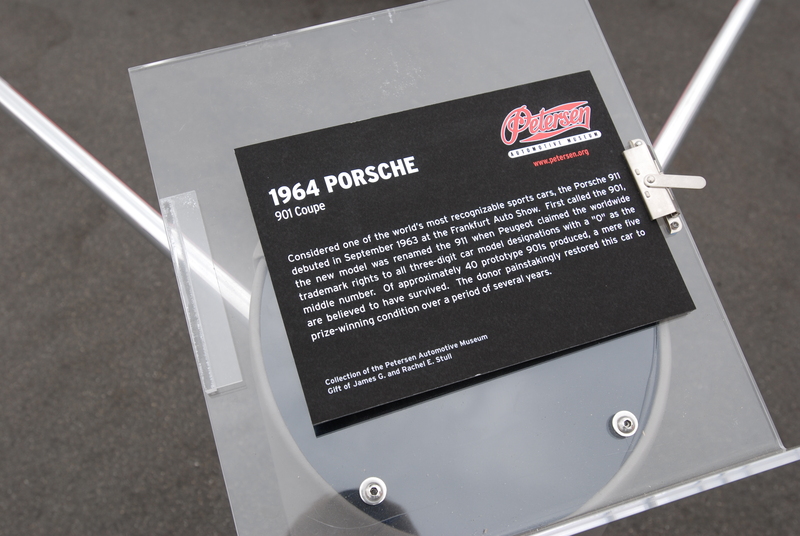 More of the owners handiwork; the fiberglass motor / fan shroud, the carburetor venturi/water shields and lower heat shields, as well as the protective cover for the electronics; all eye candy for the 3.0 liter, high horsepower Porsche boxer six motor. 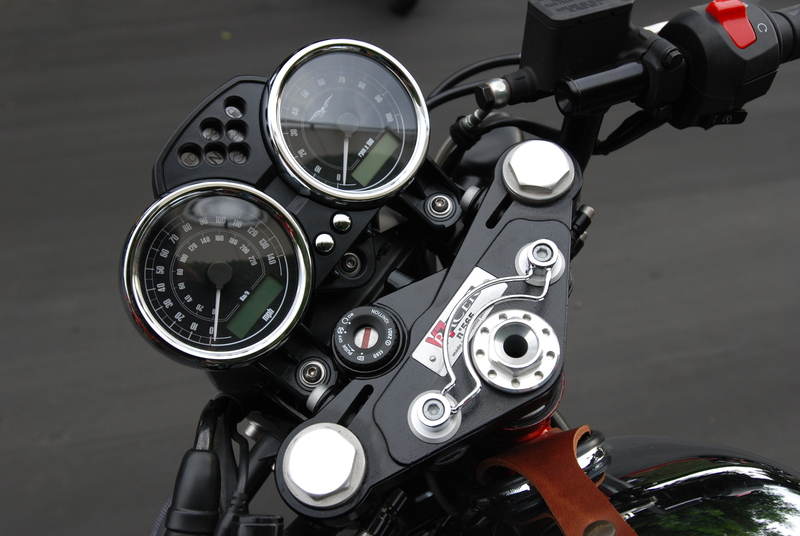 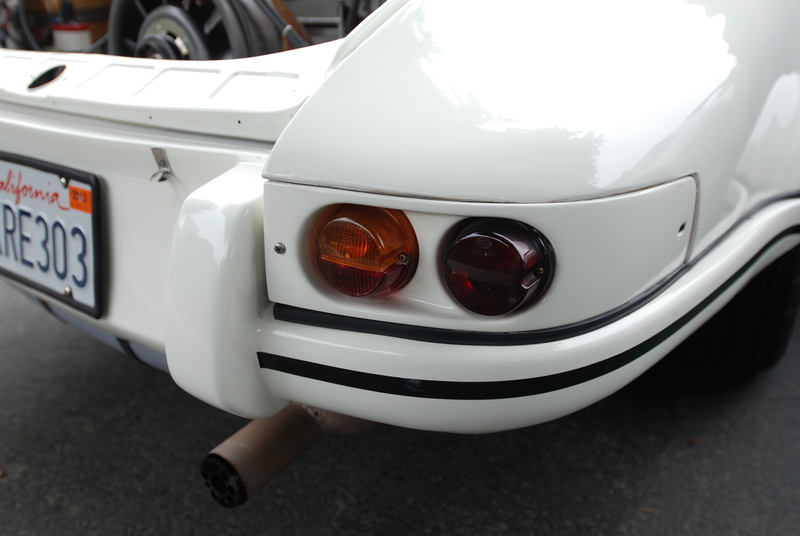 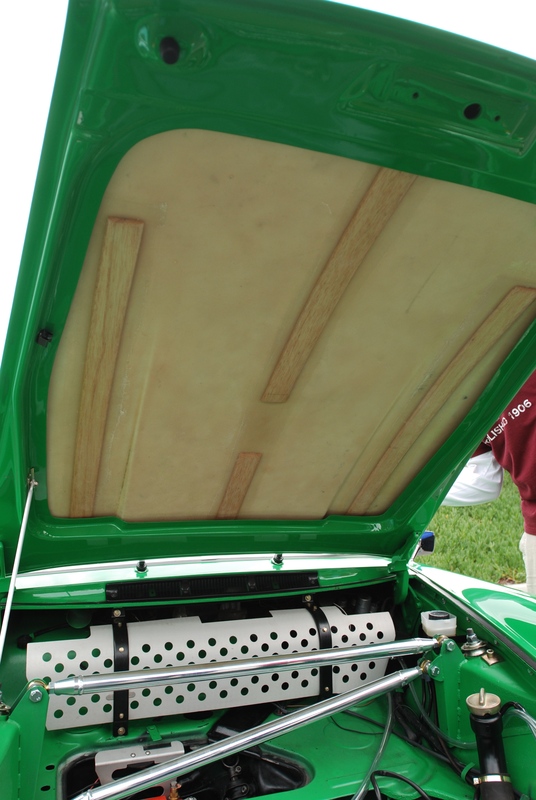 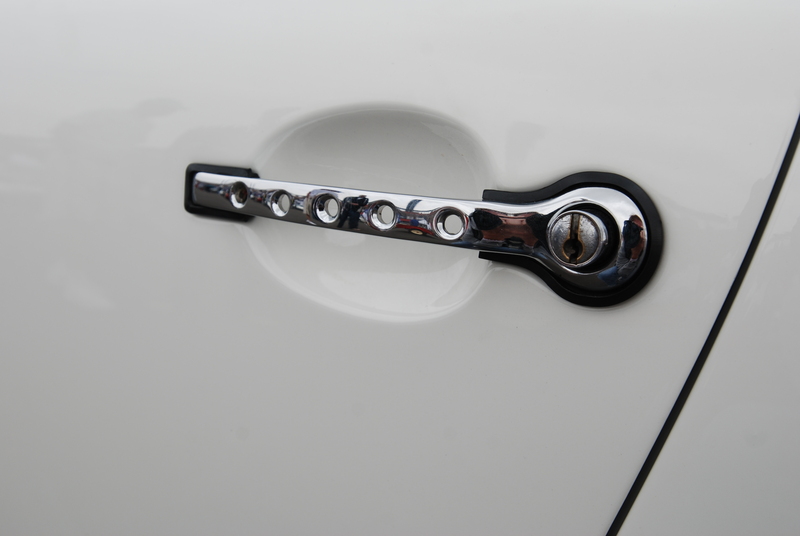 Even the rear license panel with integral bumpers and the under fender extensions were produced in fiberglass by the owner. 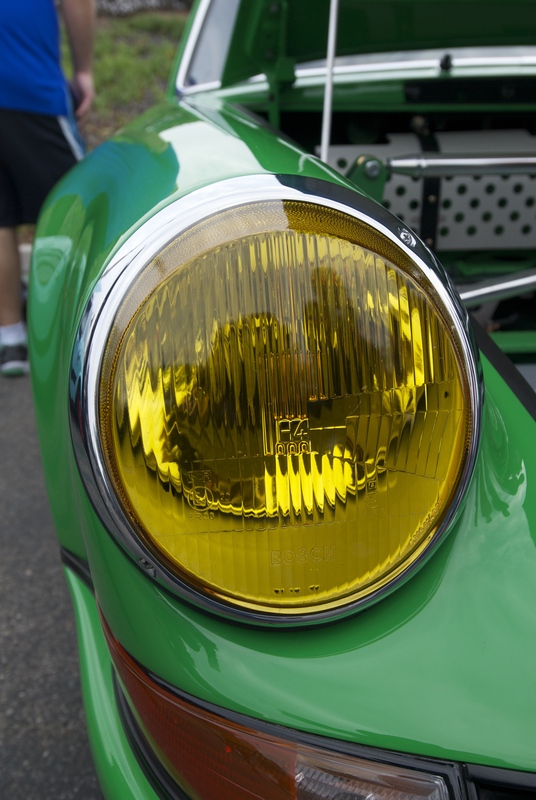 And instead of simply purchasing a set of the 911R inspired rear tail light assemblies, he decided to create his own colored lenses. 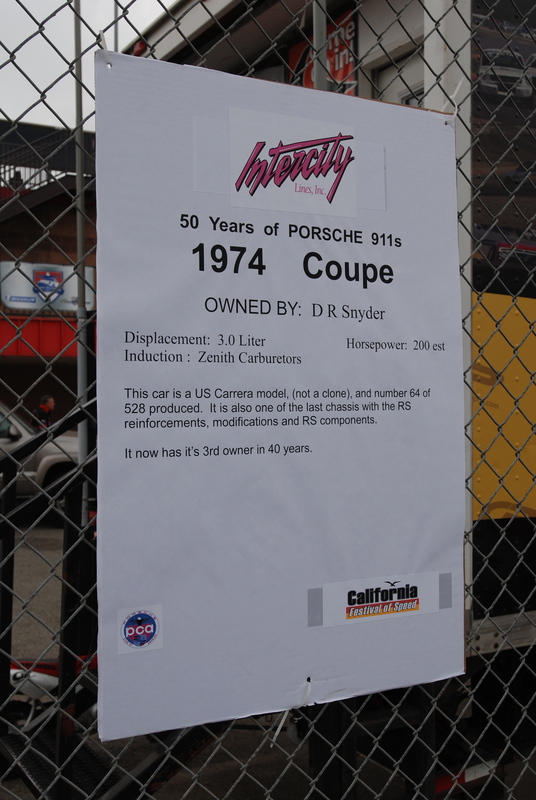 (For additional photos and information regarding this car, please use this link to access one of my recent posts). 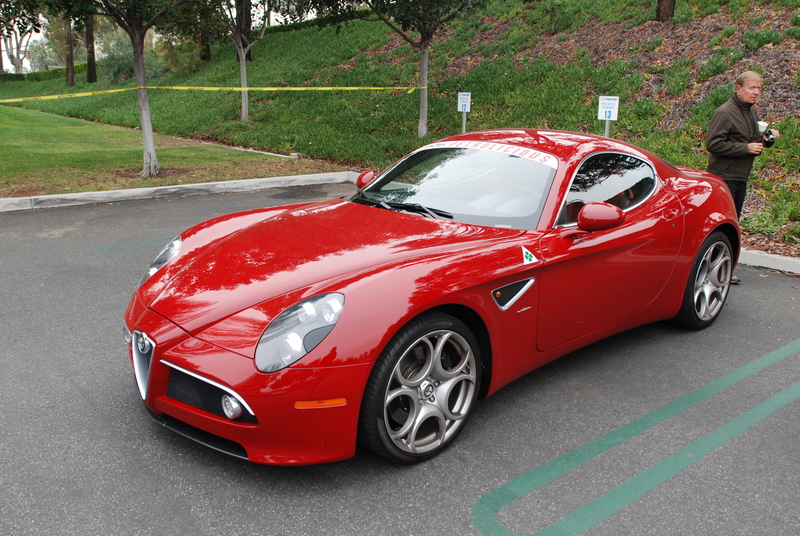 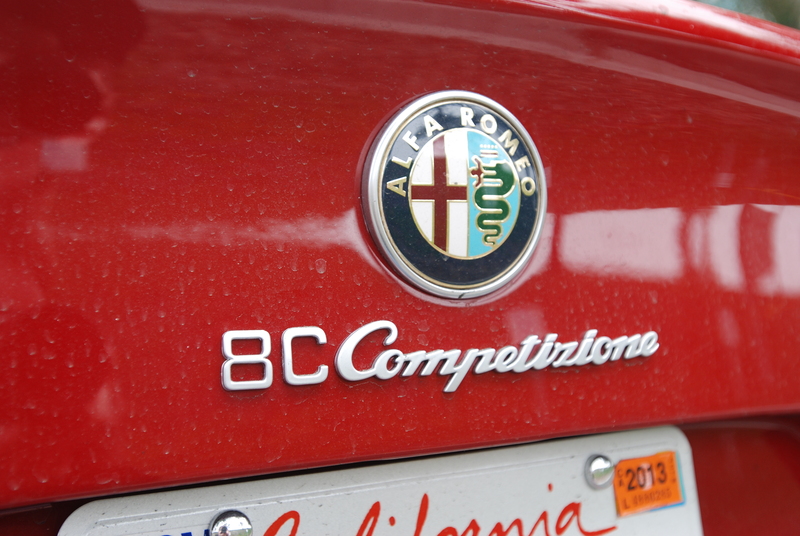 By now the crowds had begun to thin, so as I was heading back to my car, I was intercepted by a friend who asked what I thought of the red Alfa Romeo 8C Competizione? 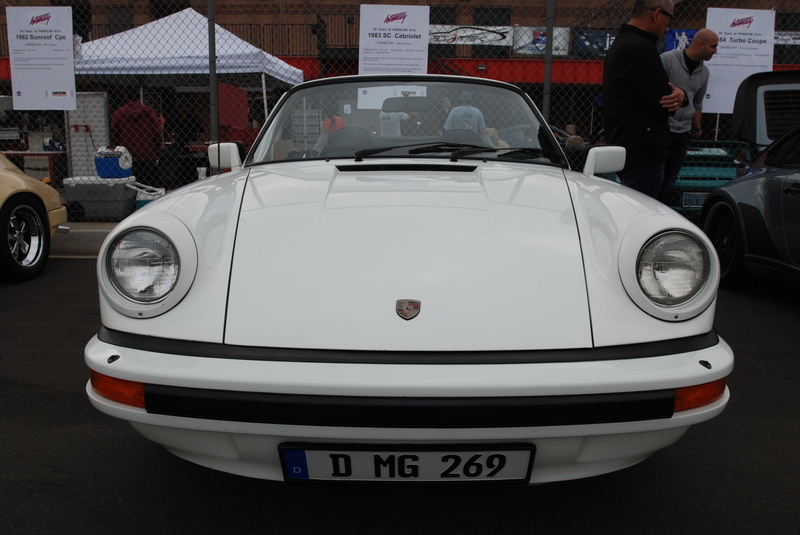 I told him that I had not seen the car and asked where it was parked. 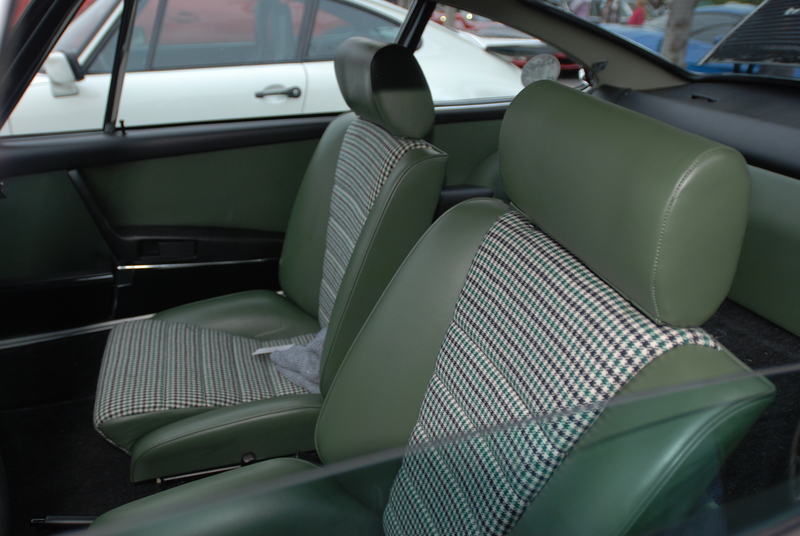 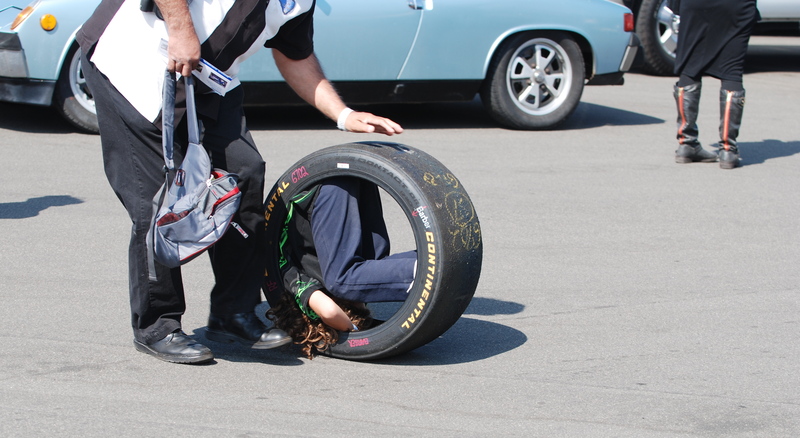 It turned out the car had been hidden away, out on the very last row, in the back corner. 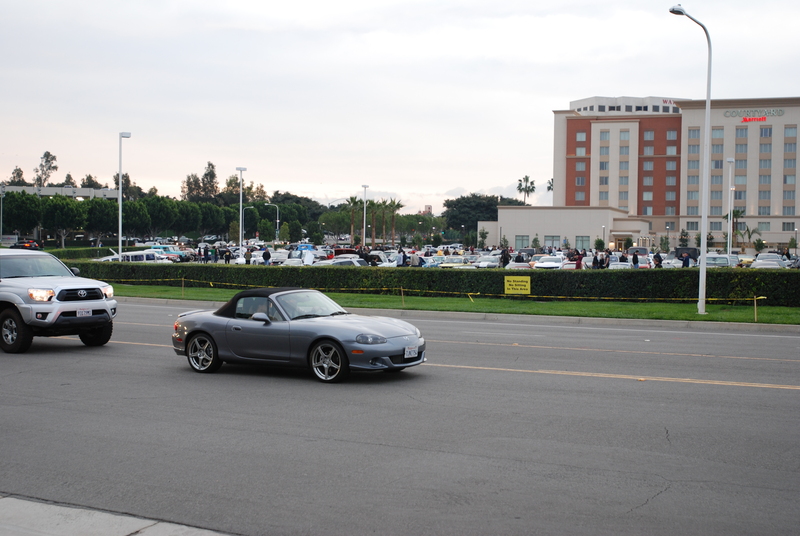 So after thanking him for the information, I hurried off to see if the car was still there. 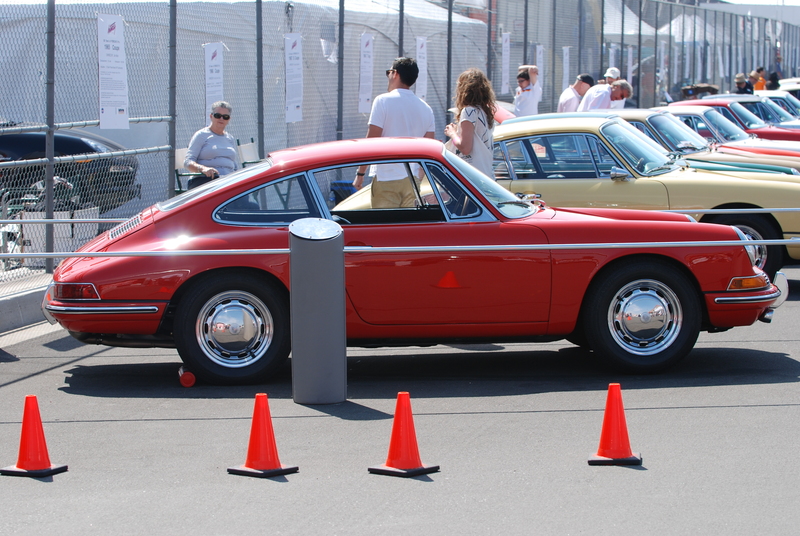 Fortunately, as I approached the block wall that divides the rear parking area from the loading dock, I could see what appeared to be a lone, red Alfa Romeo still drawing interested parties. 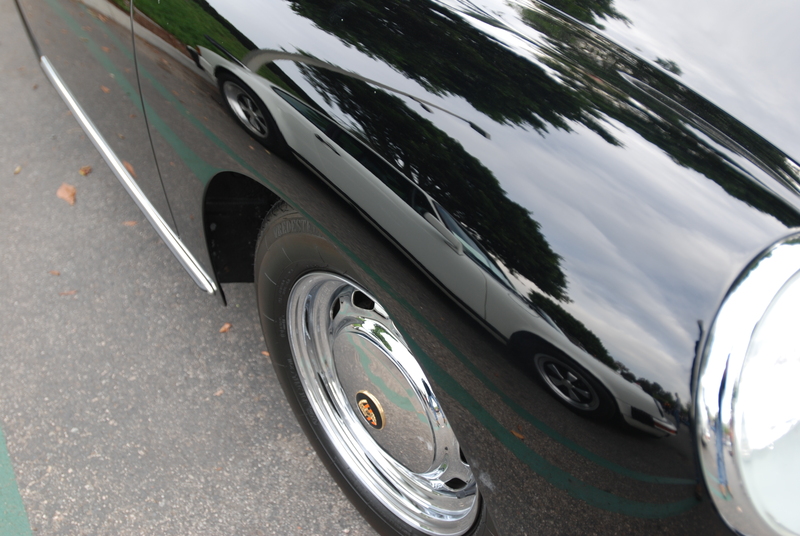 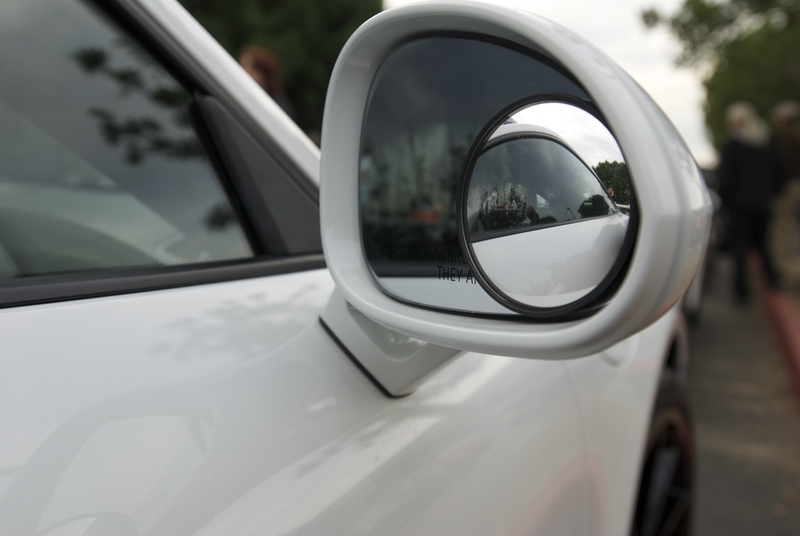 As I began photographing the car, the owner who was standing off to the side, shared some of the back story of his car with those of us present. 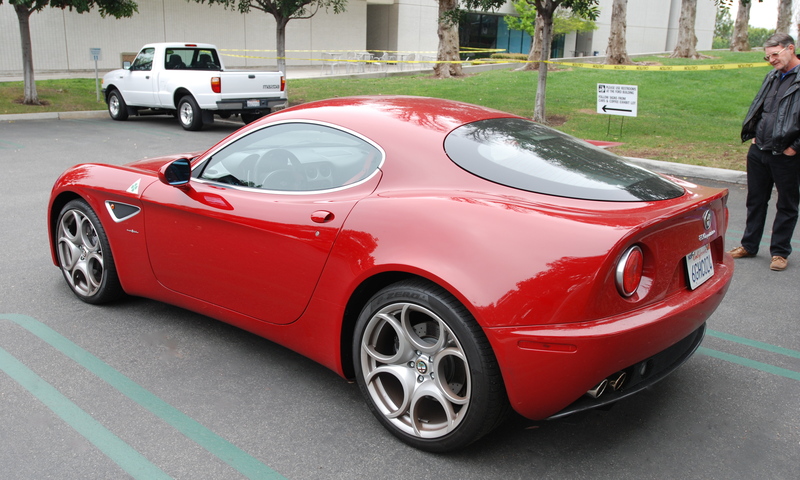 We learned that the coupe version of the 8C was built between 2007 and 2009 for a global market, with the first american market vehicles being imported in 2008, carrying a sticker price of $259,000 for the coupe, and roughly $300,000 for the roadster version. 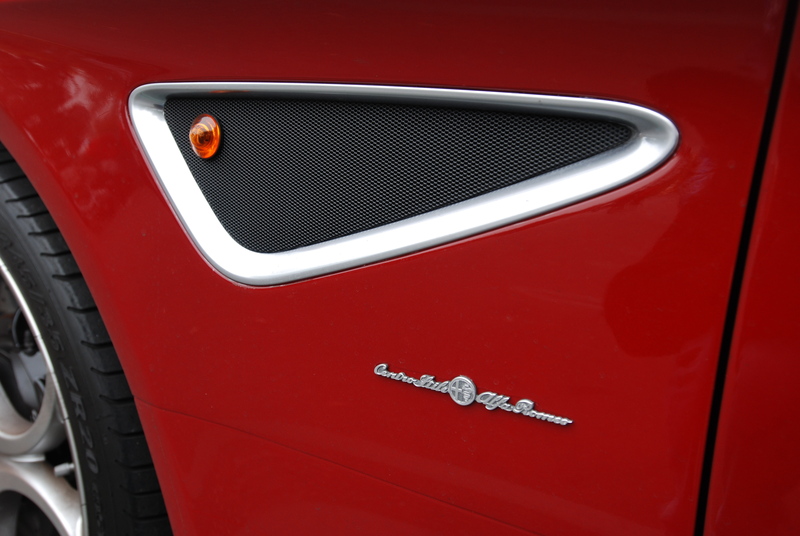 During the 2 plus years of production, only 500 examples of the 8C were produced. 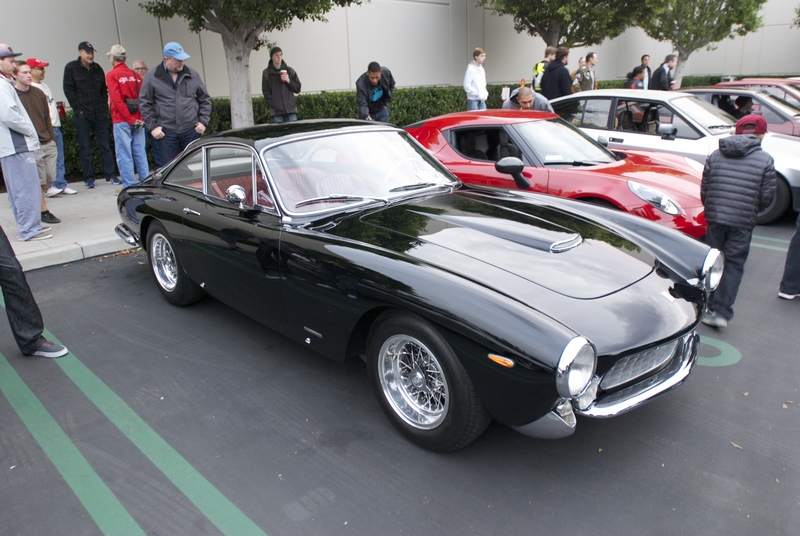 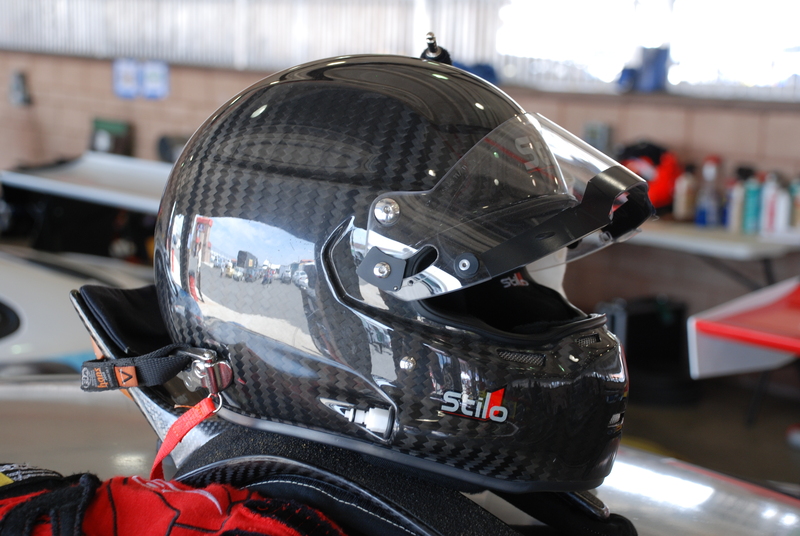 We also learned that the body shell was made of carbon fiber, and then mated to a steel chassis, with final assembly taking place at the Maserati factory in Modena, Italy. 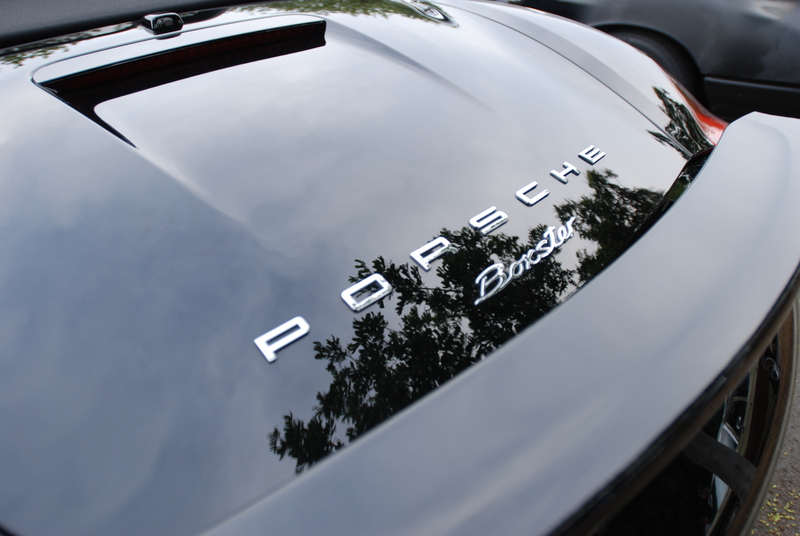 Power comes from a 444 horsepower, 4.7 liter V8, assembled by the folks at Ferrari, with the drive transferred to the rear wheels via a six speed transaxle gearbox , actuated by paddle shifters mounted behind the steering wheel. 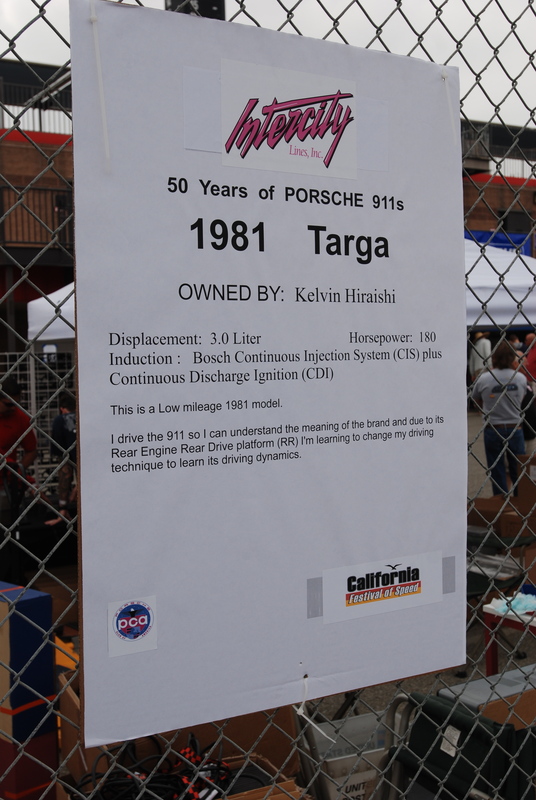 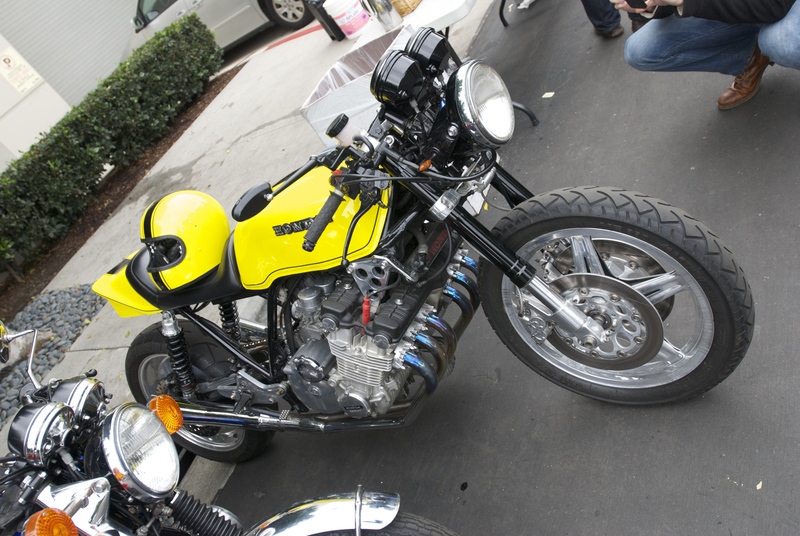 Also included within the drivetrain was a limited slip differential.